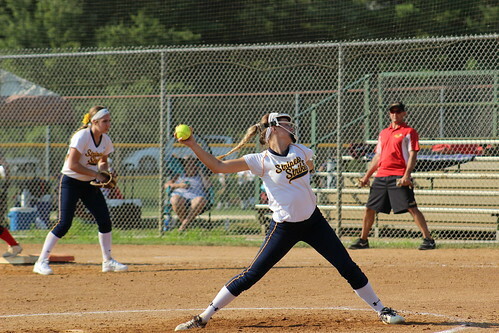 Opening Ceremonies will be held at Deer Park High School's Abshier Stadium (Tuesday, July 23 at 7 PM/CT). 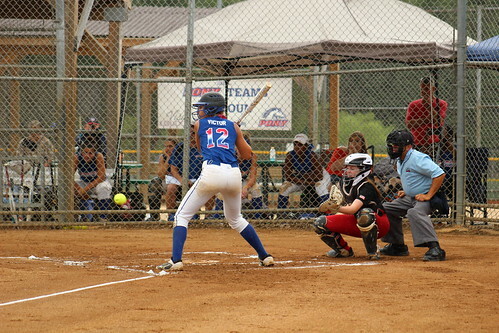 Tournament game schedule will be announced. 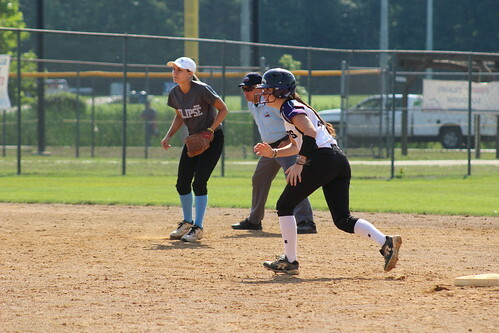 Players will also have the ability to participate in a college showcase Wednesday, July 24. 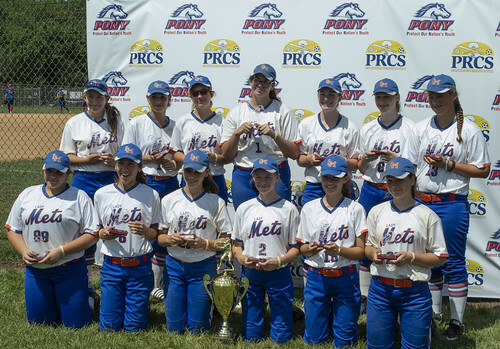 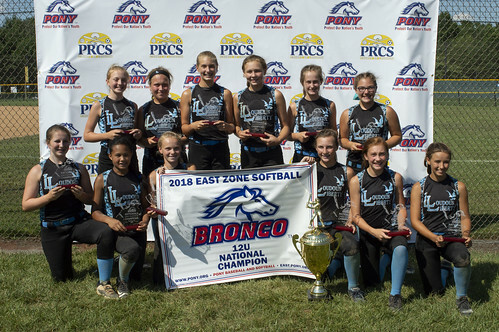 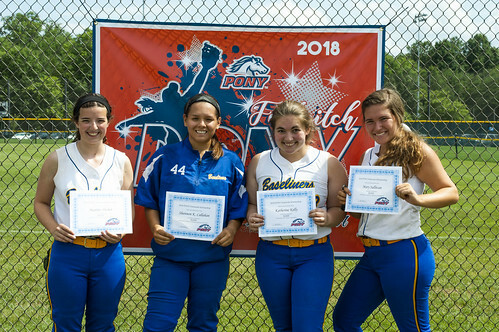 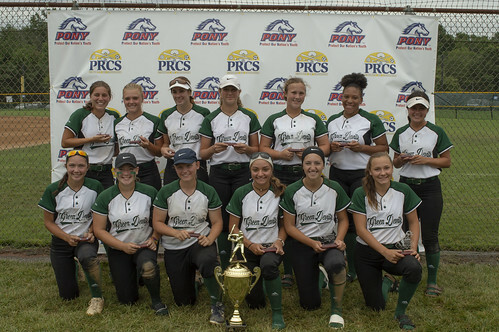 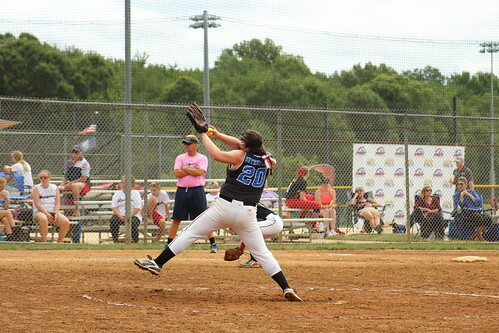 Take a look back at the 2018 PONY East Zone Softball Nationals by browsing the section below. 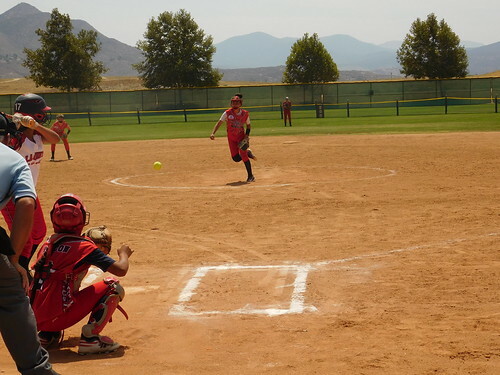 For the complete game schedules, standings and brackets, click here. 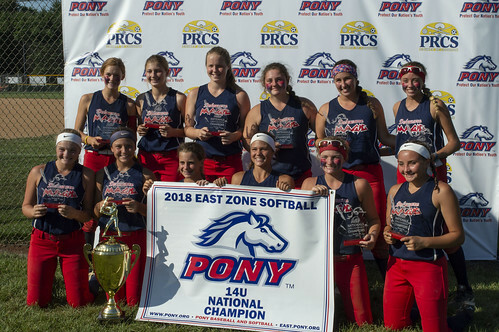 Visit the 2018 PONY East Zone Nationals official website here. 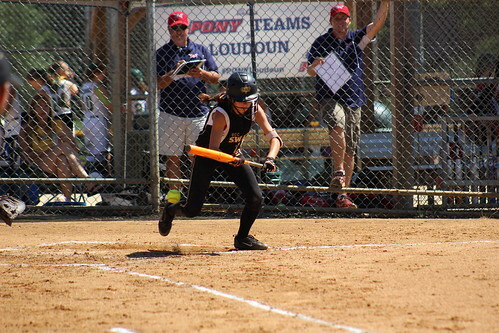 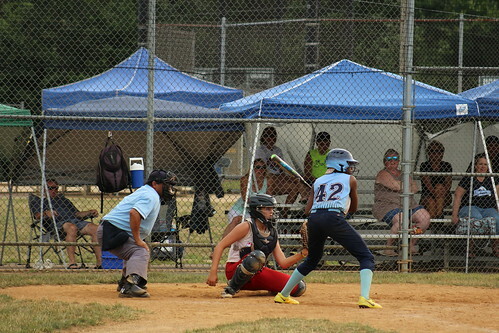 In the Bronco 12U Championship Game, it was the third time that the Loudoun Liberty and Banshee’s 12U Red team faced in the tournament. 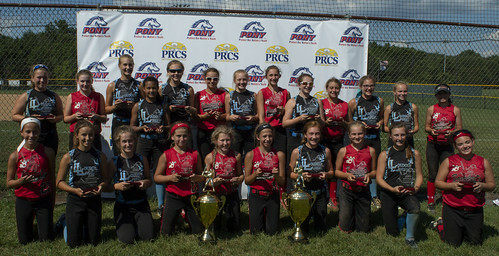 Both teams saved their best for the last game as the Liberty claimed the title with a 4-1 victory. 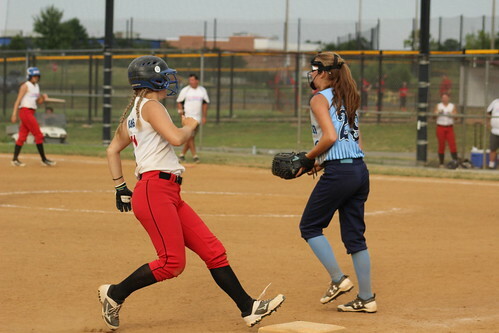 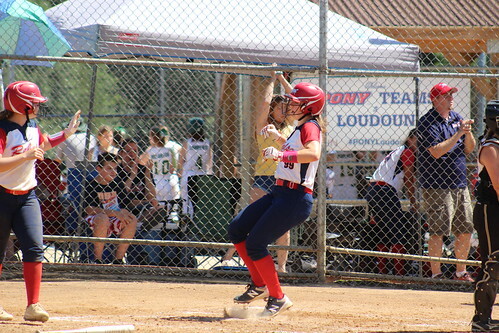 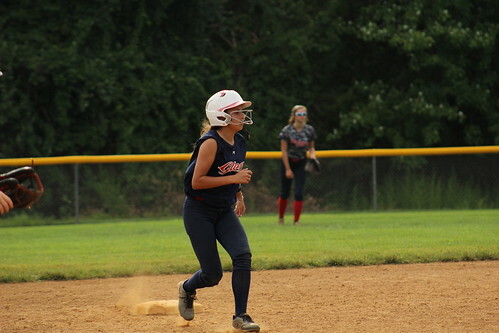 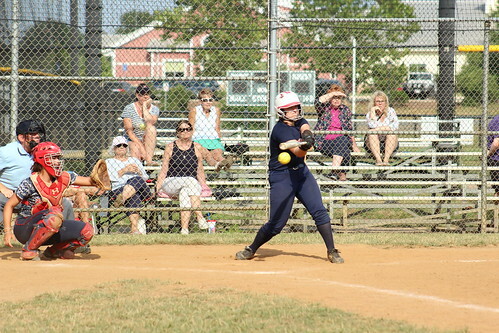 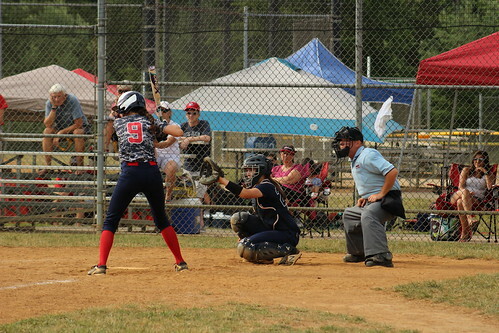 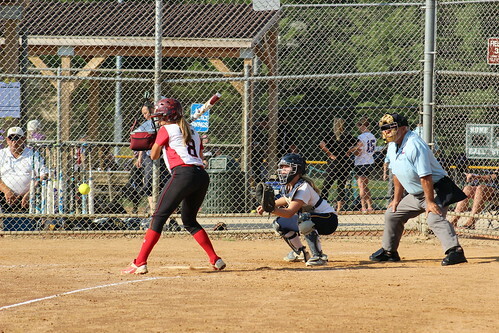 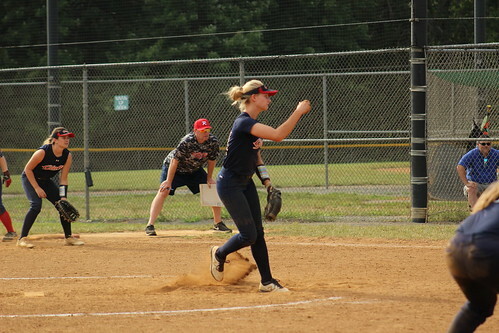 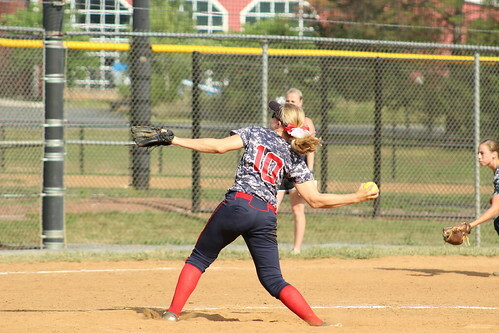 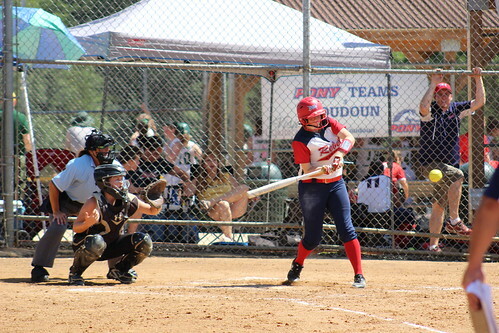 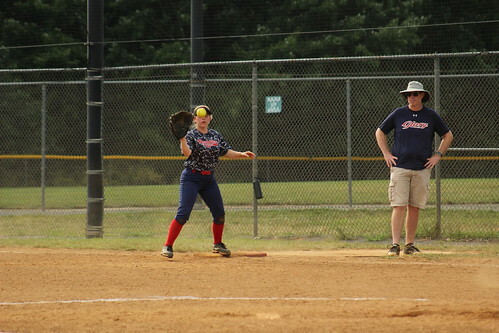 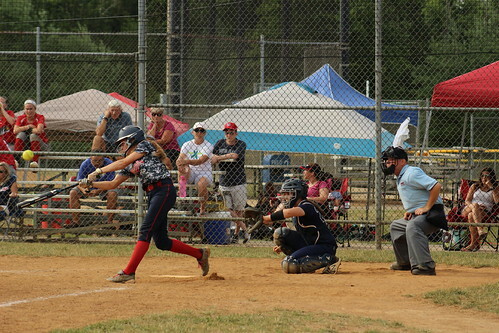 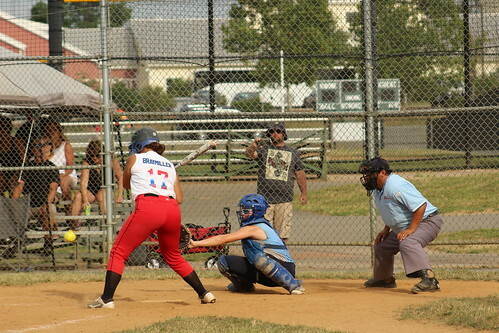 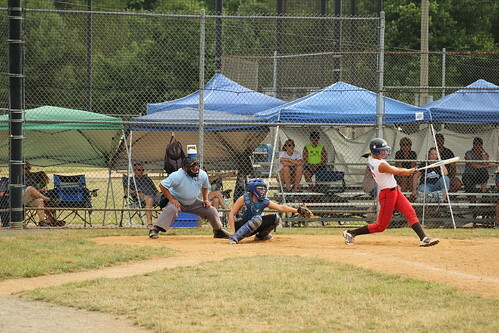 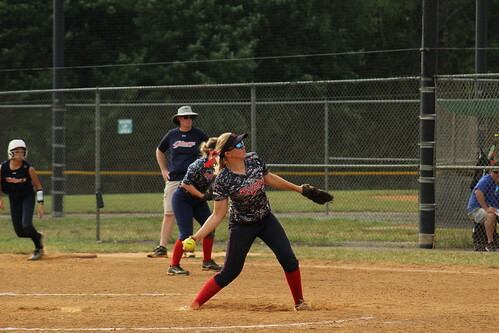 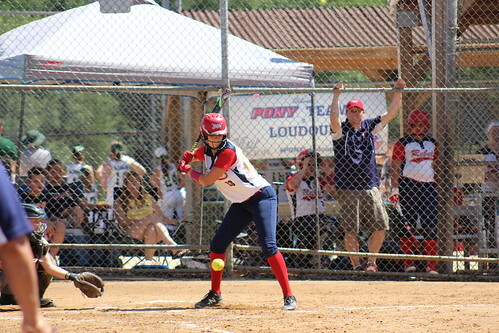 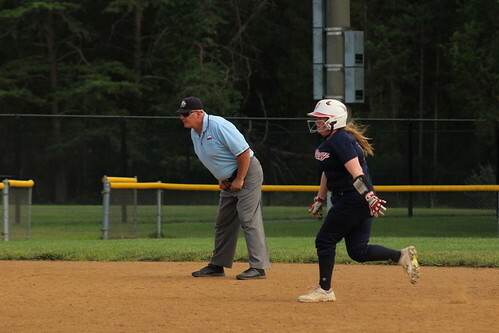 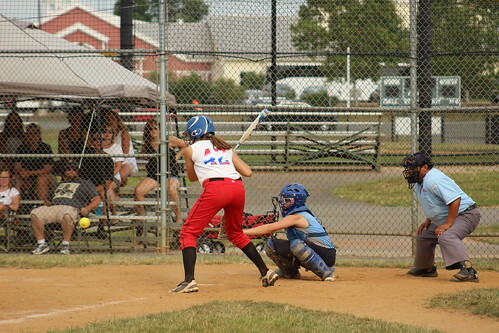 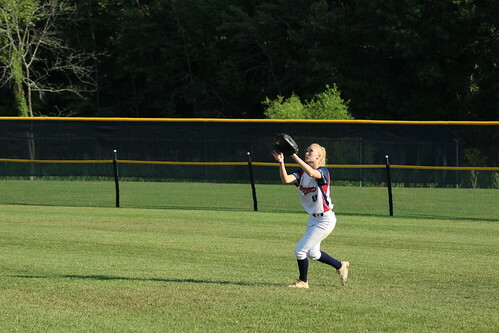 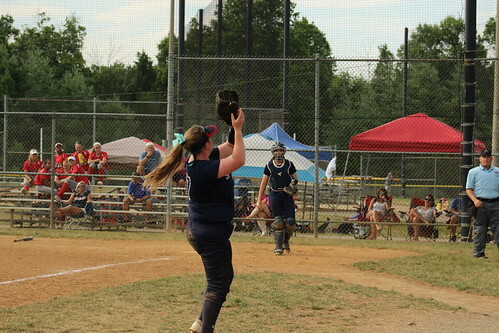 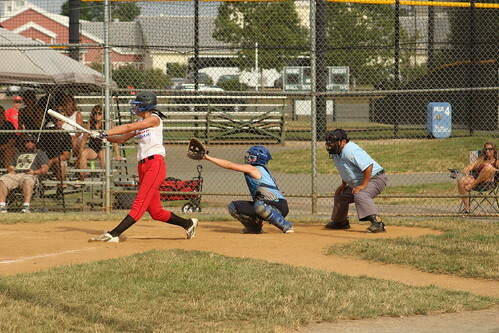 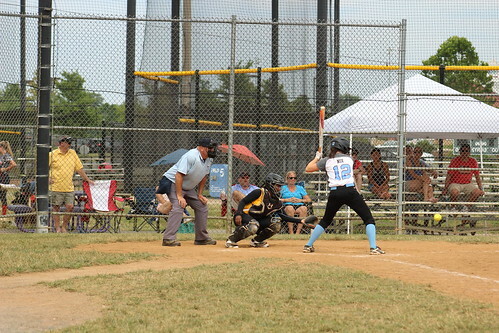 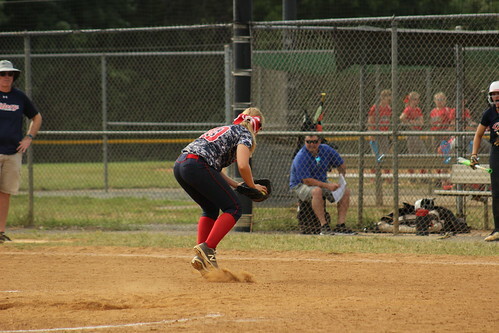 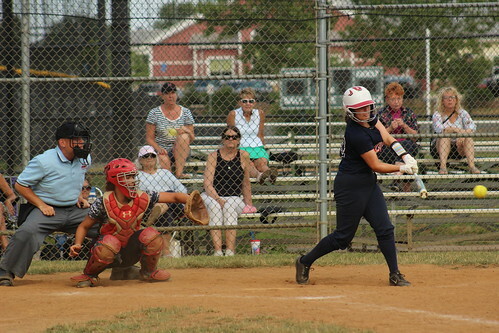 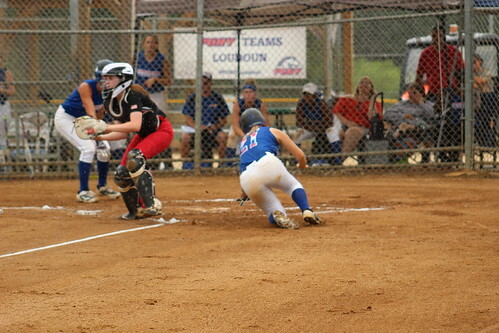 Scoring started in the bottom of the second inning with Loudoun Liberty’s pitcher, Abbey Lane scoring on an error. 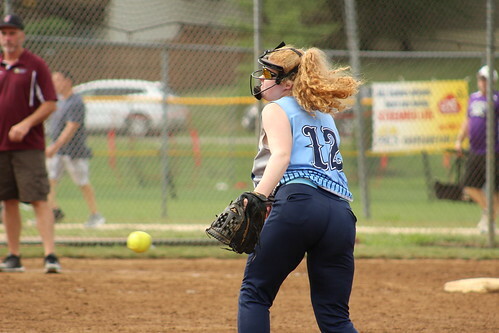 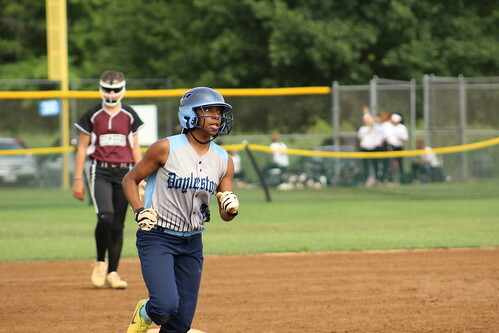 The Banshee’s answered in the next half inning and had a chance to add more runs with the bases loaded but Lane forced a ground ball to third to tame the Banshee’s. 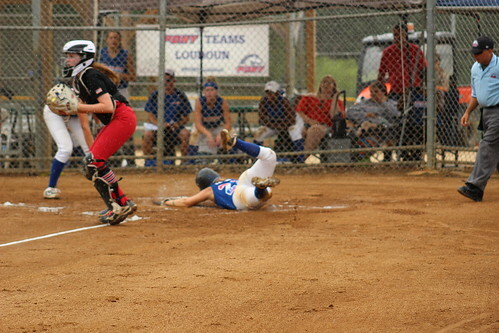 The tied score of 1-1 would be short lived as the Liberty found the scoreboard again in the bottom of the third. 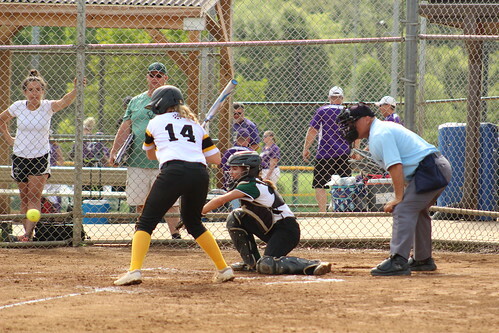 Liberty’s Janey Winner scored thanks to a sacrifice fly by Lexi Schaaf to center field giving the home team a 2-1 lead. 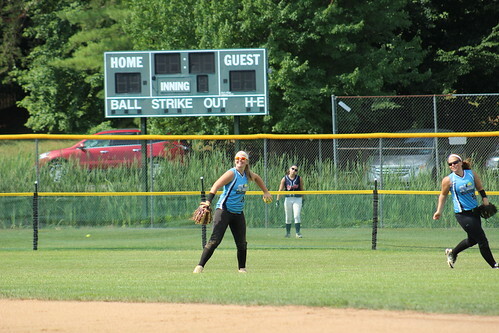 The score remained that way until the bottom of the fifth. 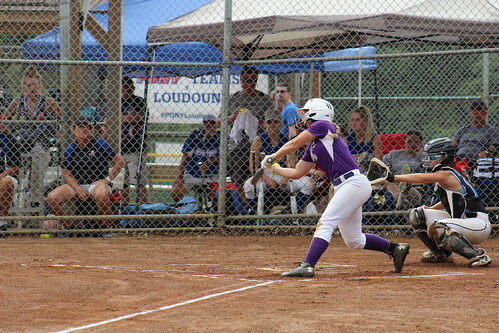 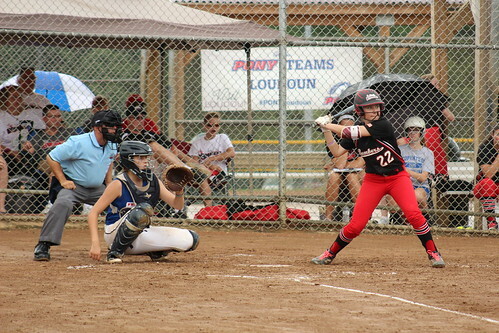 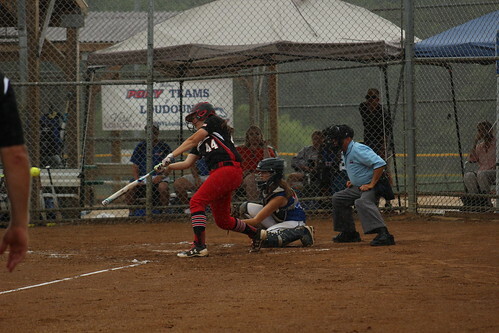 Loudoun’s Lindsay Bogle laid down a bunt right in front of home plate. 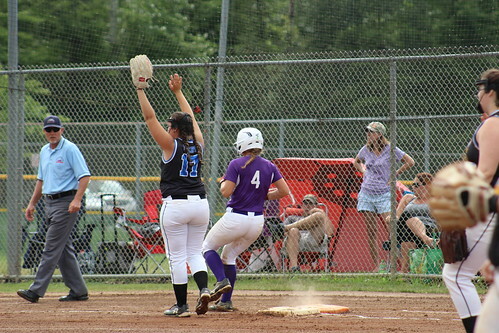 As the ball was fielded and thrown to first Winner broke for home and scored the fourth run of the game, third for Liberty. 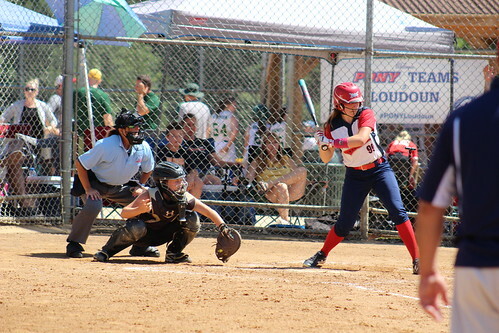 Loudoun sealed the victory with another run the bottom of the sixth and took home the championship after a 1-2-3 top of the seventh. 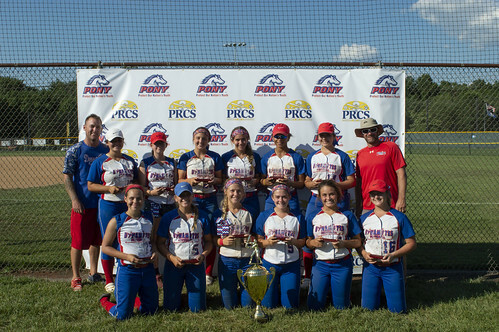 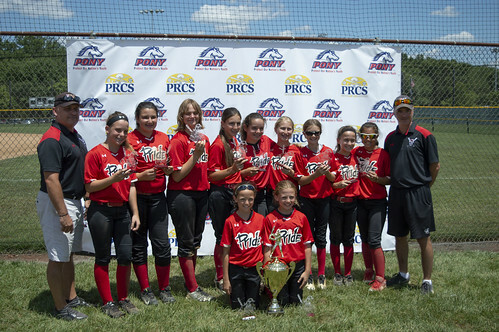 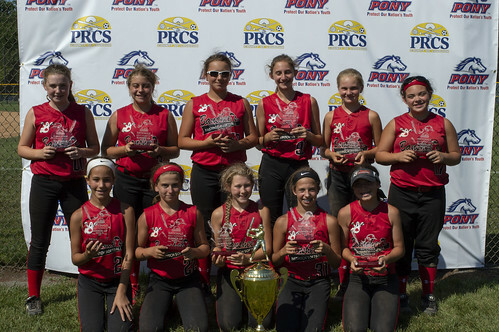 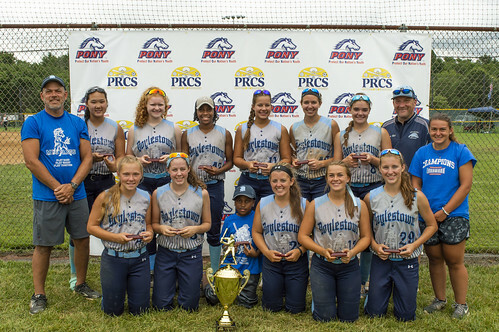 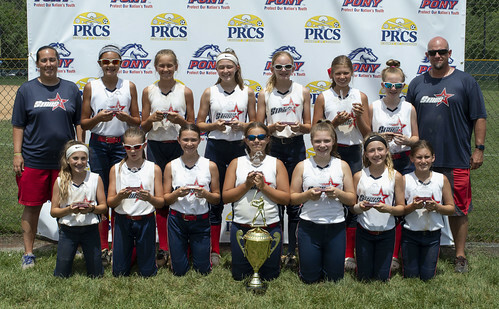 With the 4-1 victory, Loudoun Liberty won their second PONY East Zone Softball National Championship as this team won the Mustang 10U title in 2016. 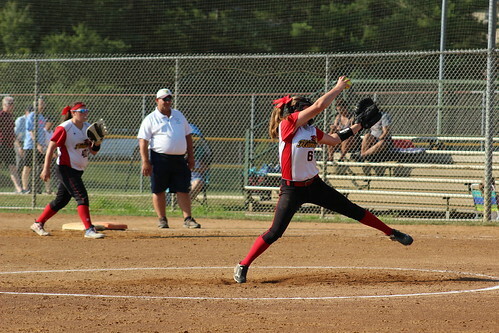 Lane picked the win as she went the full seven innings giving up seven hits, one run (earned) and two walks. 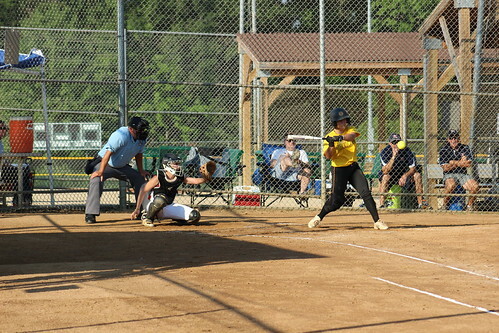 Winner led the team in hitting as she went three-for-three while scoring twice including the game winning run. 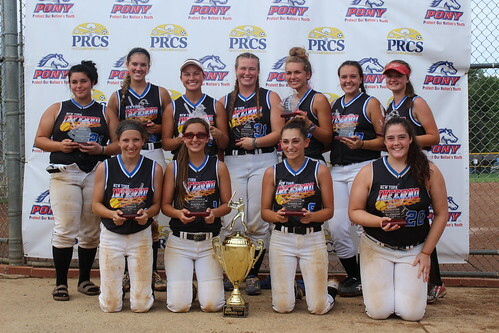 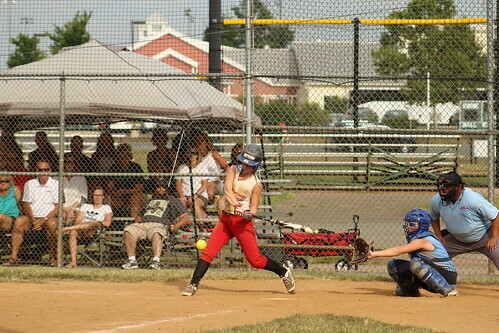 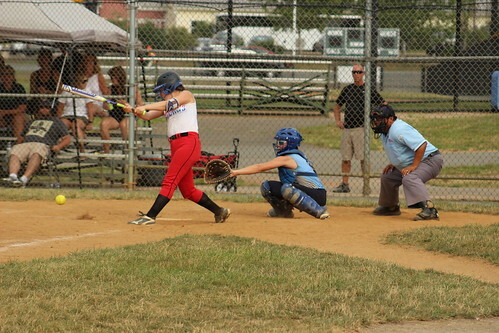 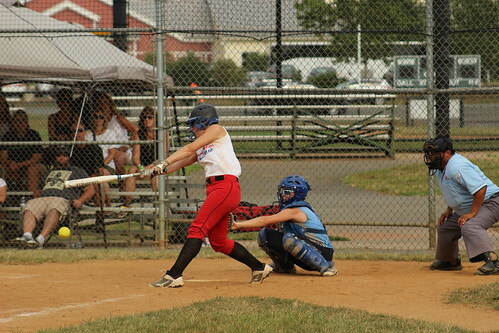 In the second championship game of the day, the Delaware Magic faced the Massachusetts Dynamites Red team for the crown of the Pony 14U division at the PONY East Zone Softball Nationals. 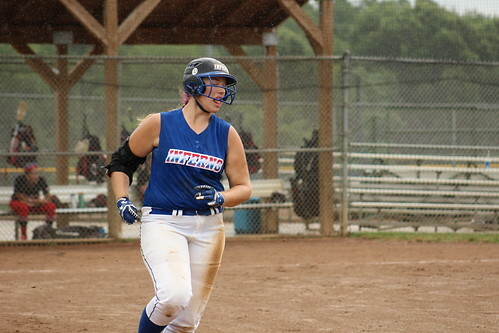 Through the first three innings, the difference between the Magic and Dynamites was one. 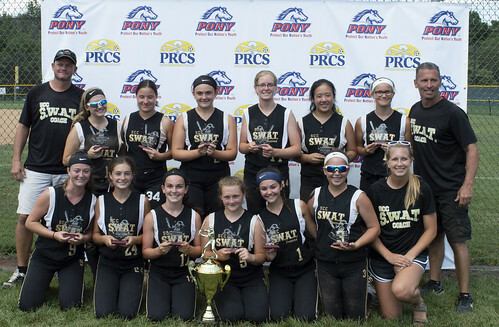 From that point, the Magic pulled away to claim the Pony 14U title. 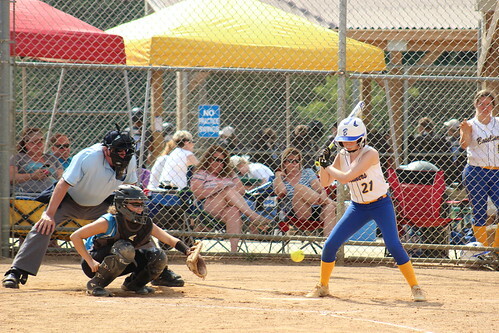 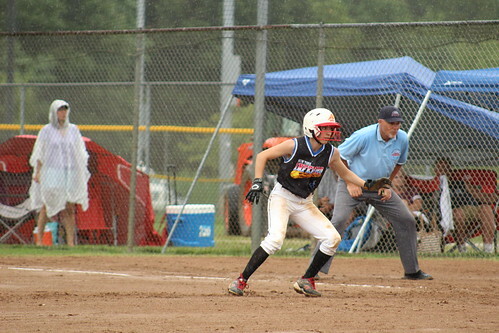 The Magic started the game in fashion, center fielder Peyton Pusey reached on a one-out single. 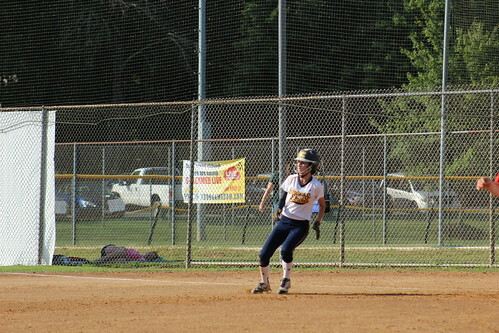 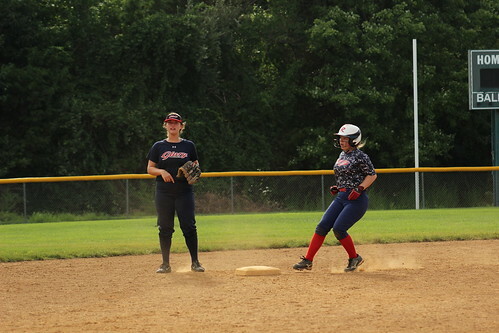 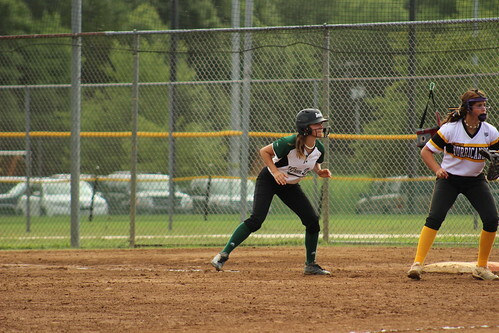 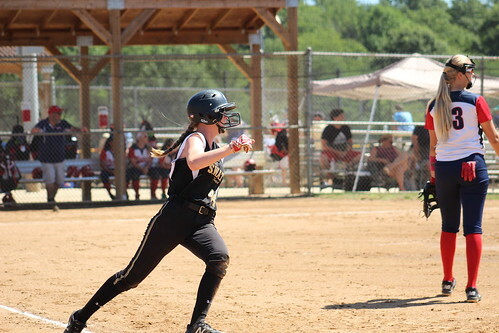 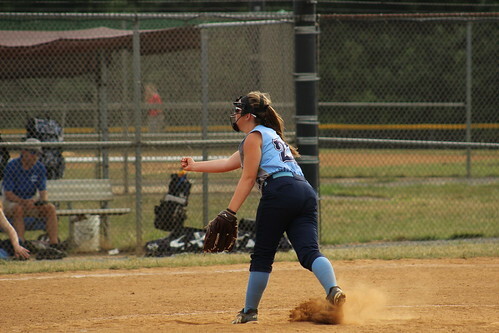 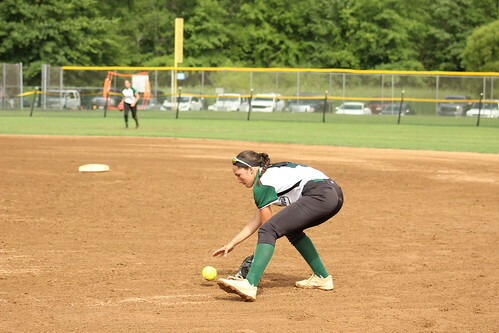 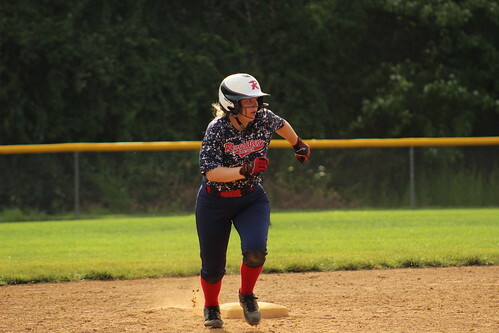 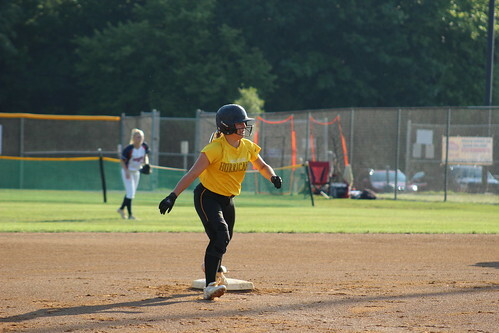 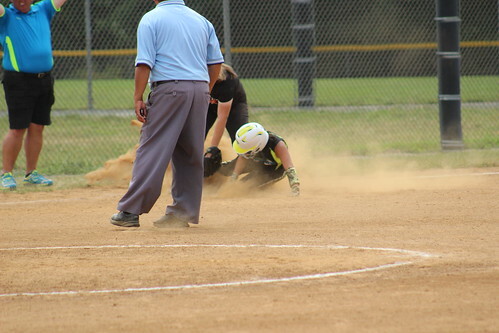 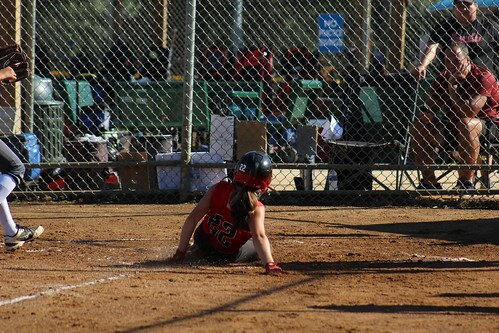 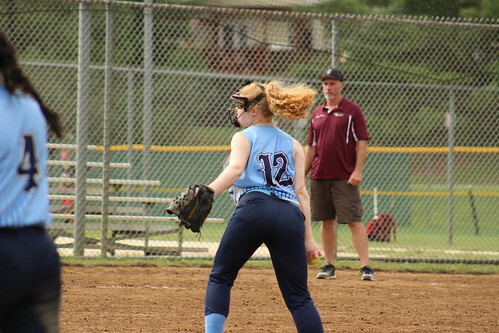 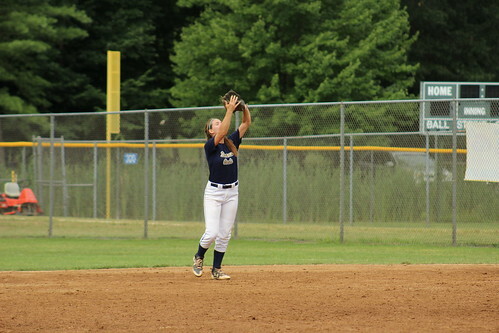 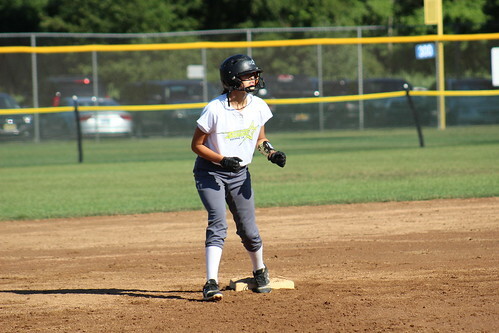 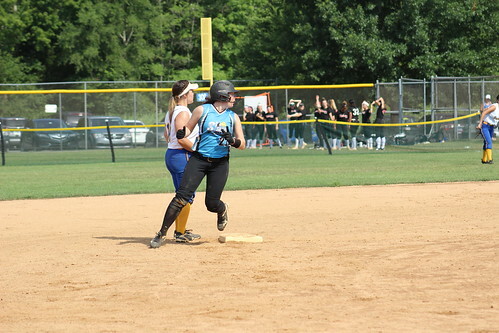 First baseman, Regan Mendick singled and scored Pusey as she had moved to second on a passed ball. 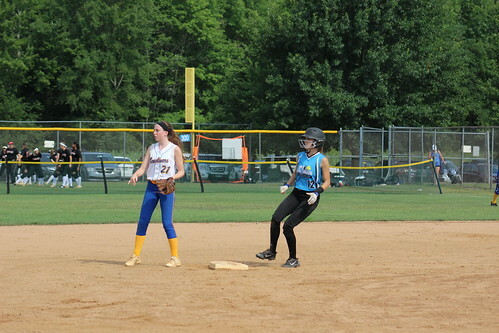 Mendick was moved up the third when third baseman, Juliana Paoli, reached on an error. 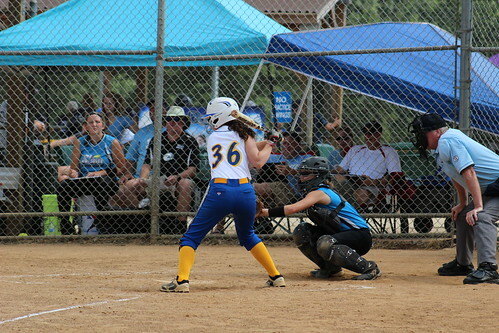 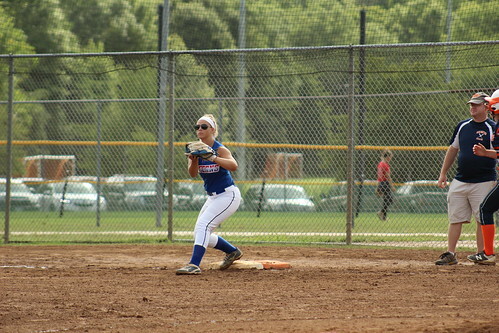 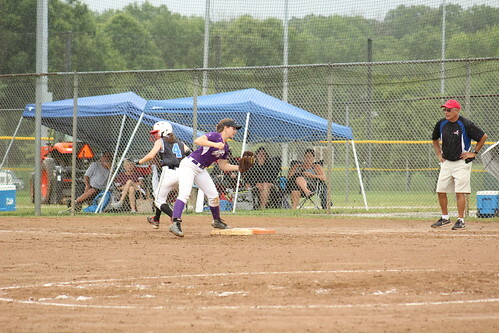 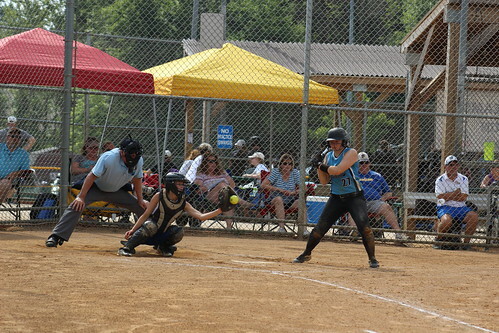 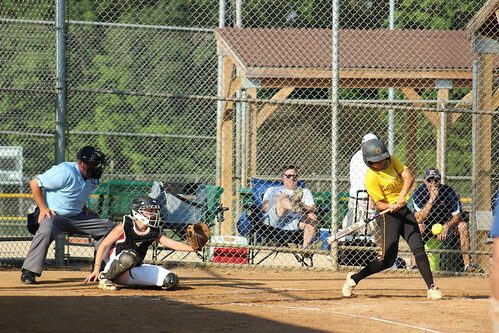 Paoli then stole second and both her and Mendick were brought home by the two-RBI single by left fielder, Tori Liptka. 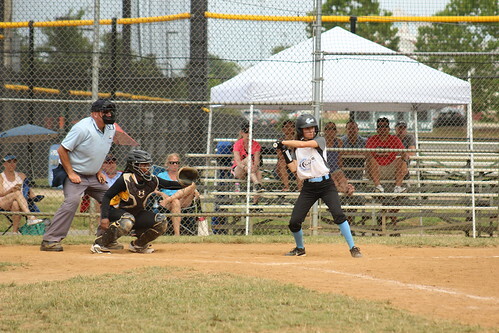 The Magic held a 3-0 lead as the game headed to the bottom of the first inning. 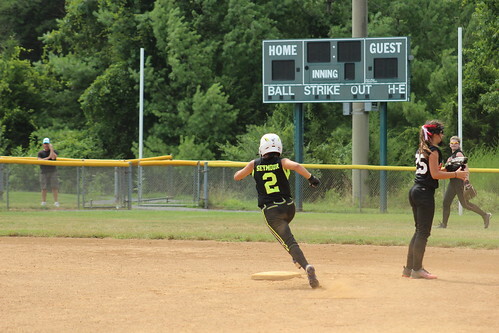 However, the Dynamites answered in with a run in the bottom of the first. 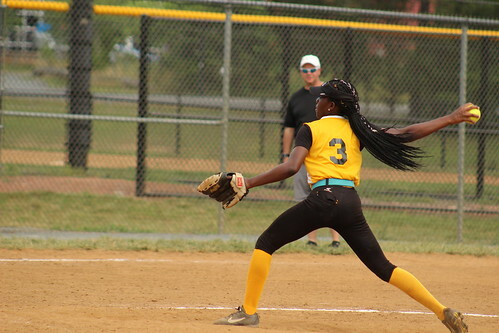 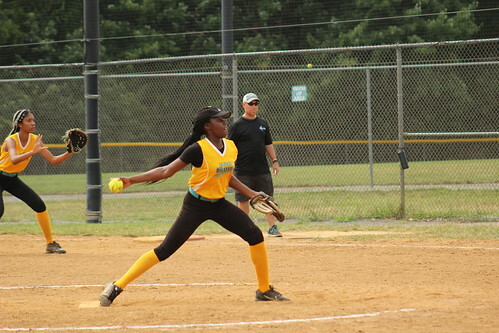 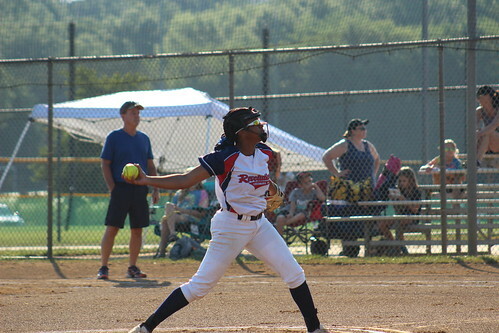 After holding the Magic scoreless in the second, the Dynamites added another run in the second to cut the lead down to one, 3-2 in favor of Delaware. 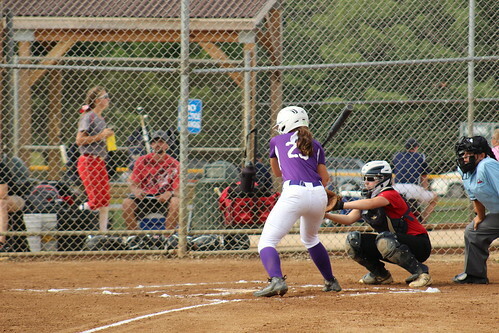 In third inning, Pusey reached on a single again and moved to second as right fielder, Jenna Troyer, walked in the very next at-bat. 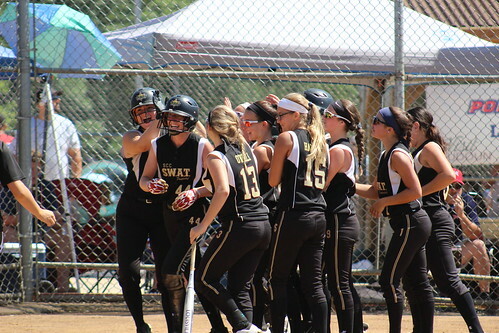 Both Troyer and Pusey scored and gave the Magic a 5-2 lead heading to the bottom of the third. 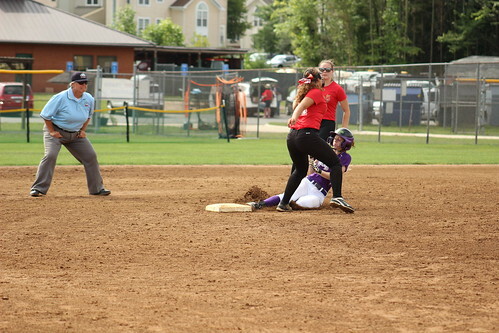 Massachusetts responded with two runs of its own to make it a 5-4 game. 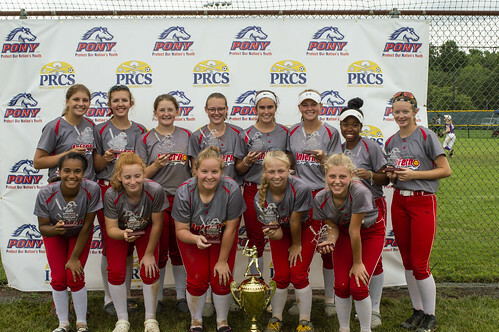 From that point, the Magic added five more runs the last three innings to take the Pony 14U championship with a 10-4 victory. 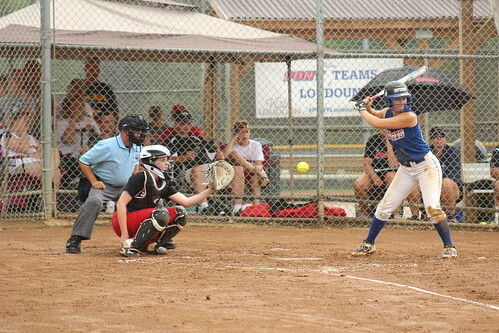 Pusey led the offense for the Magic going a perfect, four-for-four from the plate while scoring three times. 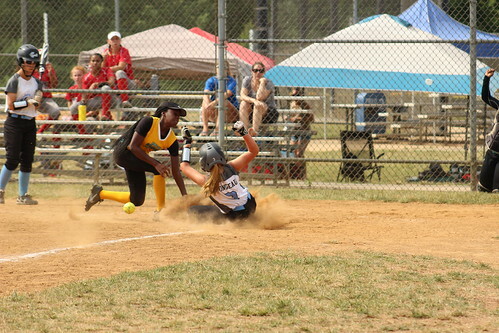 Delaware only had one loss for the whole tournament and that was by hand of the same Dynamites team earlier in the bracket. 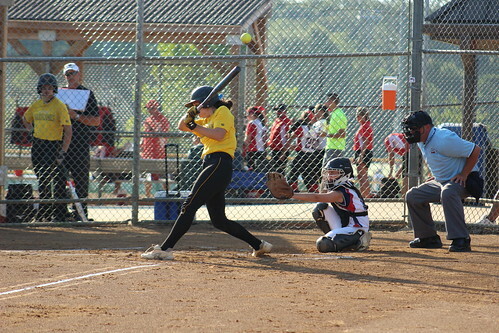 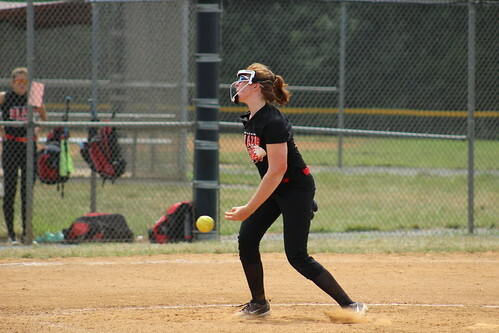 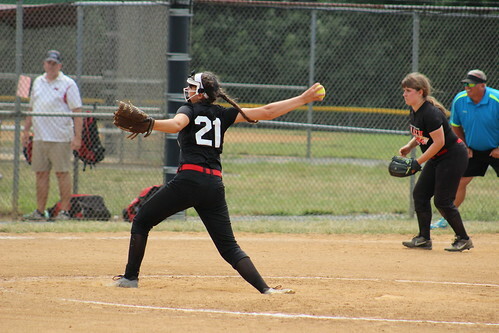 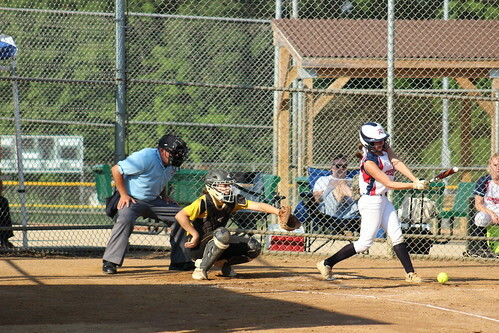 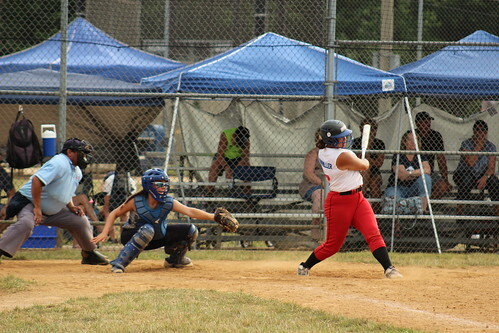 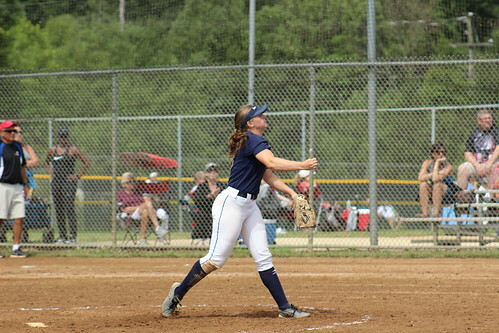 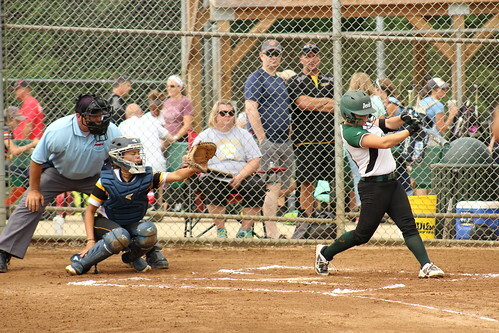 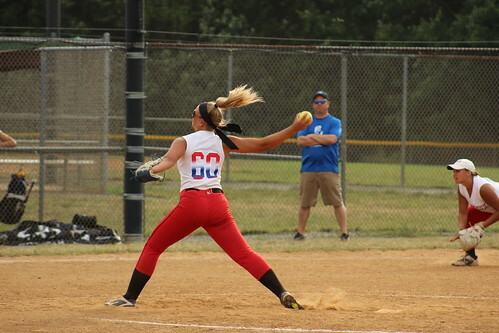 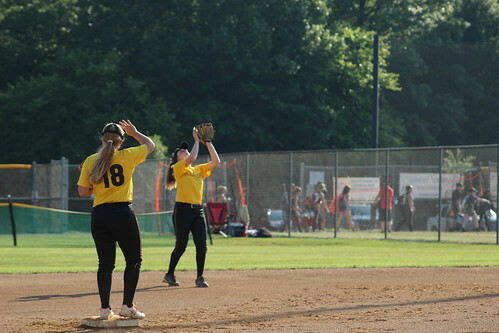 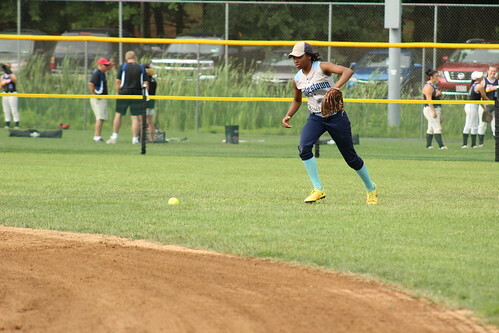 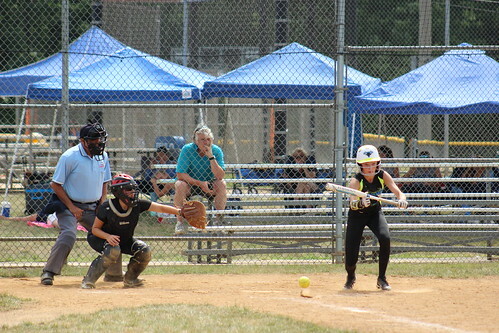 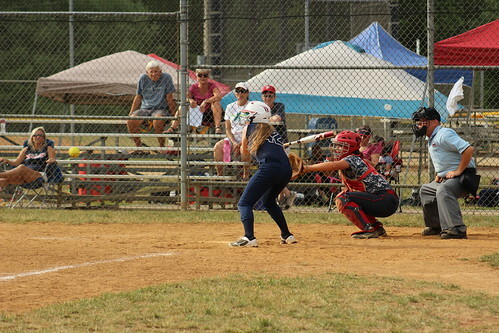 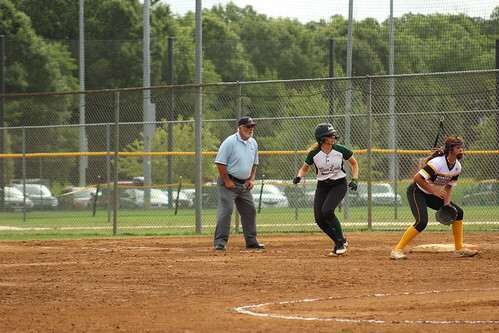 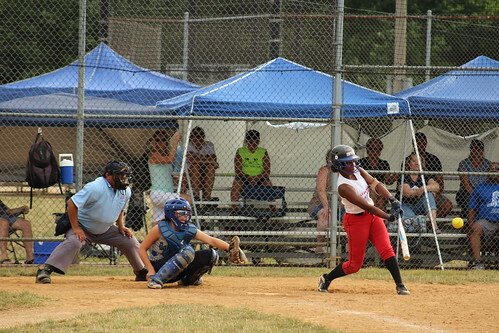 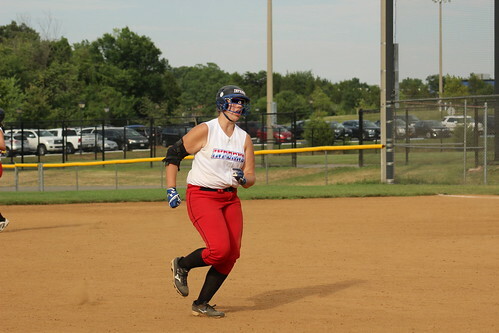 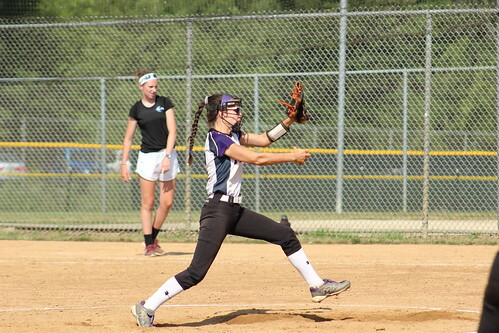 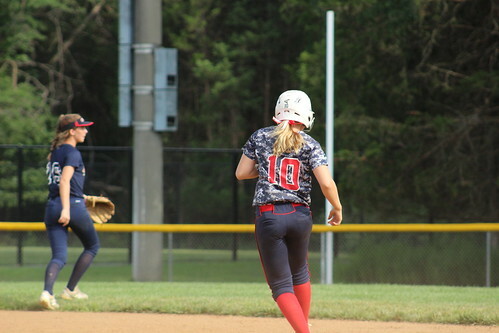 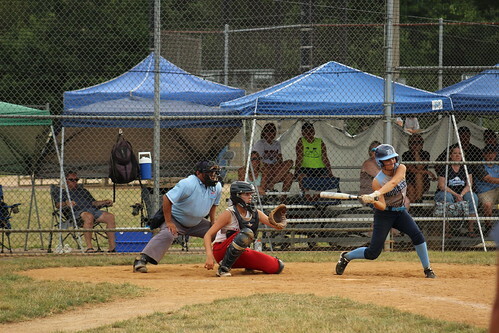 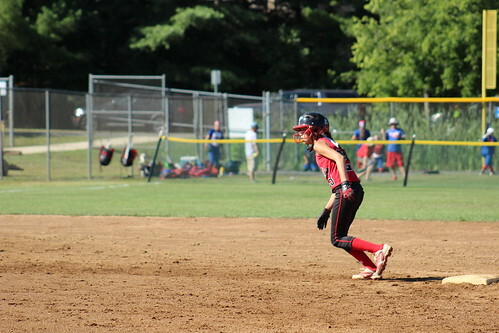 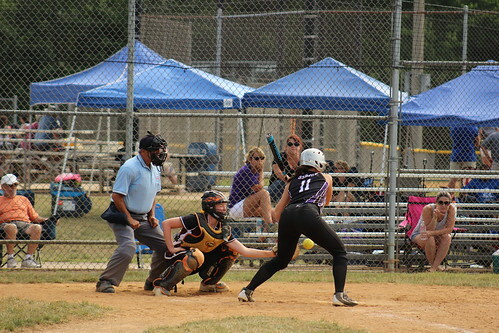 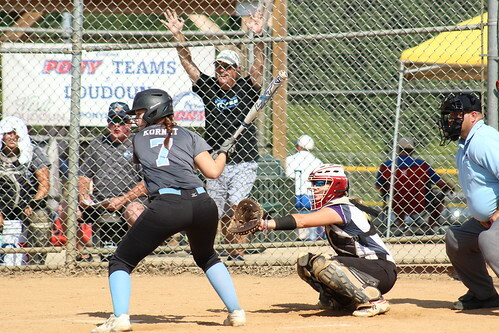 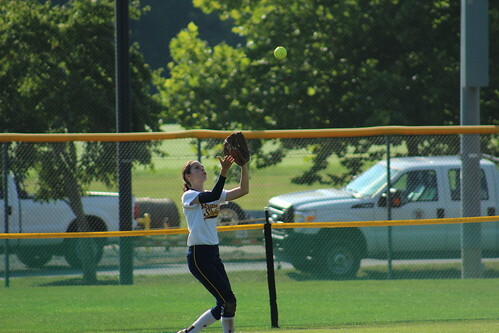 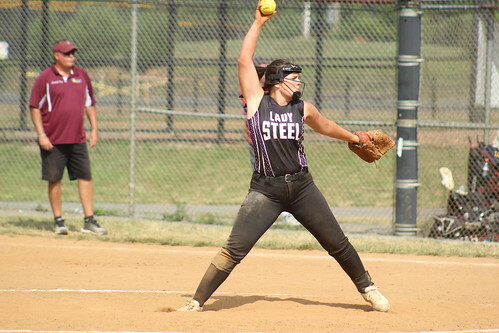 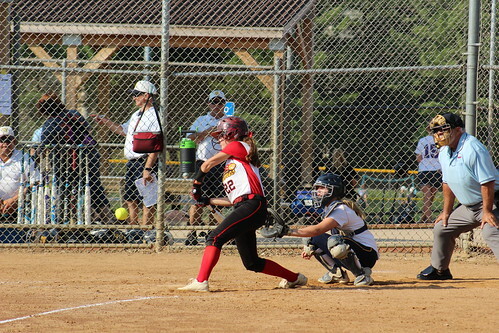 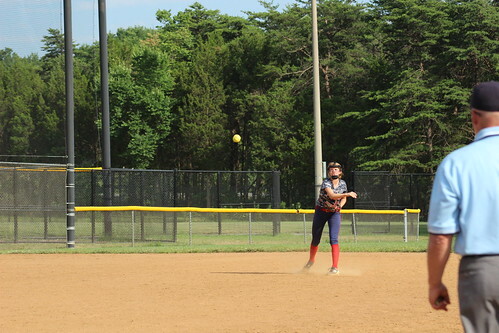 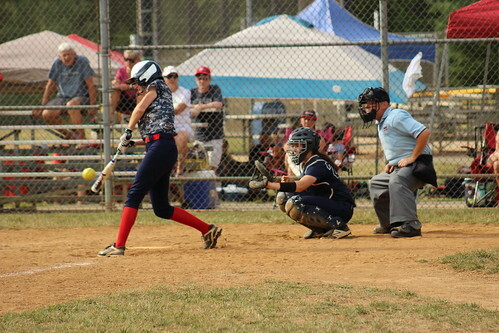 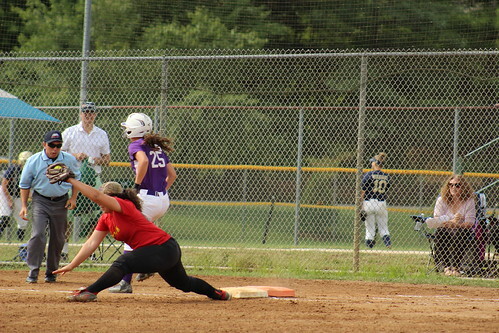 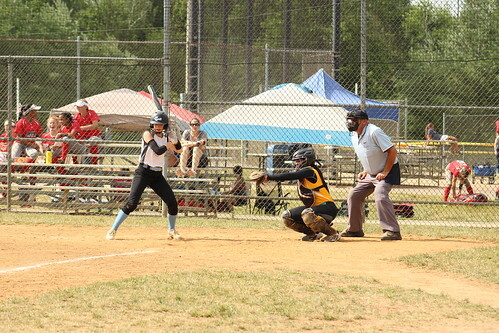 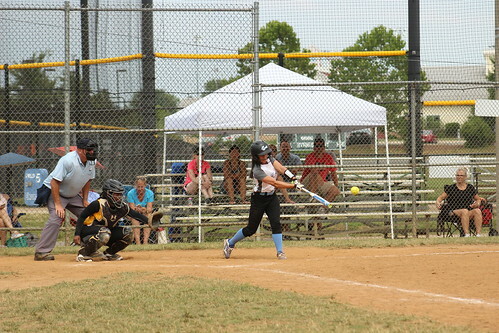 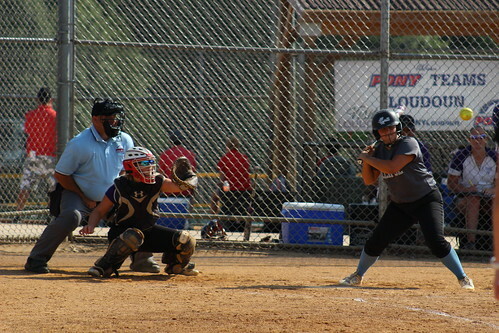 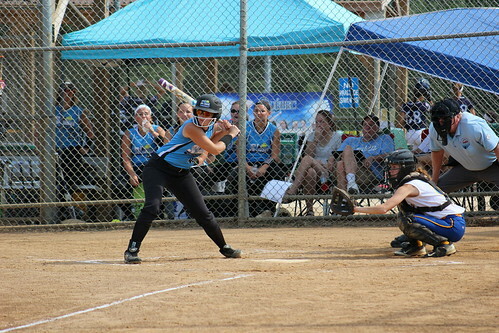 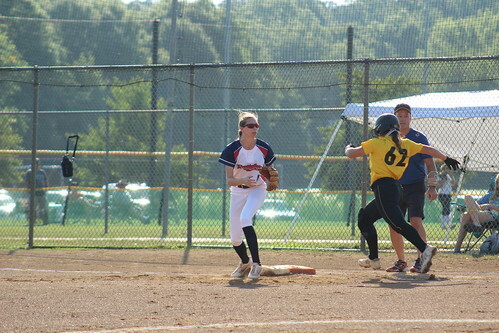 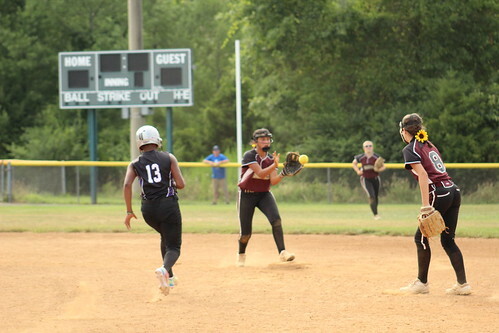 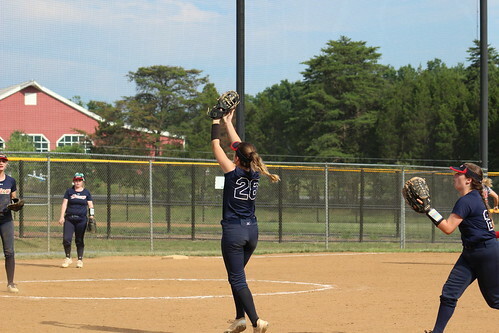 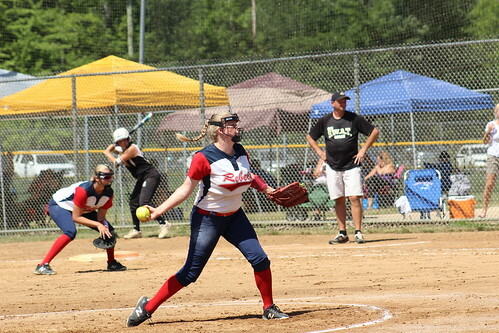 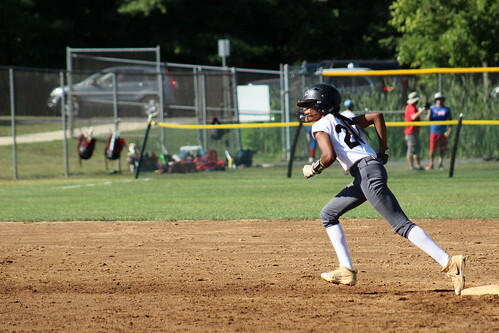 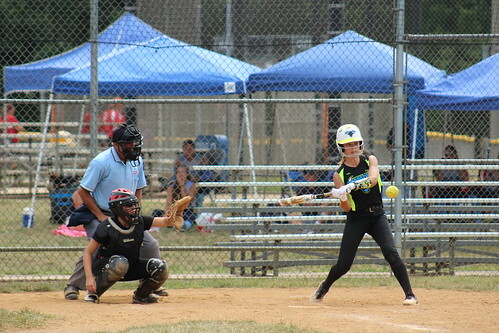 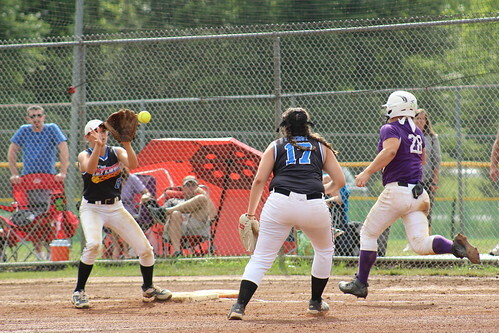 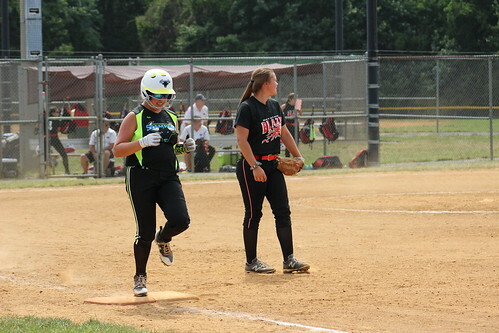 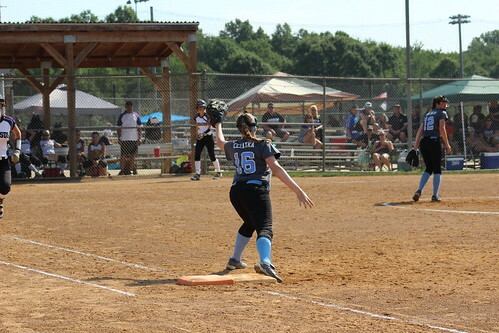 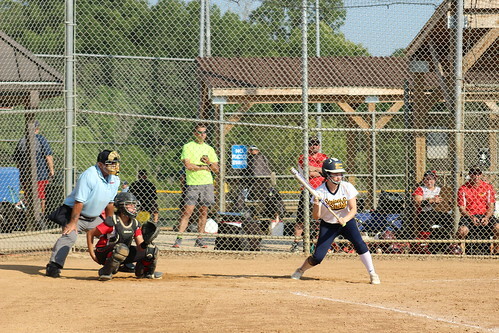 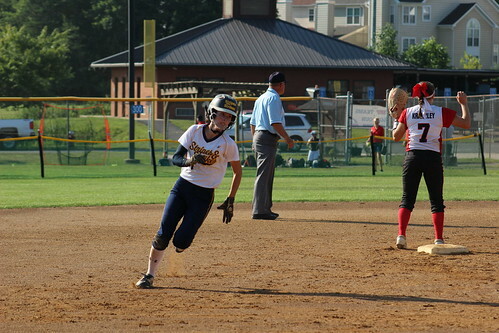 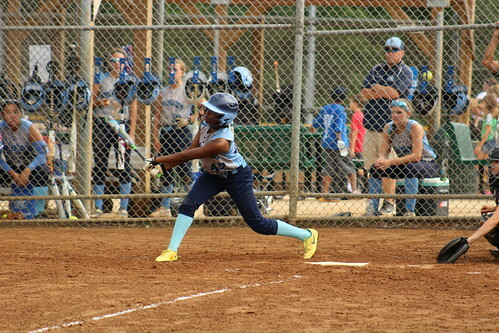 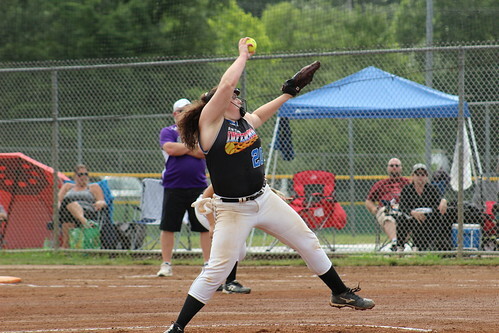 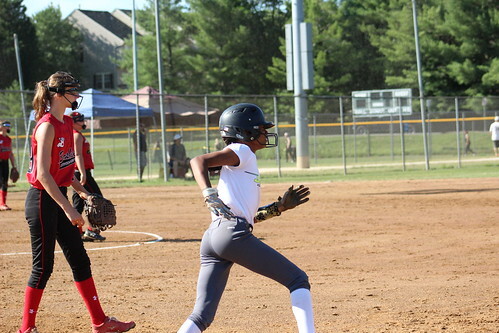 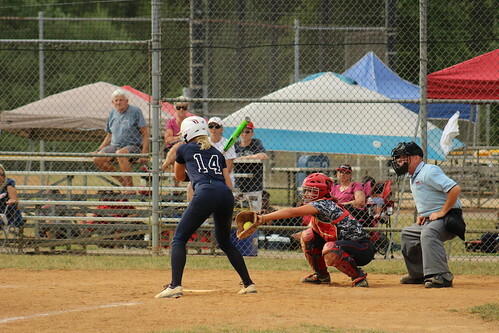 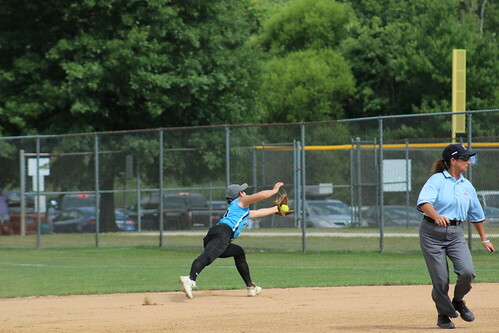 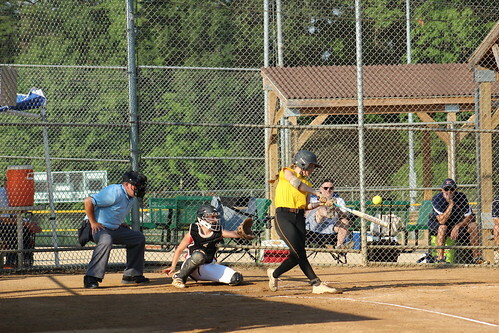 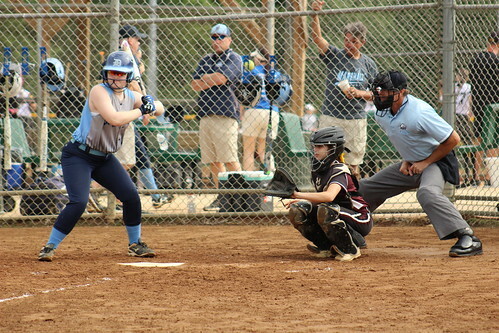 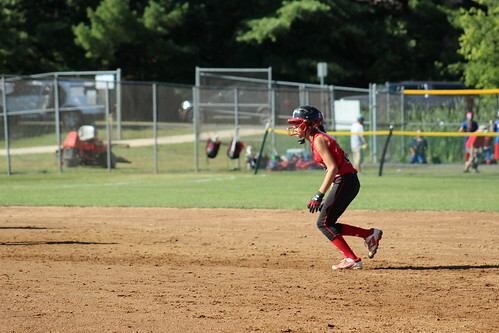 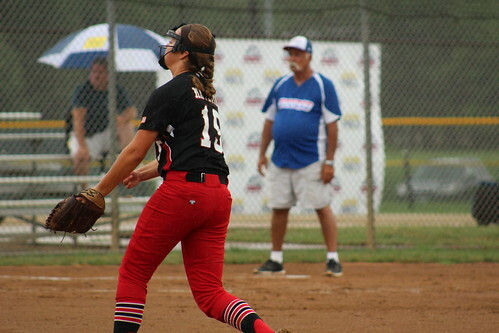 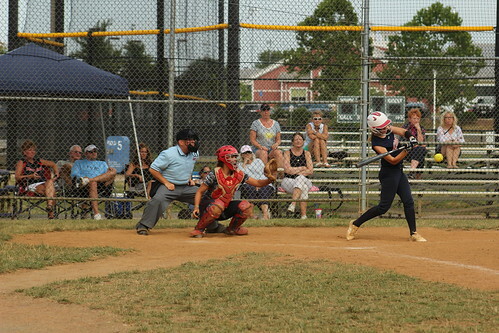 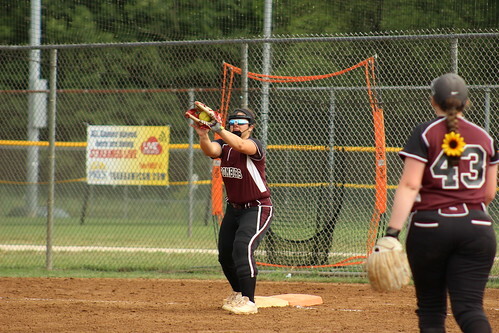 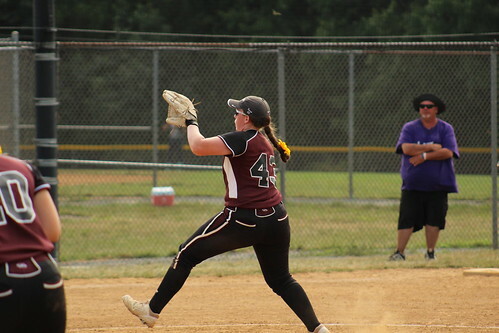 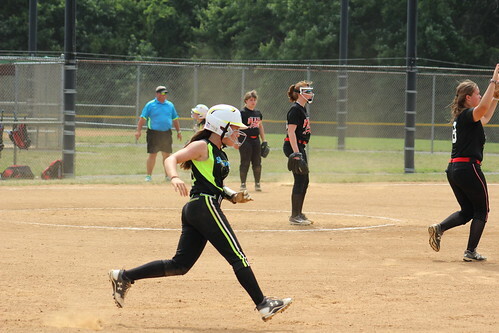 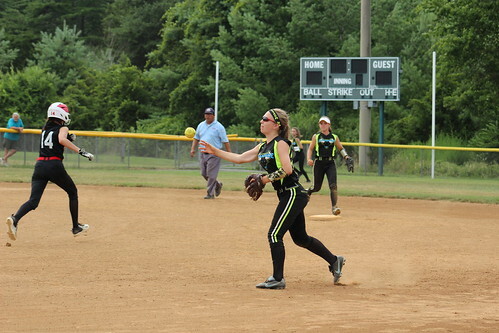 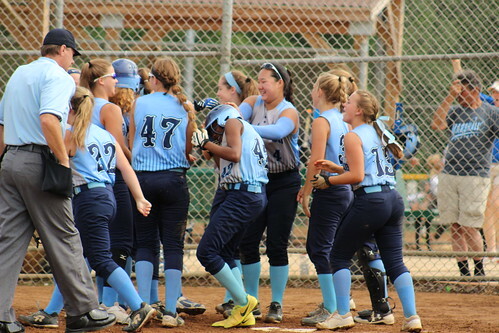 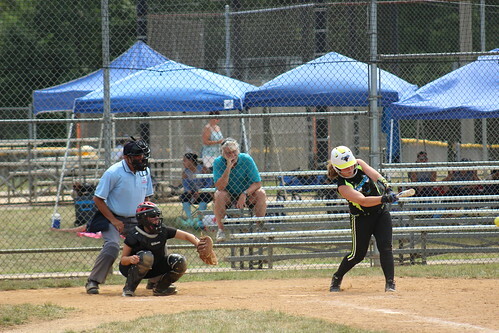 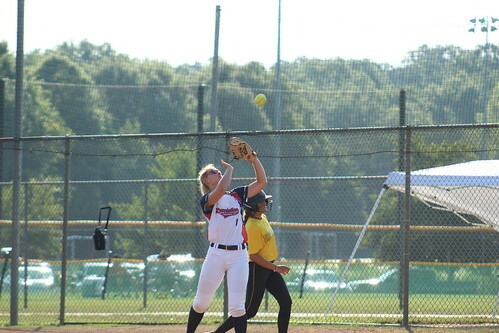 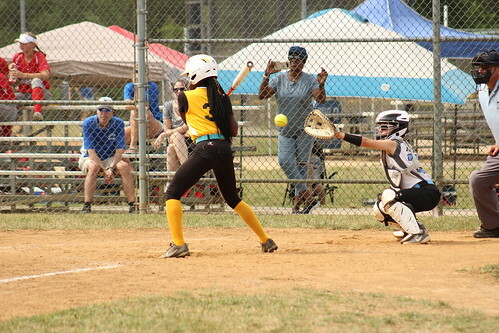 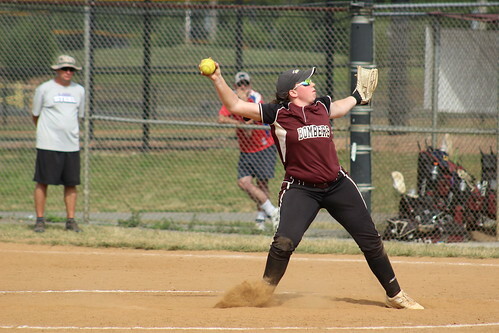 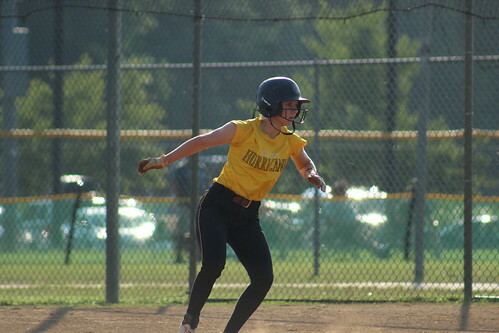 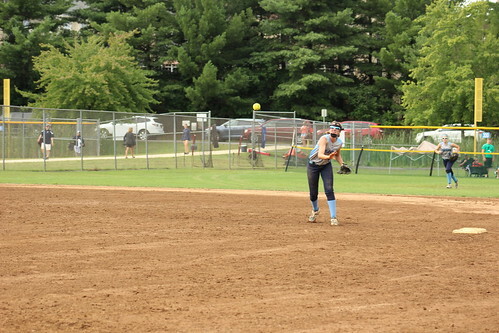 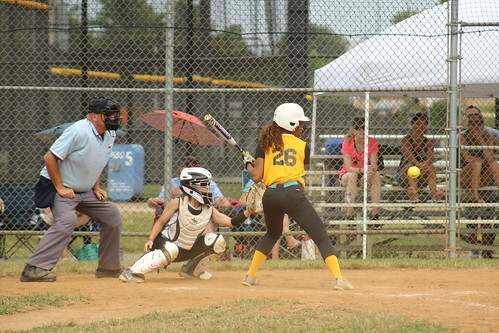 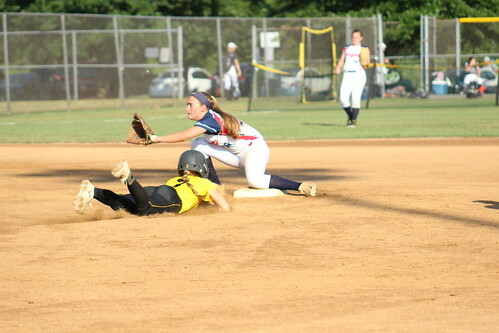 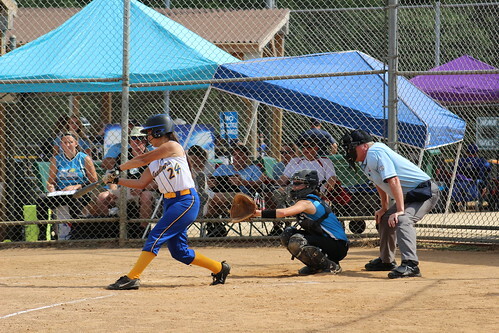 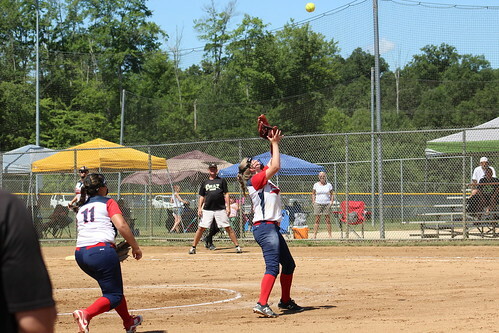 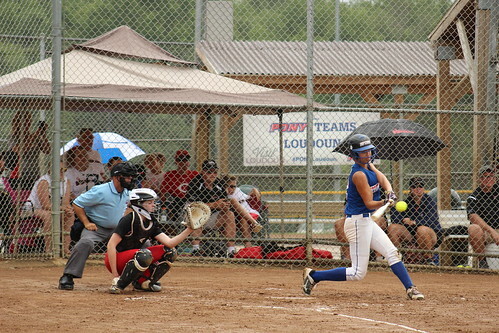 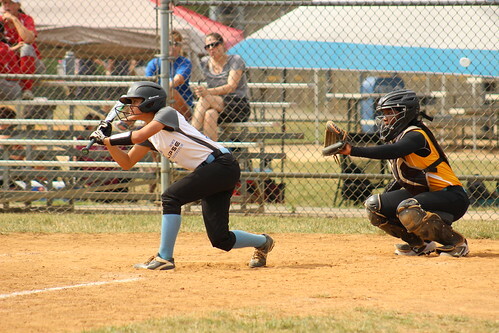 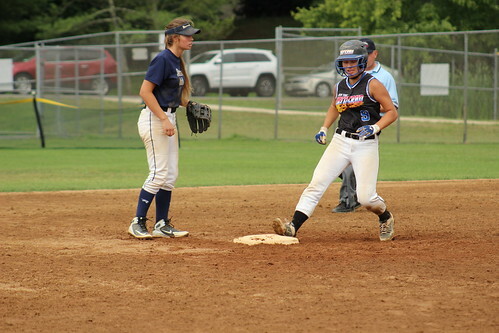 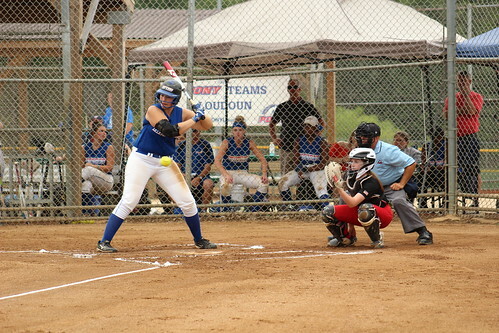 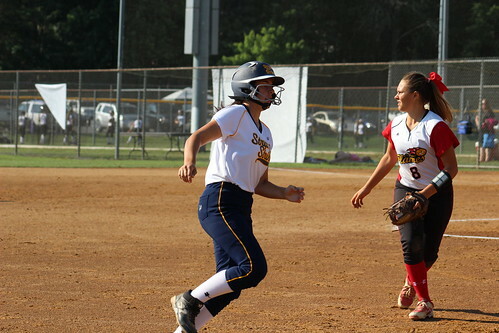 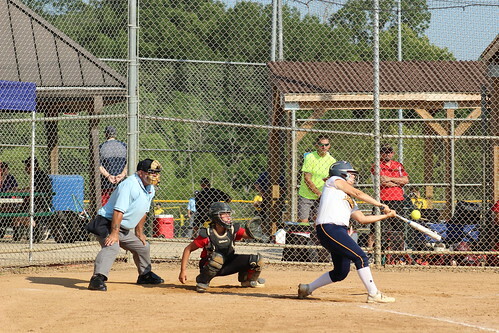 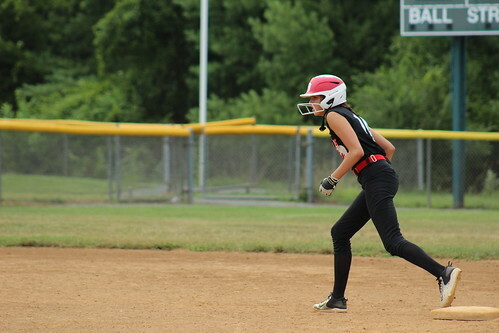 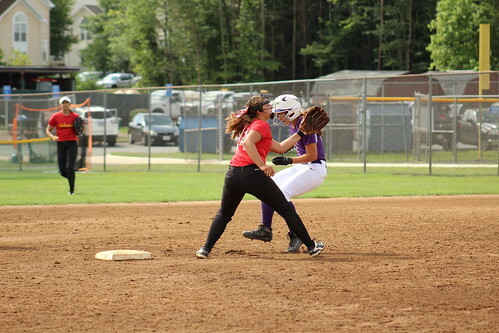 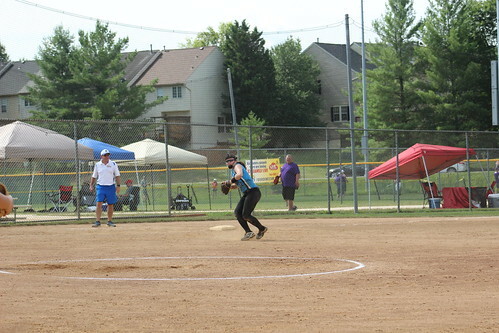 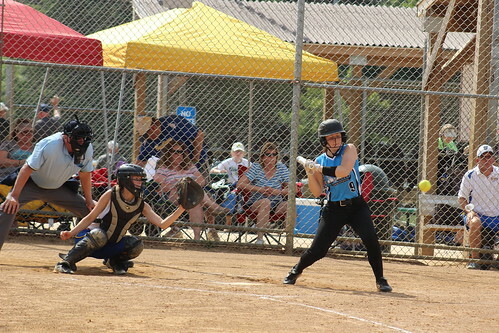 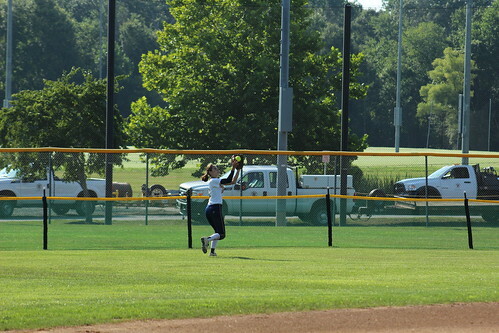 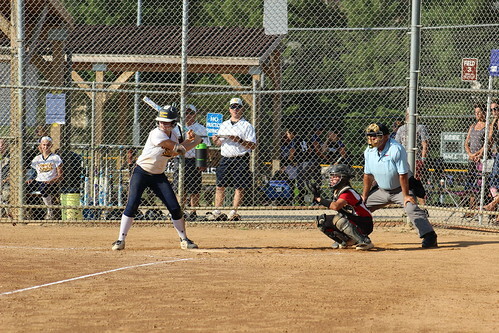 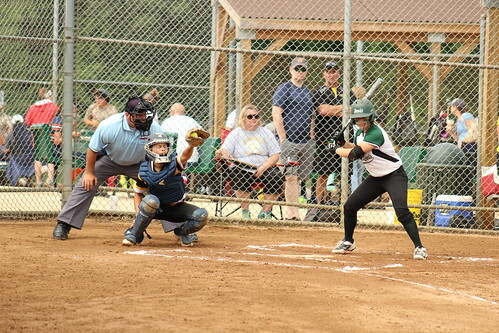 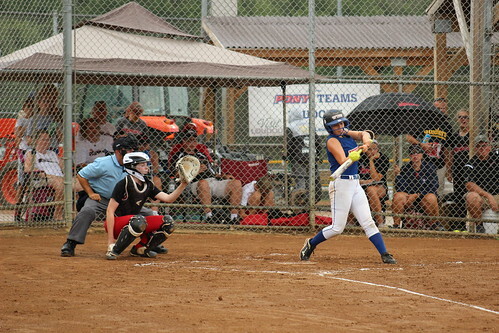 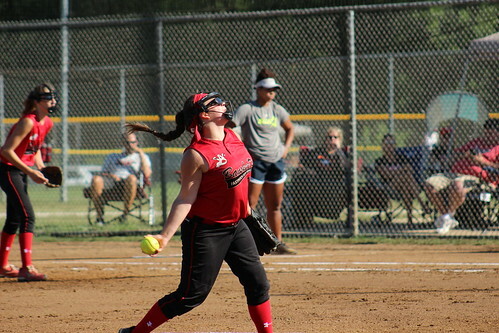 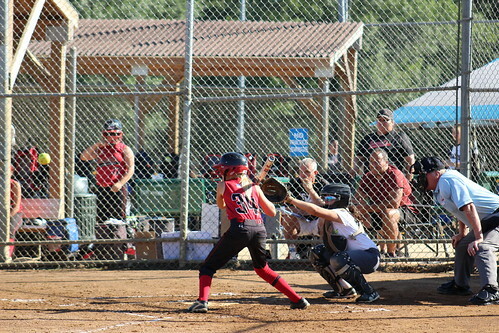 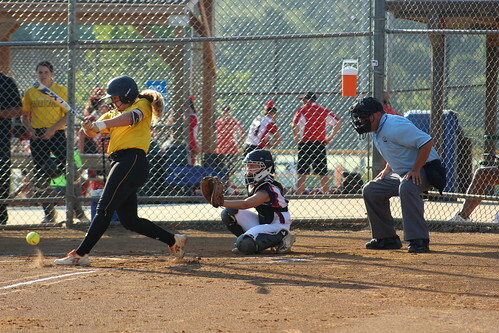 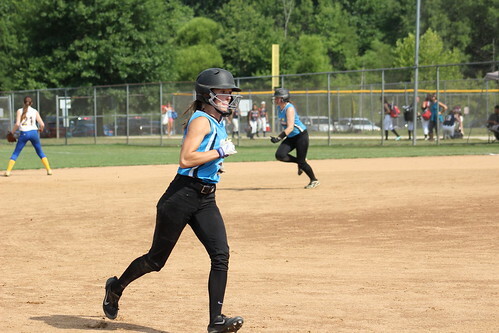 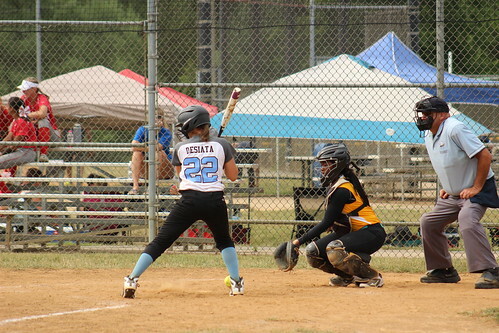 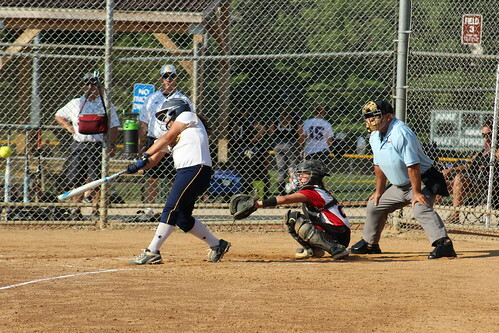 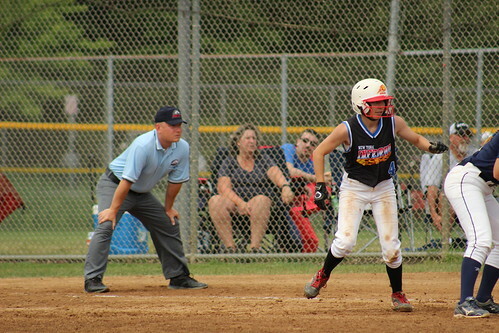 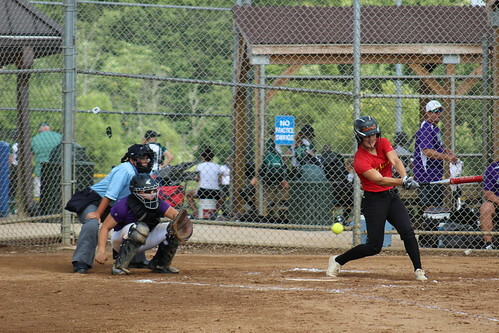 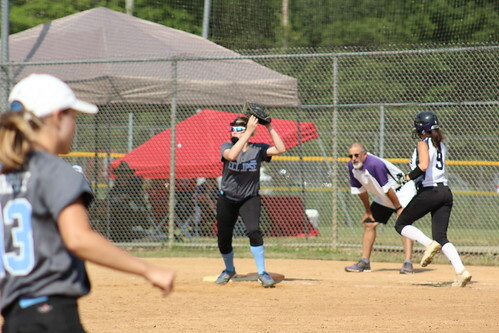 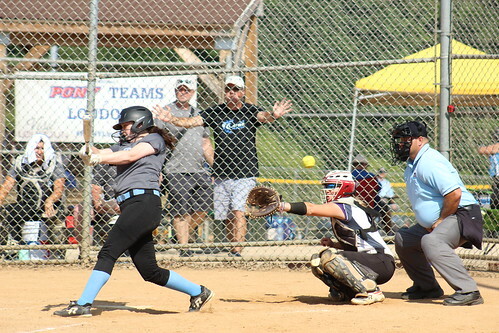 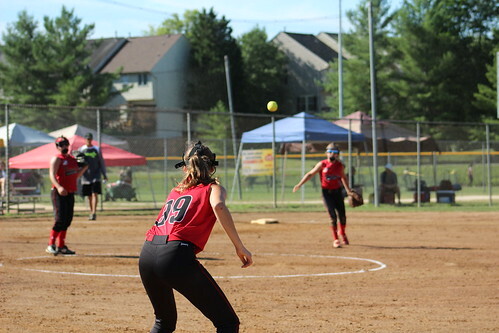 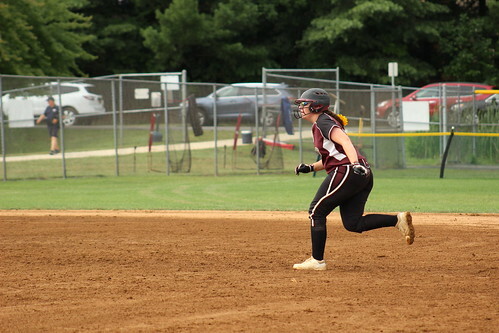 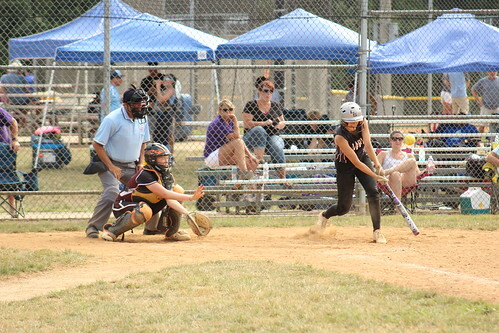 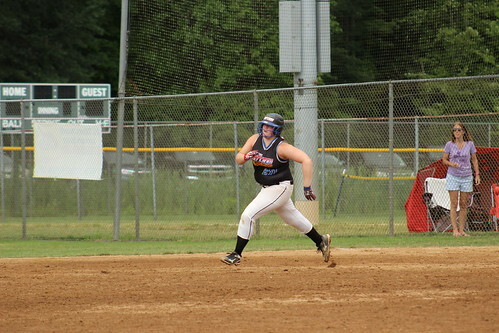 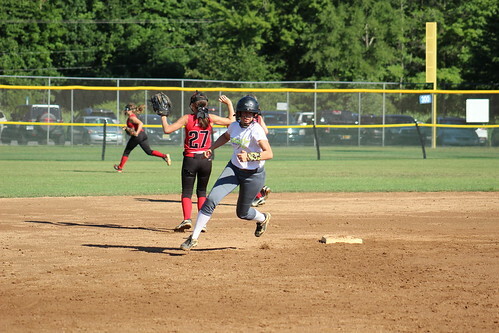 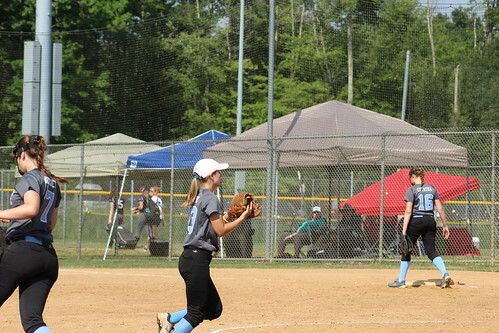 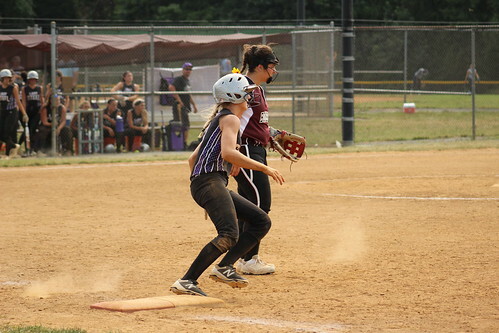 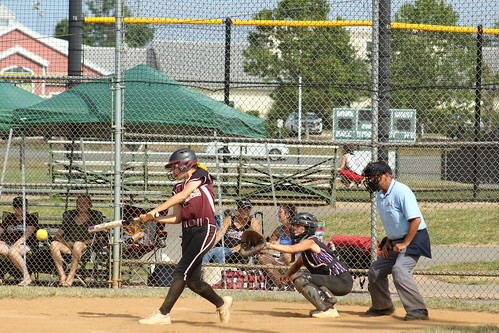 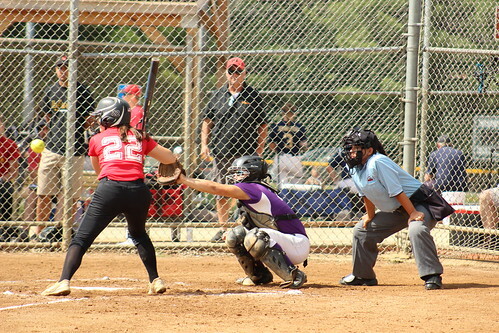 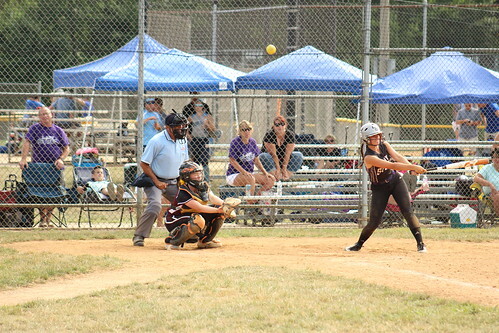 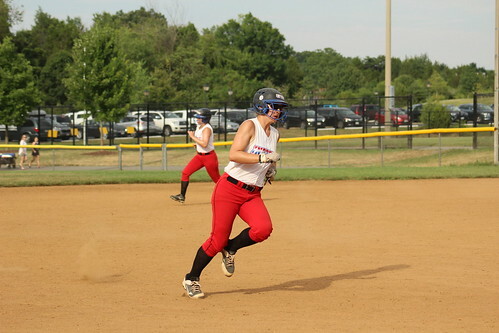 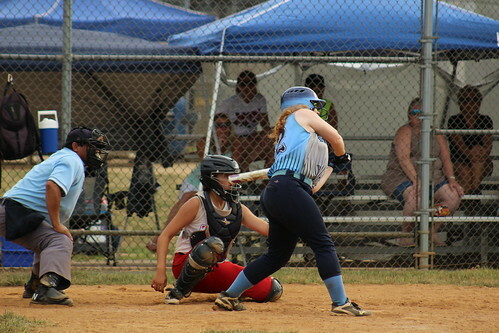 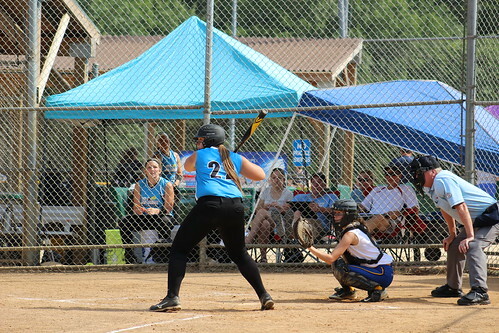 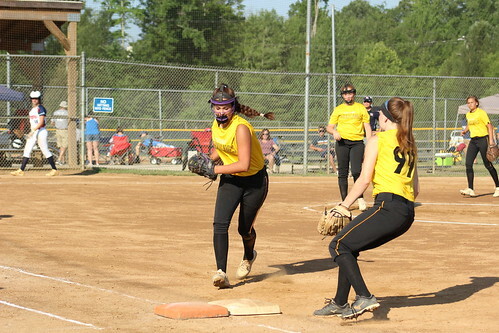 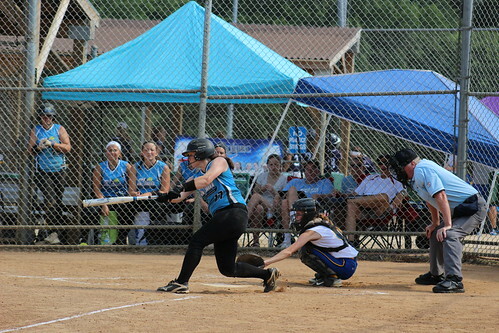 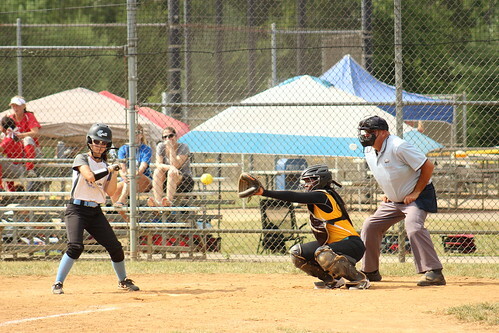 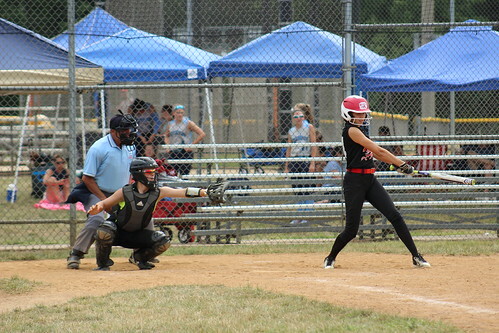 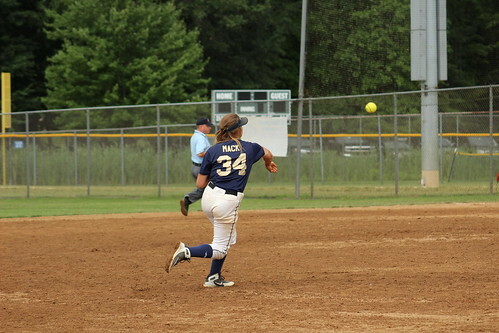 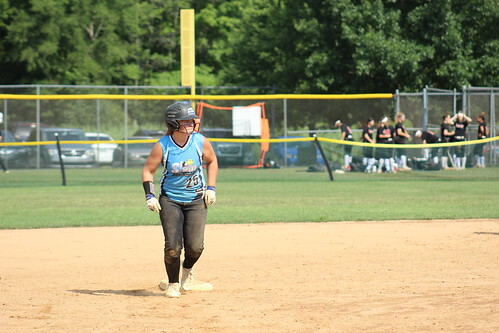 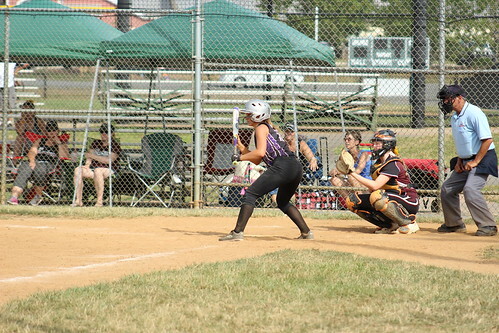 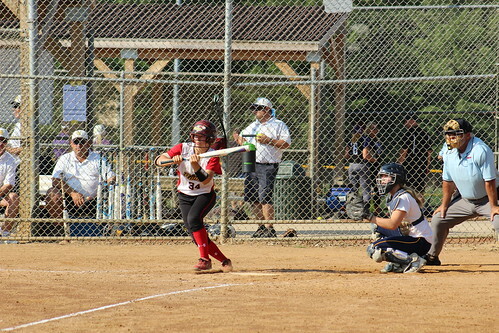 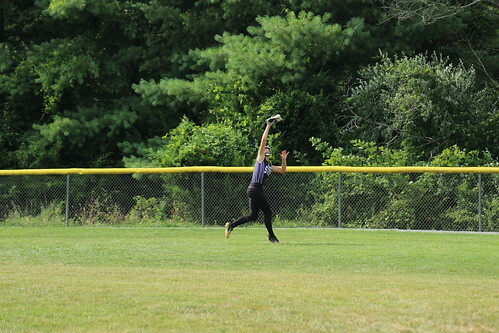 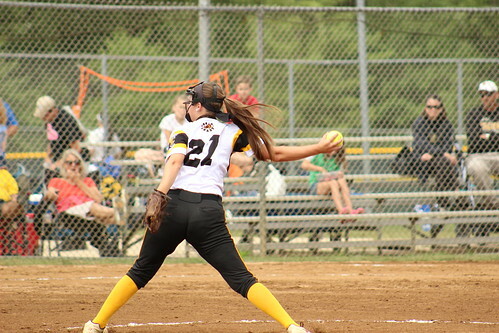 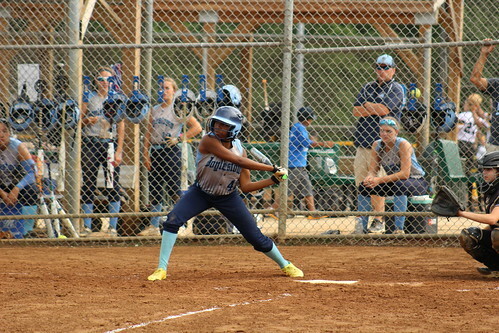 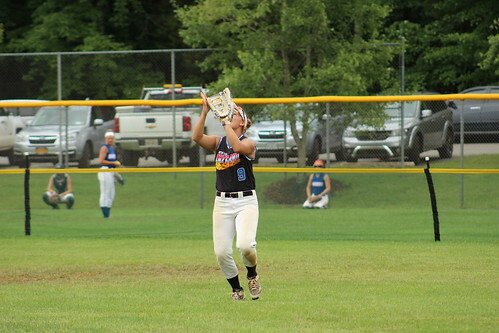 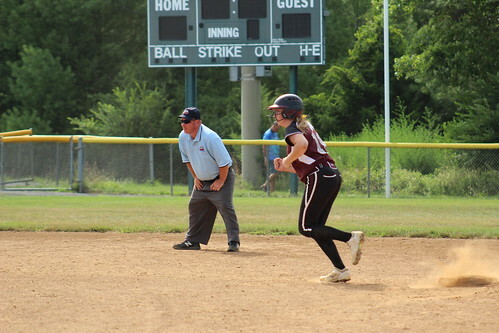 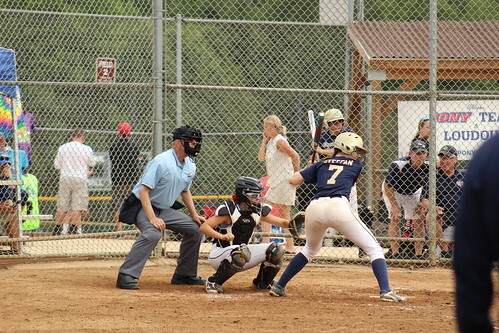 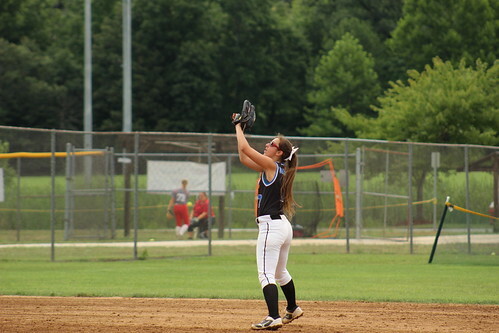 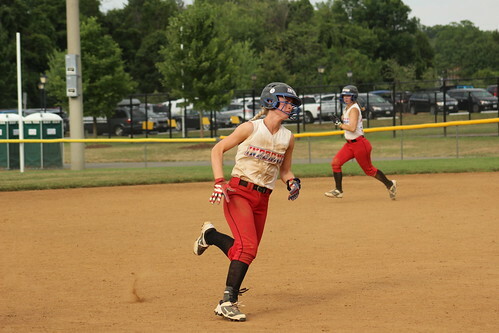 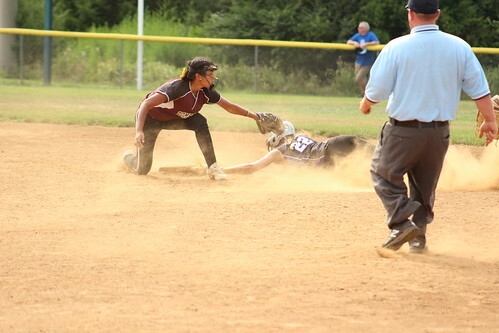 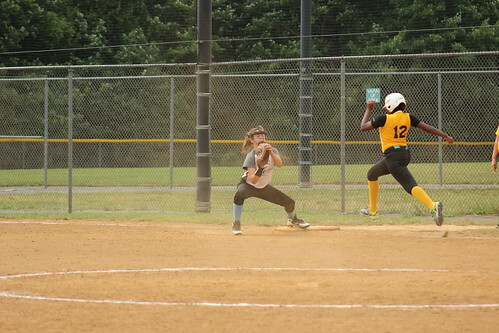 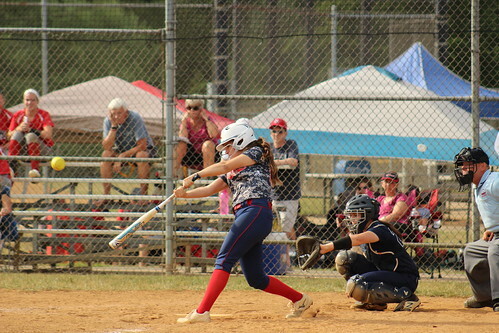 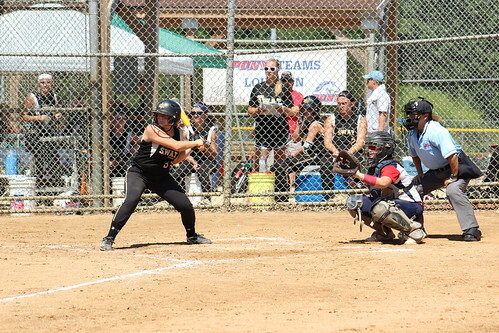 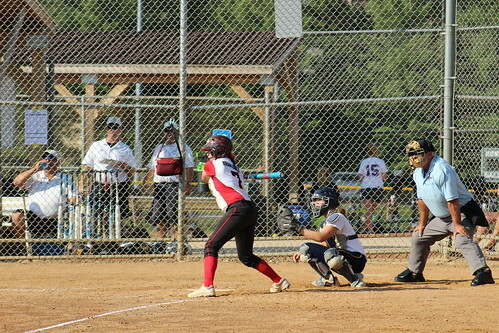 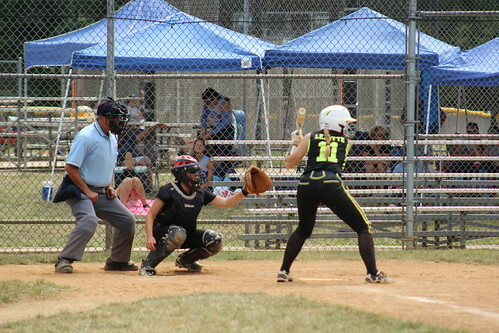 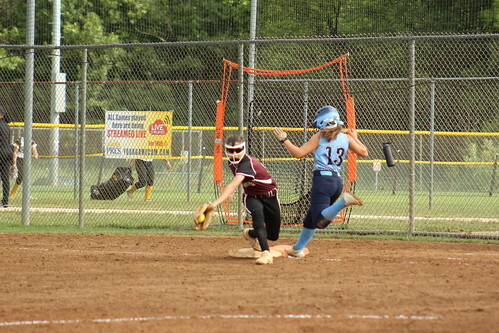 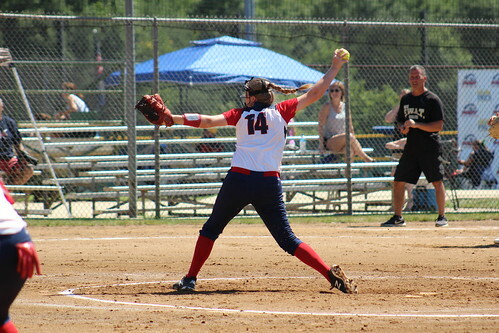 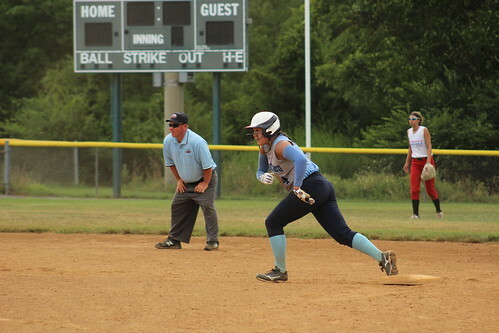 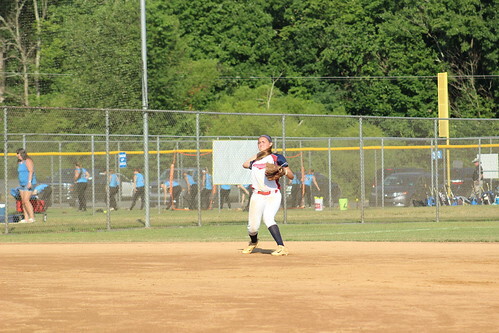 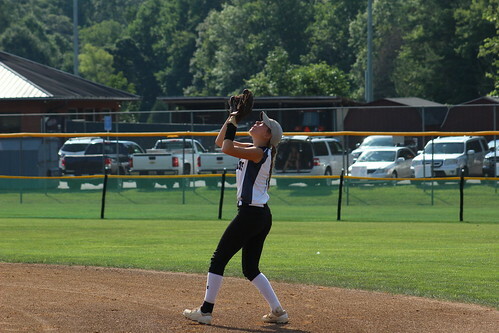 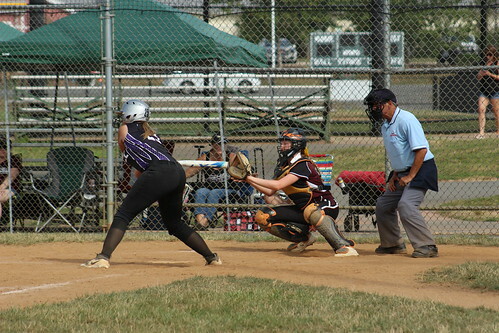 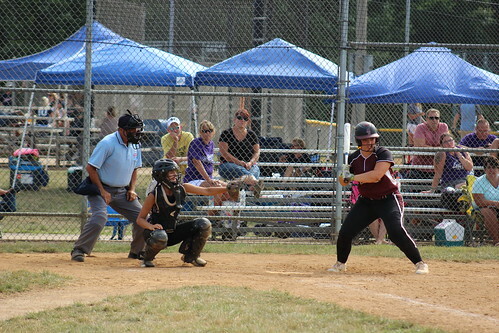 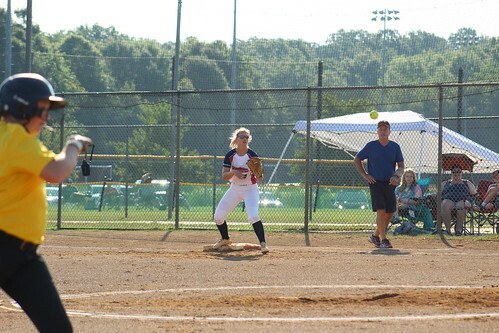 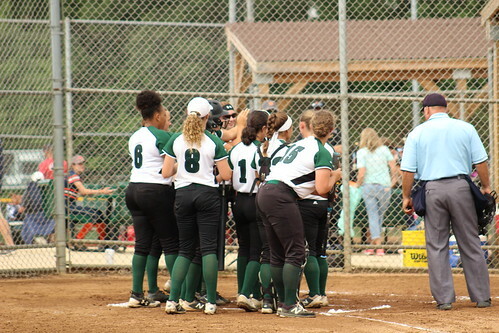 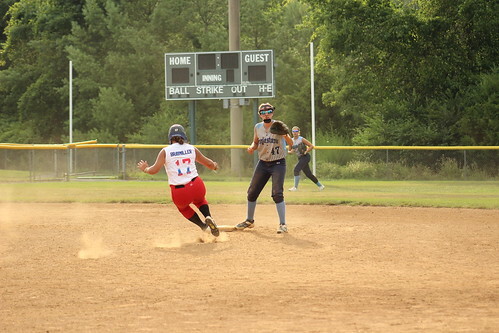 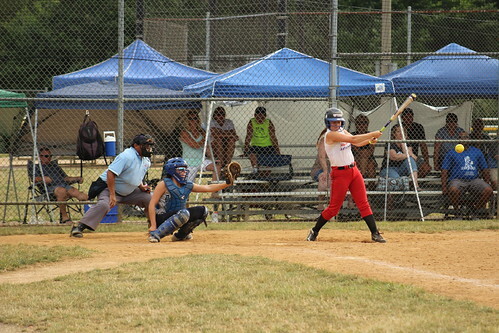 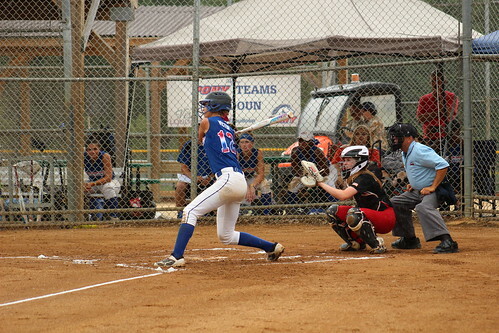 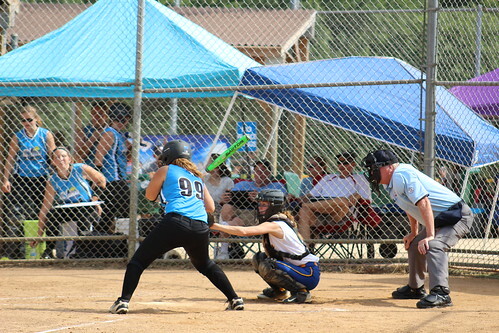 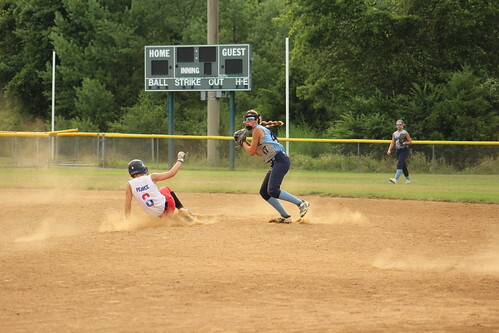 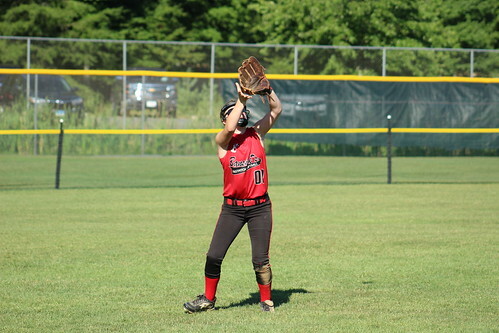 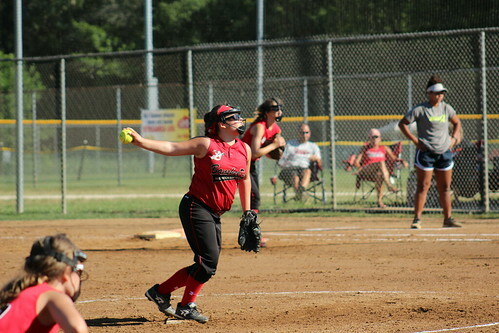 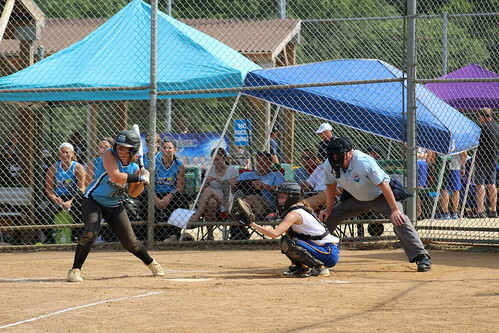 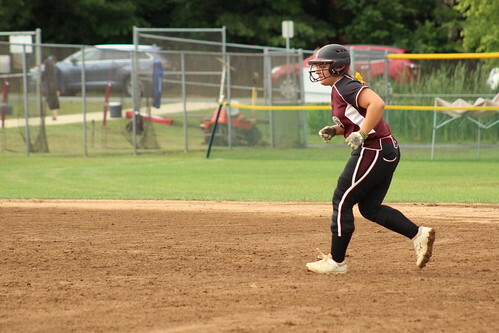 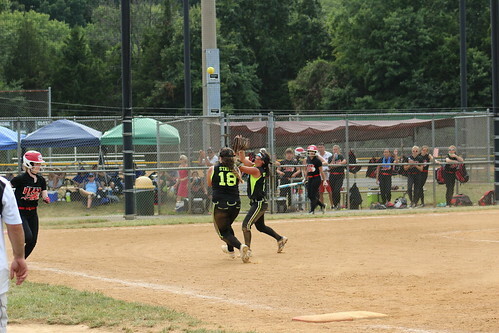 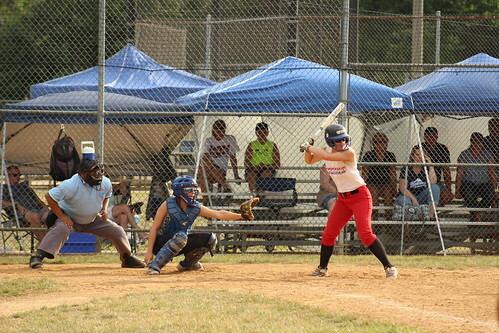 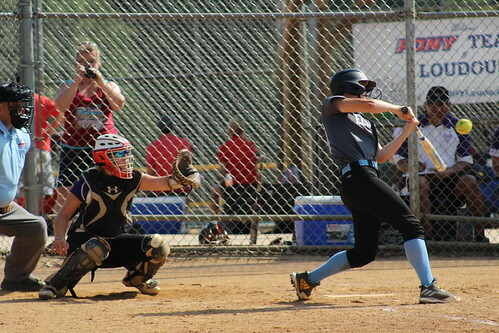 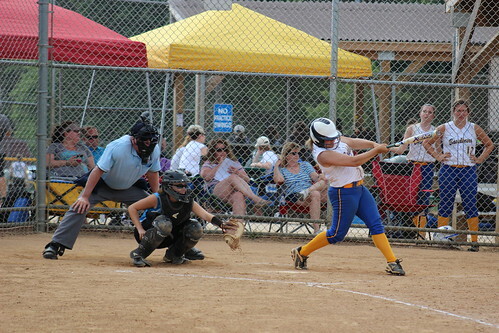 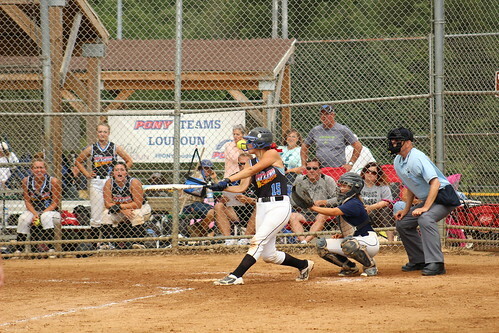 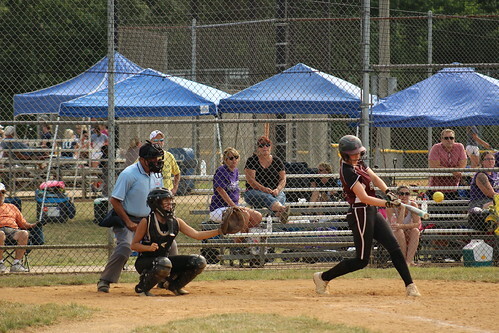 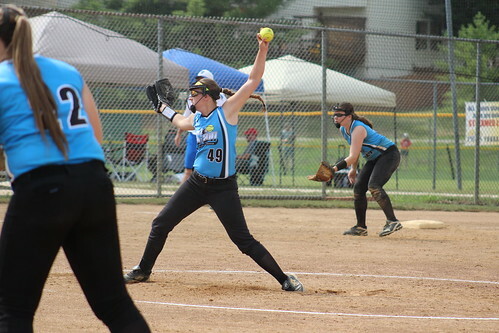 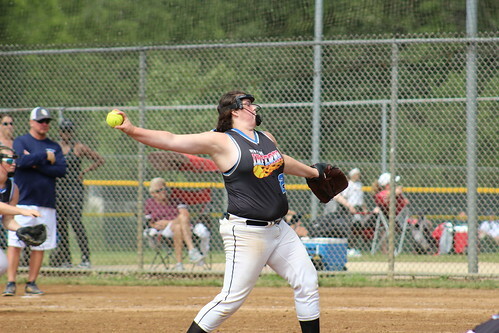 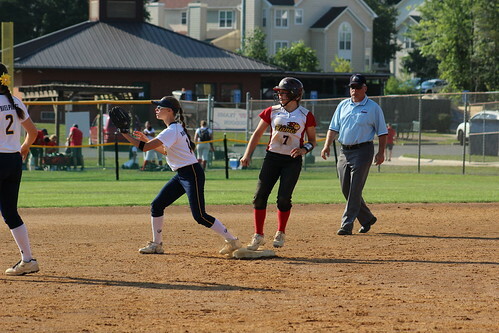 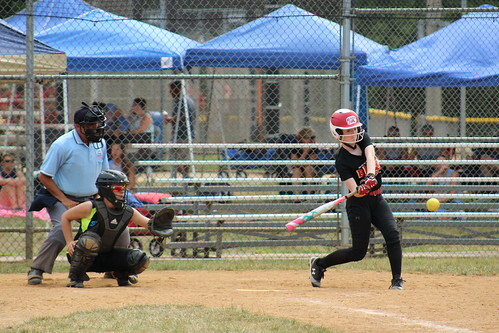 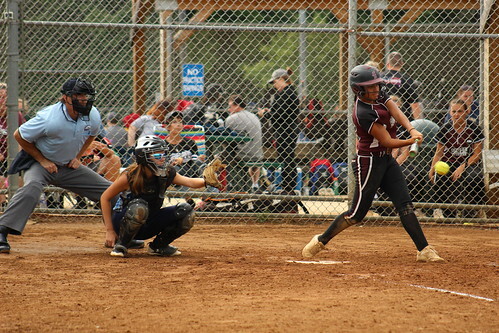 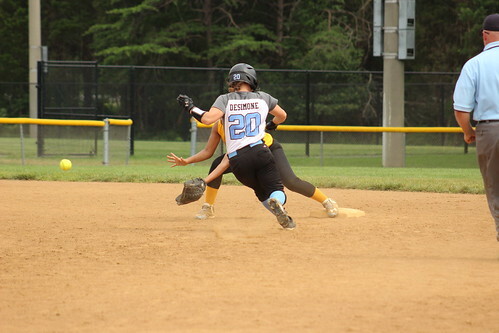 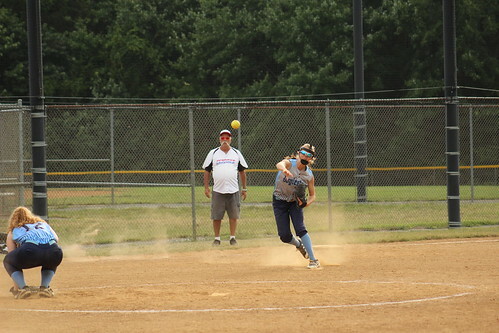 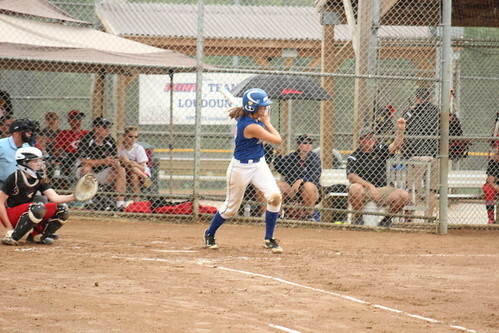 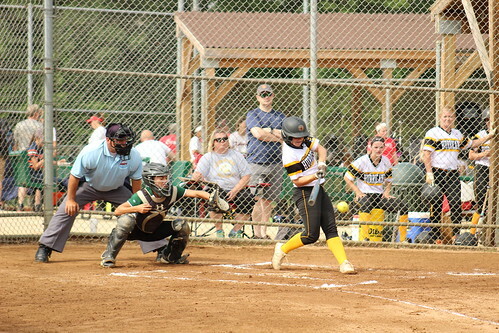 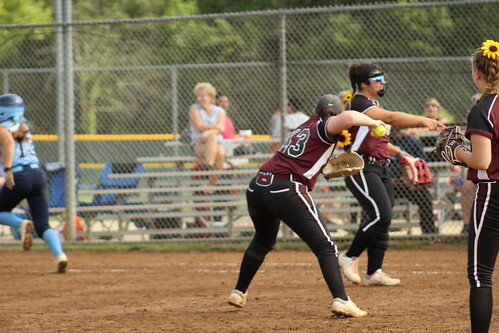 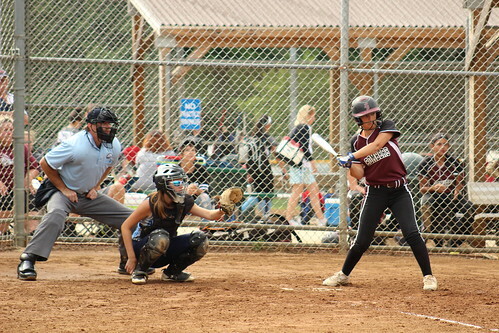 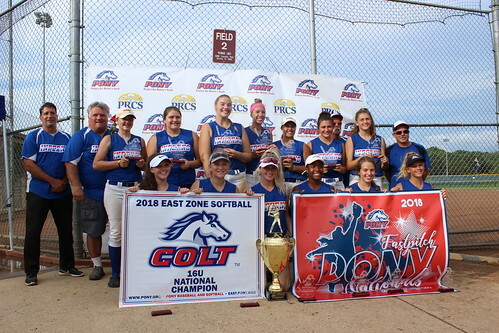 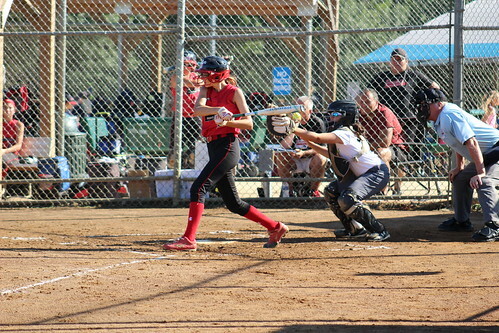 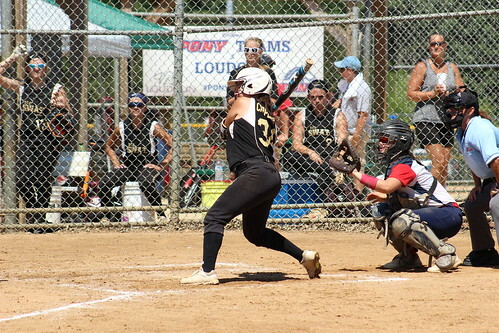 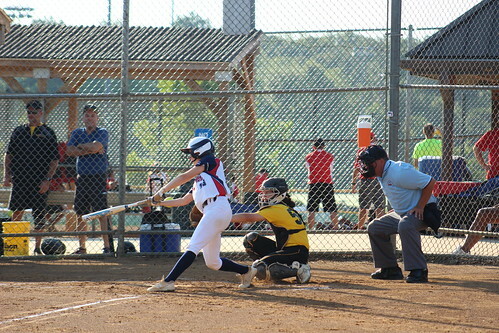 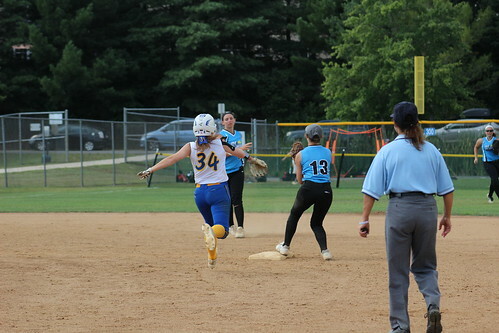 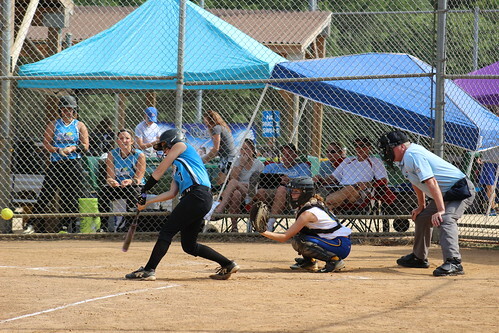 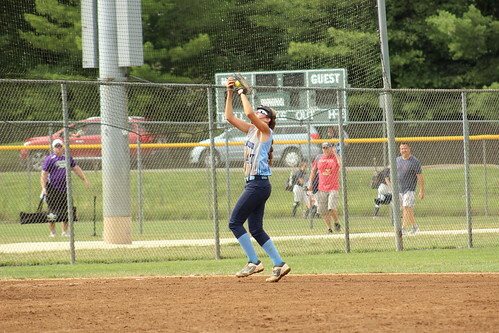 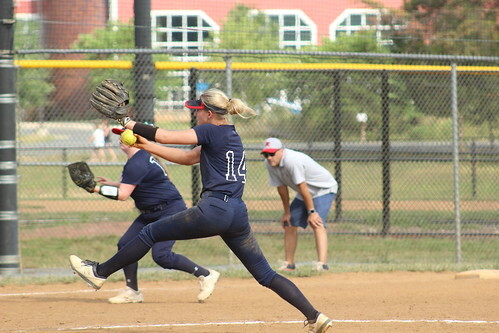 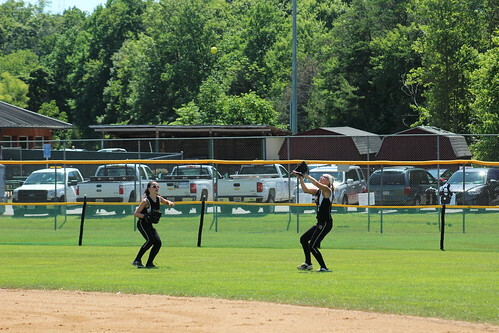 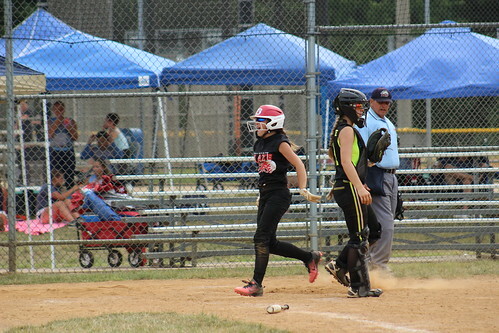 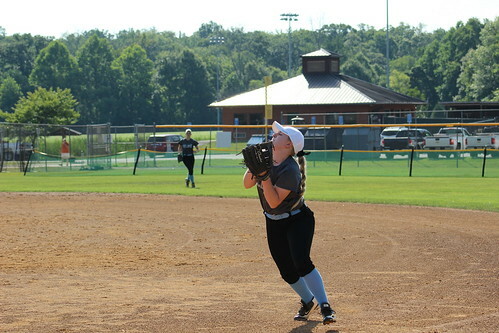 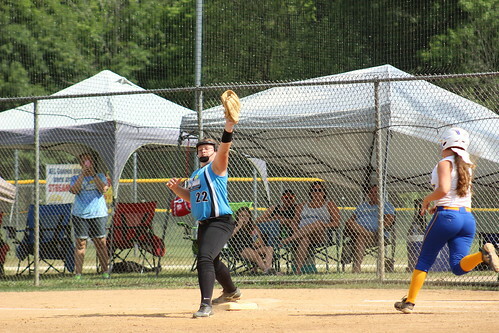 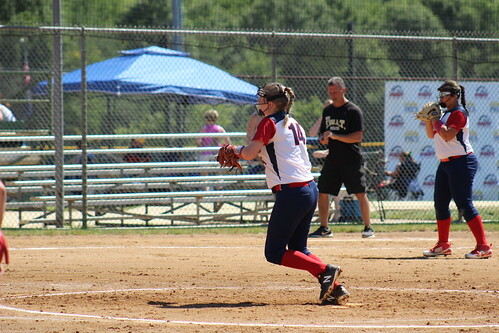 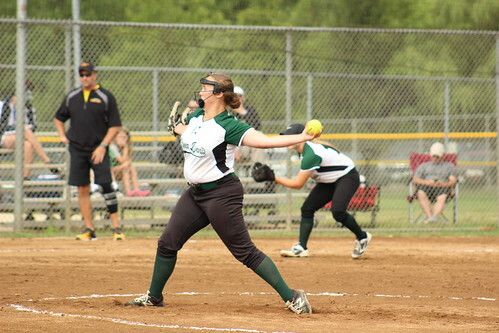 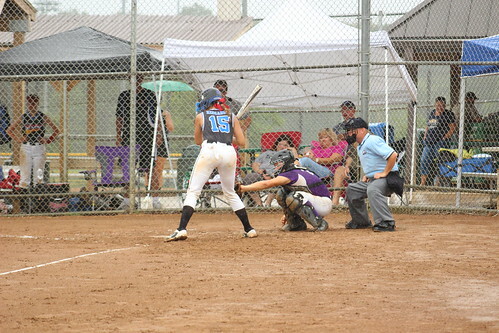 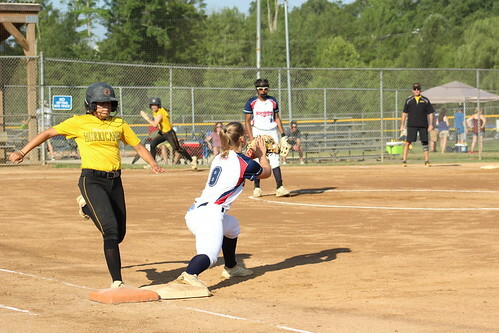 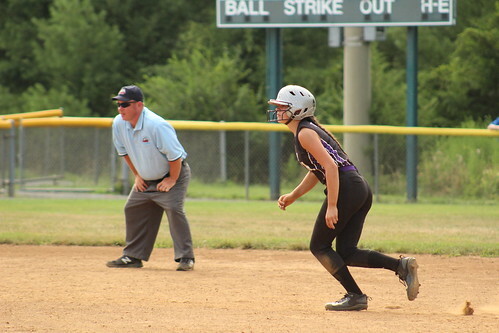 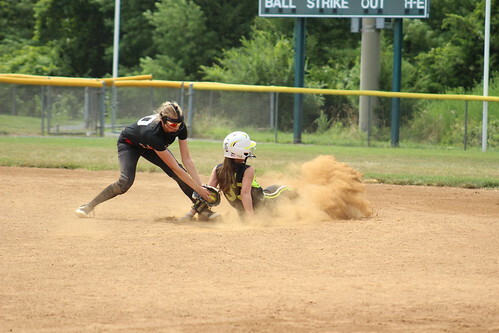 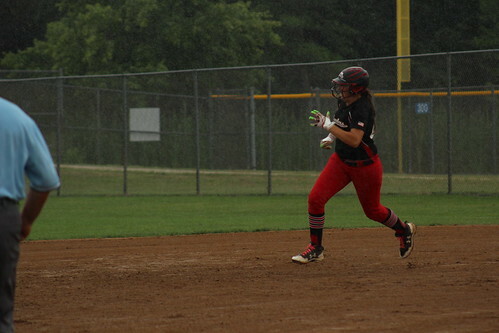 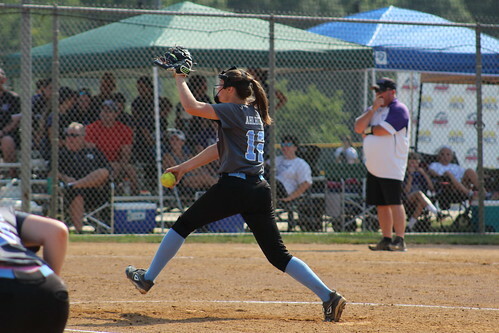 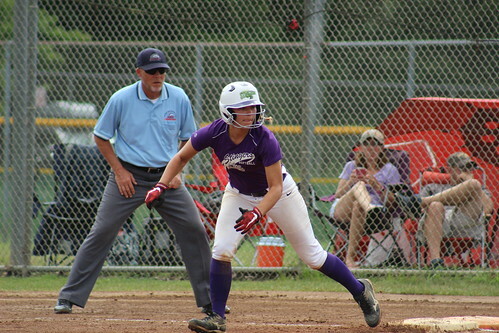 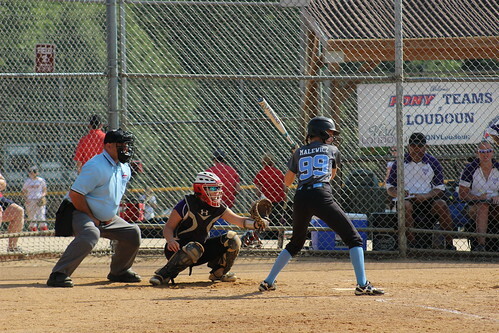 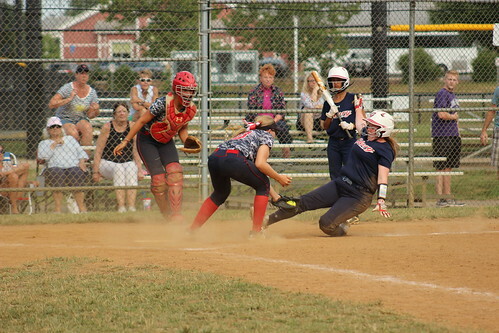 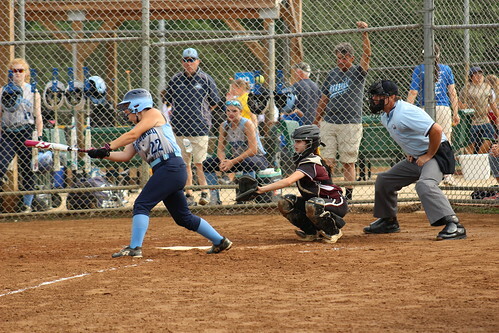 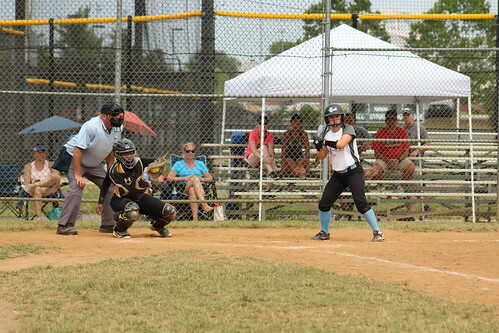 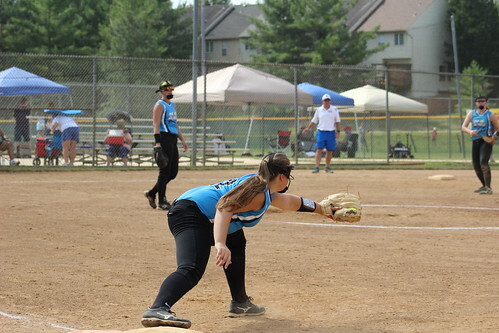 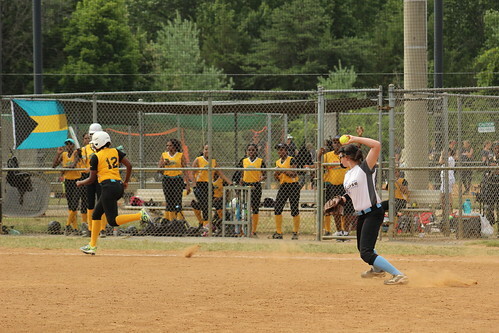 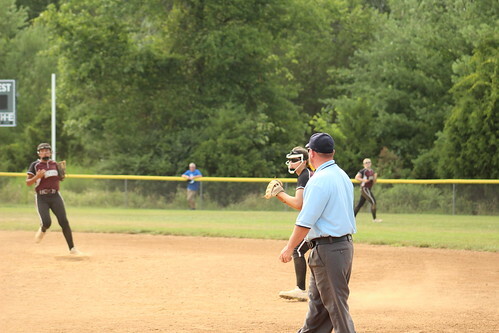 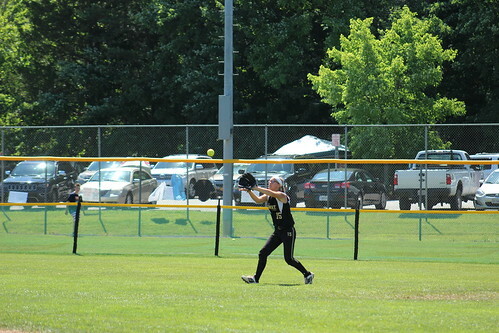 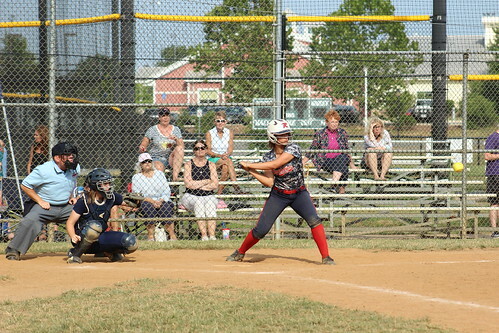 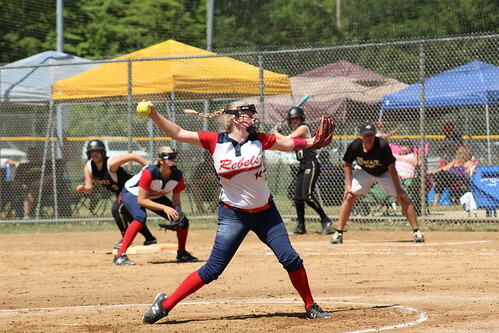 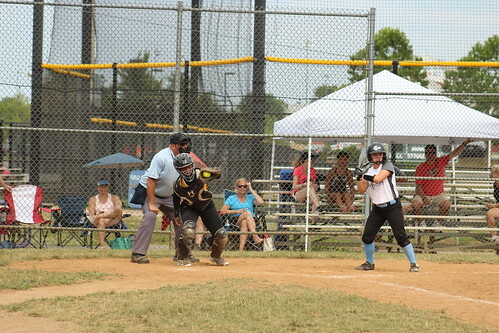 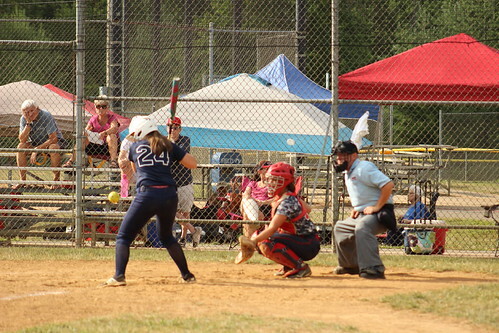 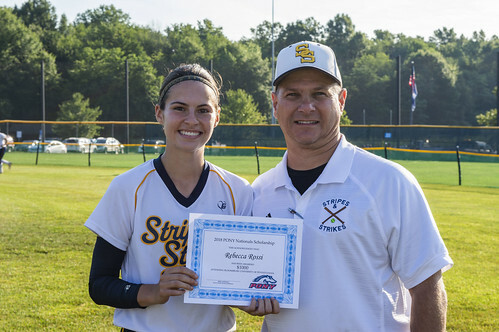 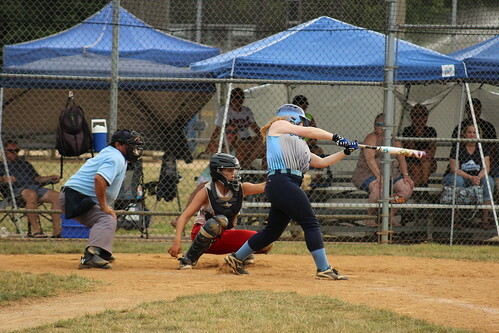 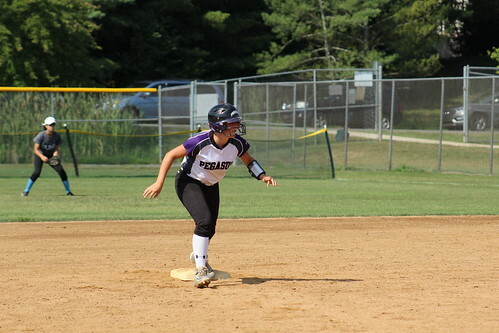 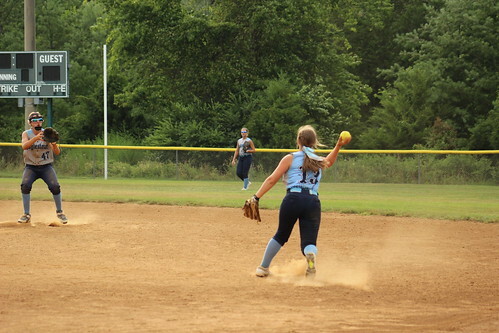 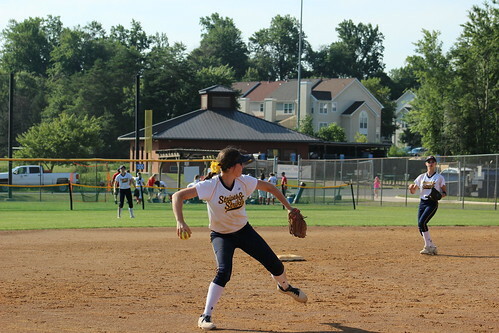 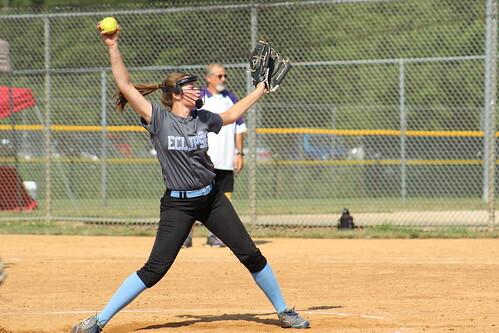 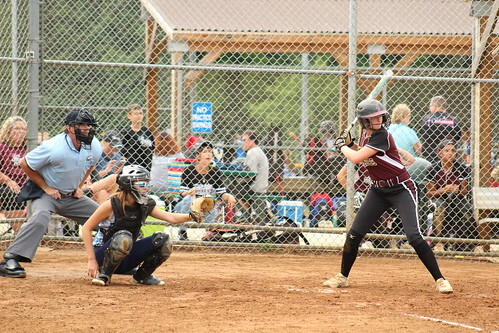 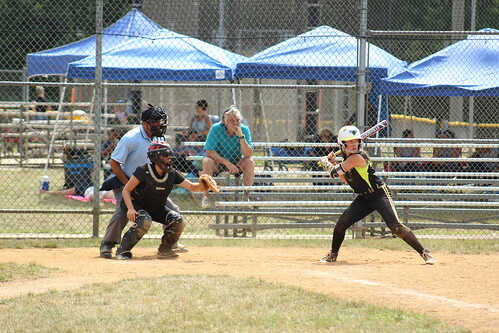 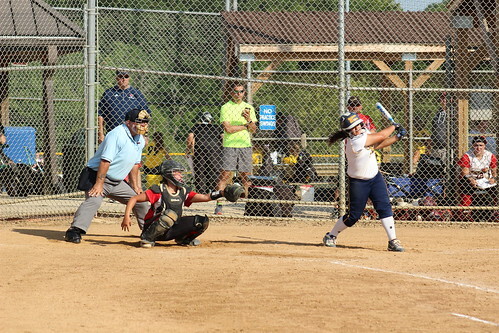 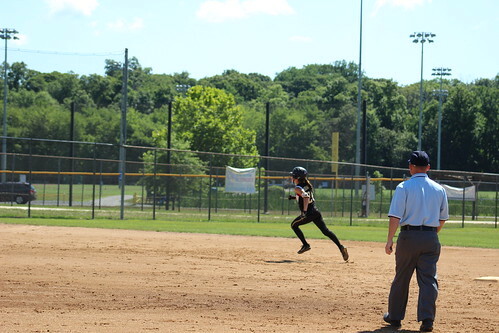 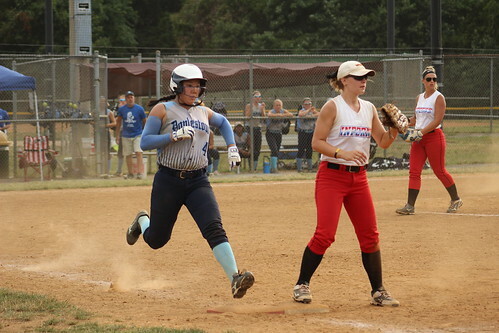 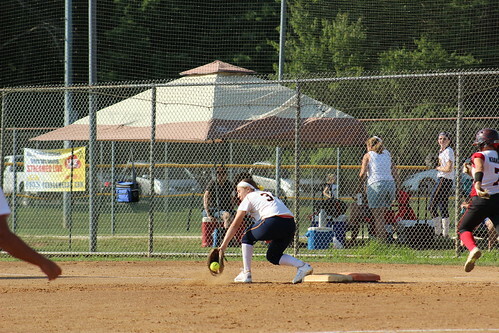 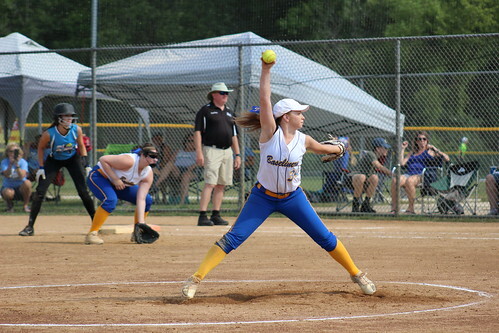 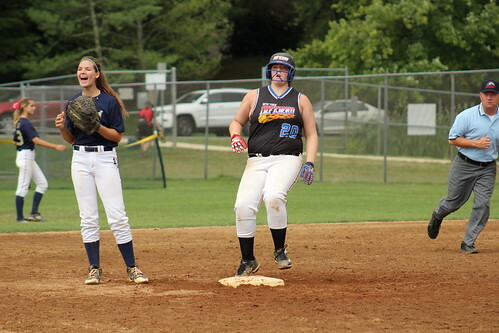 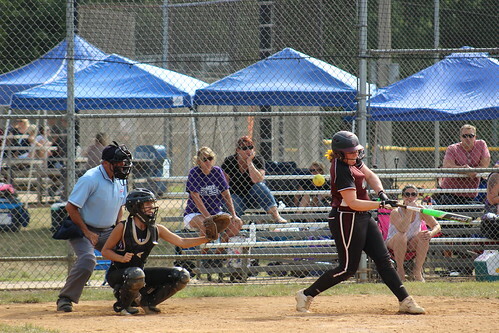 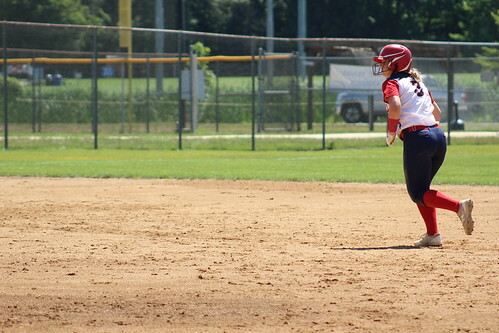 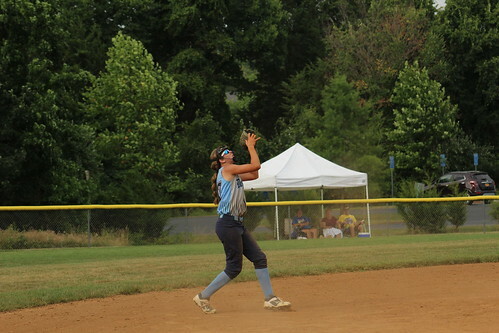 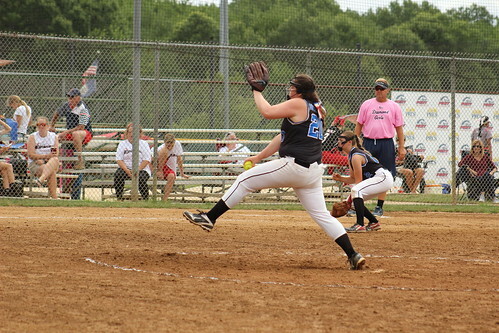 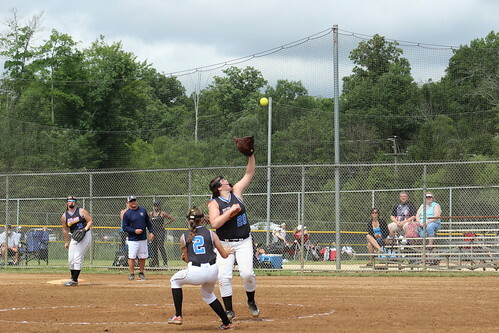 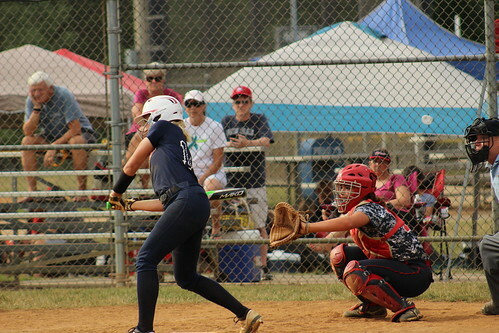 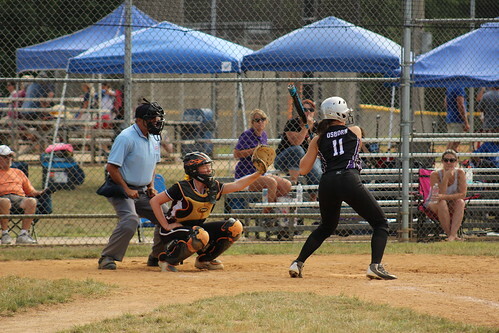 Unlike most softball games, time was of the essence as the East Zone Softball Nationals were coming to a close for the Colt 16U division. 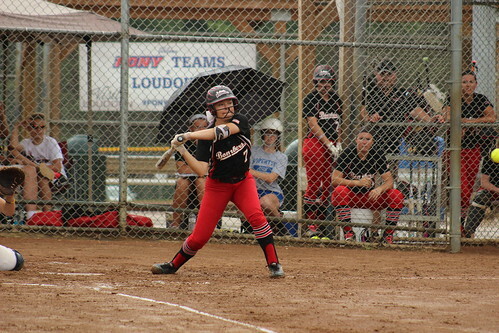 The night before championship Sunday, Sterling Virginia, received about five inches of rain and with more in the forecast for Sunday afternoon. 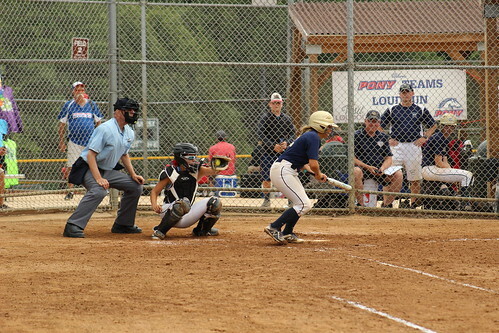 In preparation, all games were set for an hour and 20-minute time limit. 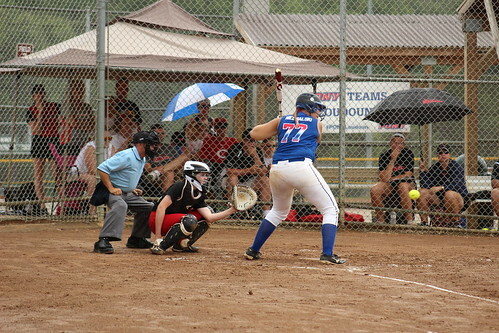 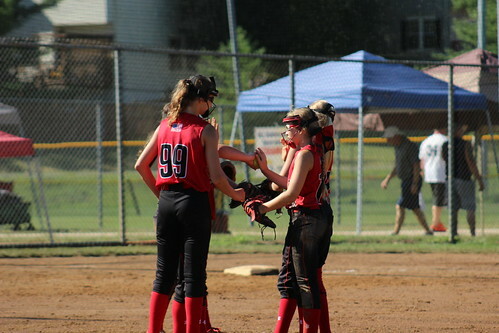 After fighting through a rain delay during the championship game, the New York Inferno kept up their high scoring pace. 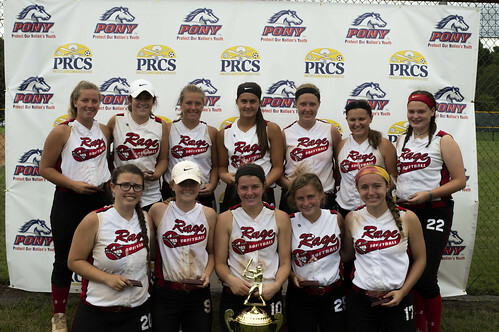 The team out of Buffalo, New York took home the championship for the second-straight year by a 11-1 victory. 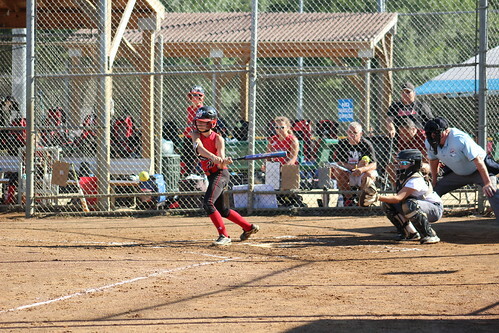 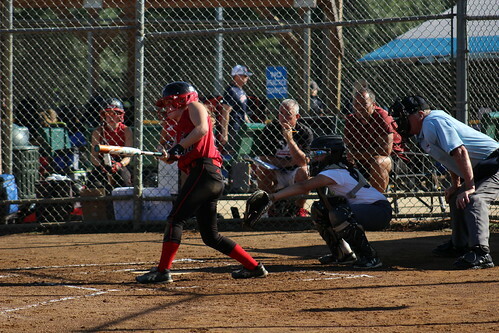 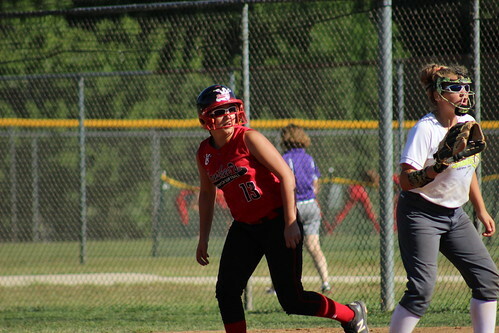 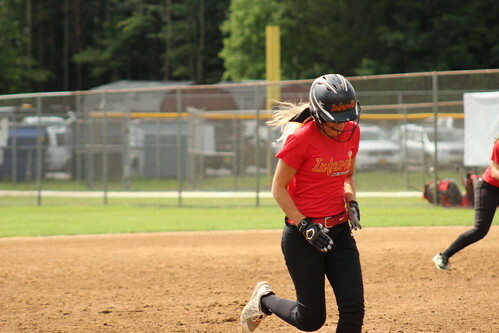 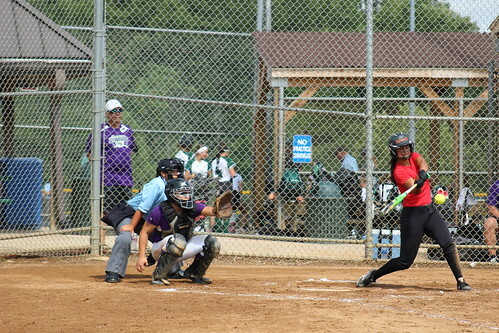 The Inferno started the high scoring affair in the first inning as Sydney Bielicki scored on a single to left field. 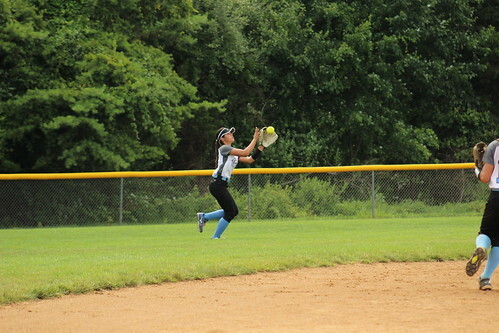 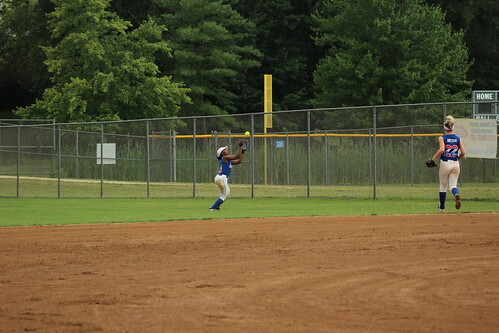 Iris Kahris added another run thanks to the sacrifice fly by Leah Victor driven to centerfield. 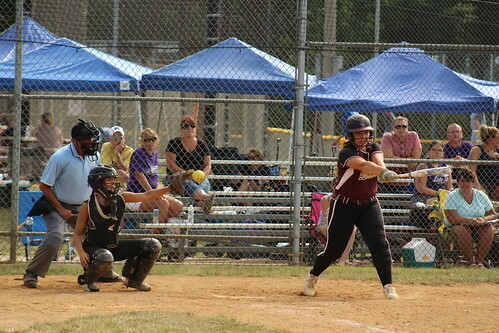 Cianna Braymiller capped off the scoring in first inning with a RBI single to right field. 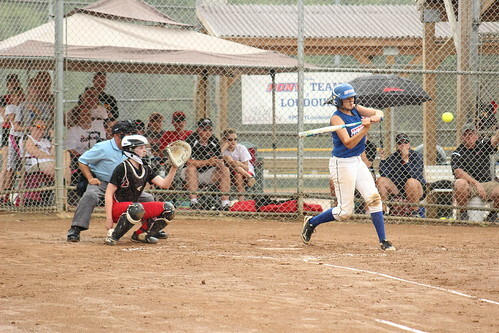 The Bombers responded in the bottom of the first to cut the lead down. 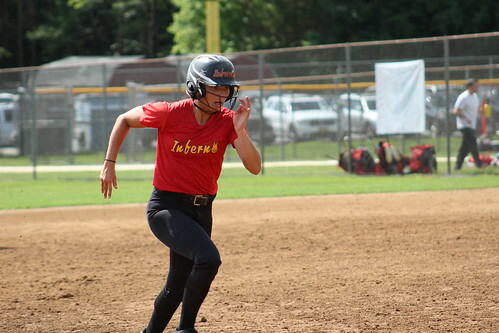 As they headed into the second inning up 3-1, the Inferno added fourth run as Madison Niedbalski drove a ball into left-center bringing home Bielicki for the second time in as many innings. 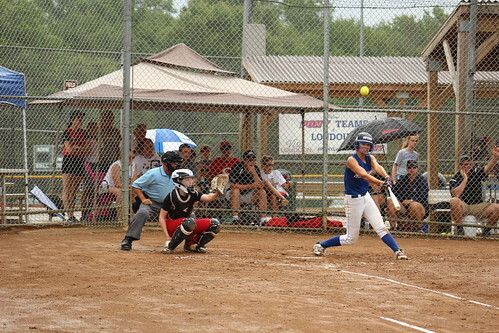 Before the start of the third inning, the 16U had the same fate as the 18U and entered a rain delay. 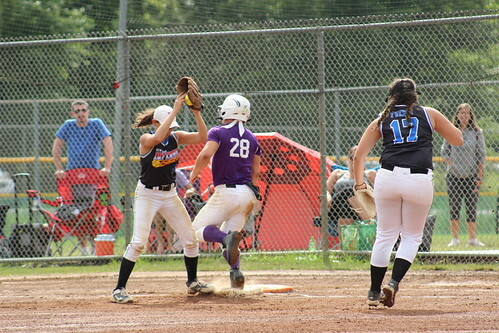 Once, the 18U game ended, it was time for the 16U to finish their contest. 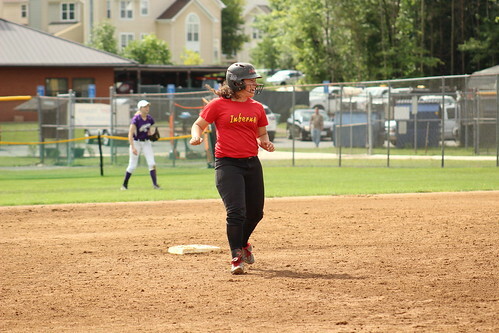 To start the third, the Inferno picked up right where they left off adding five runs. 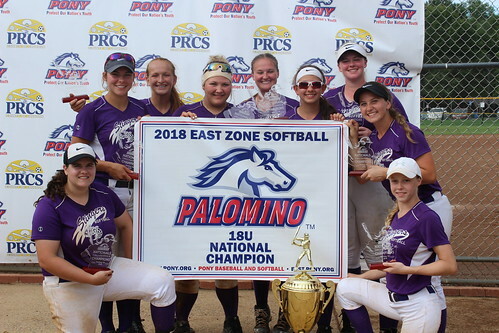 The Inferno finished the game in the fourth with two more runs to repeat as 16U East Zone Softball National Champions with the 11-1 win. 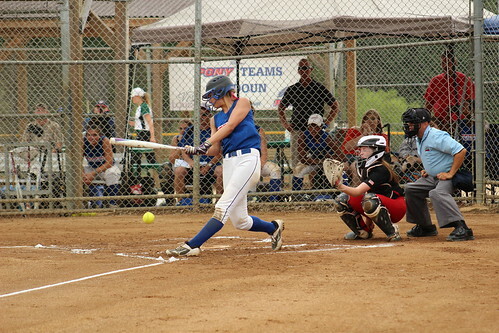 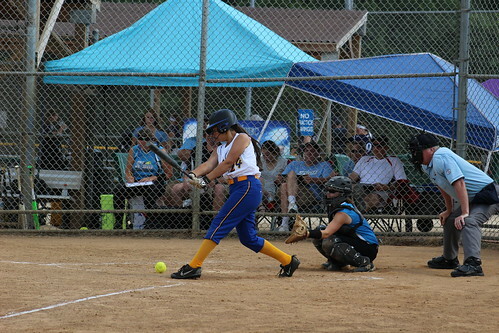 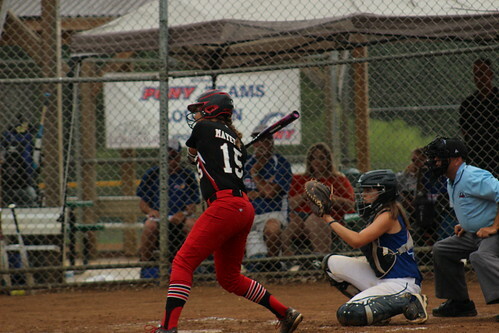 Bielicki officially did not have an at-bat as she reached base all four innings via walk and scoring three times. 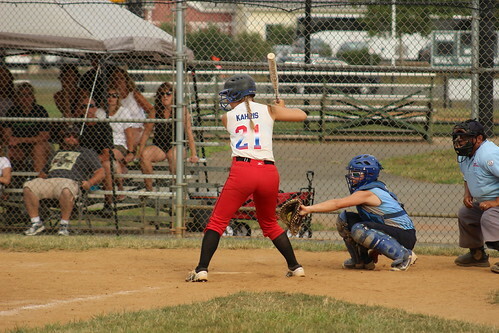 Kahris tied for the team lead with three runs batted in, going one-for-two with a single and two walks. 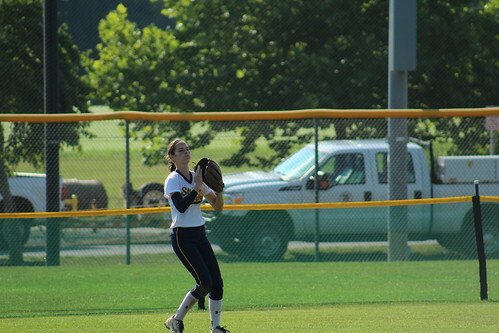 Olivia Anderson went the full distance, allowing two hits and the lone run in four innings of work. 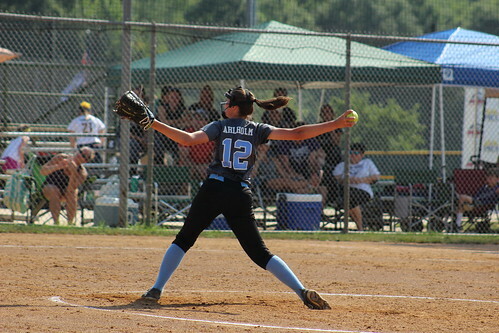 Anderson also punched out six batters while only allowing one walk. 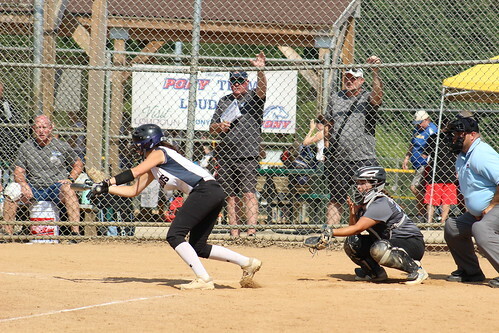 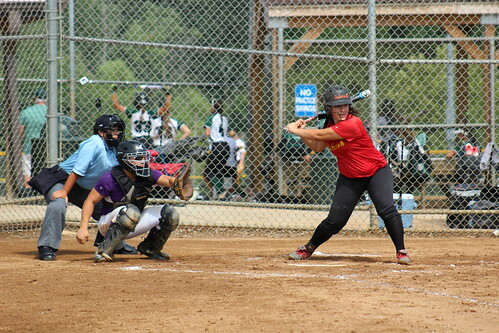 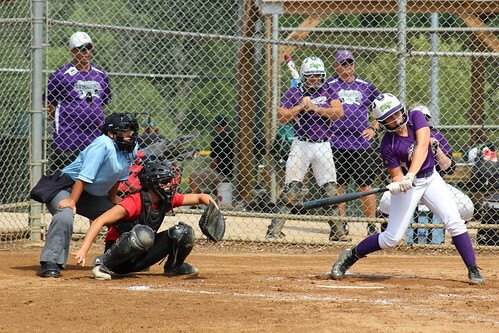 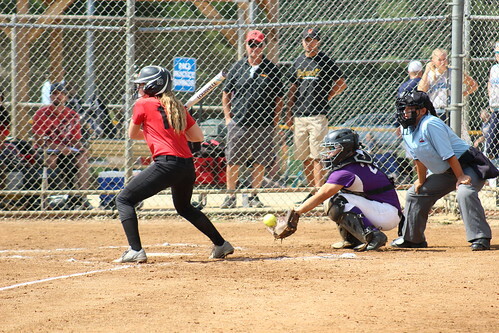 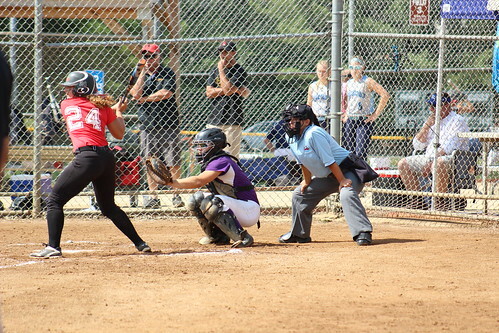 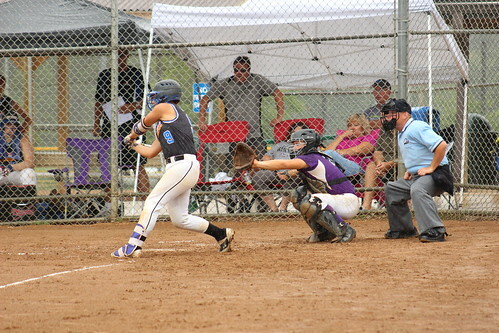 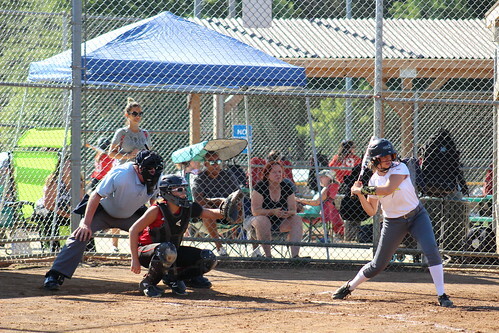 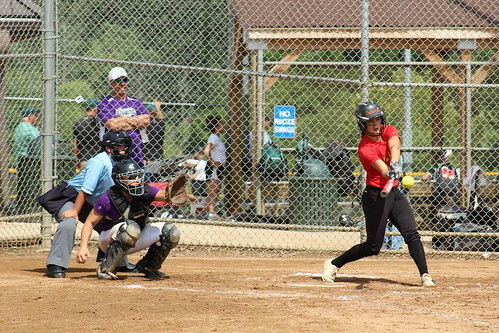 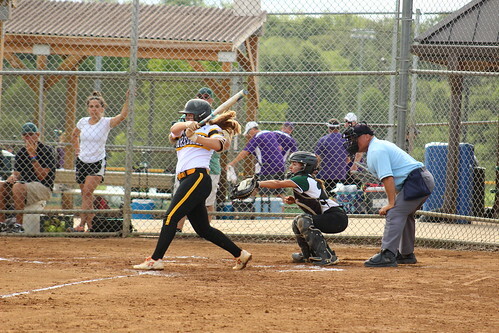 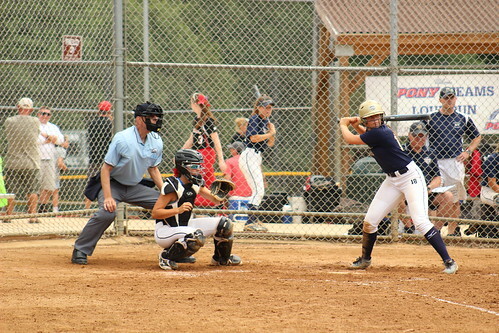 The Keystone Stingers reached their way to the Palomino 18U Championship Game with comeback wins in the quarter and semifinals by taking leads in the sixth inning in both games. 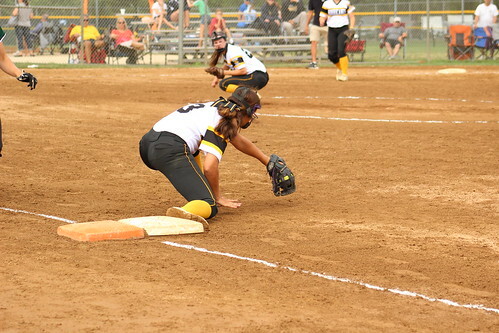 The championship game, however, was a different story for the Stingers as they took an early lead and never looked back against the New York Inferno. 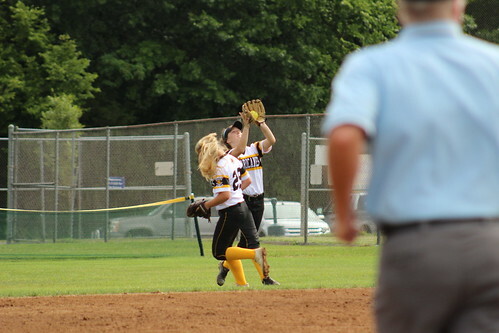 Stingers took the final, 13-1. 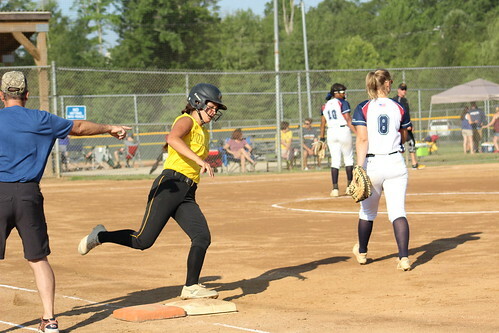 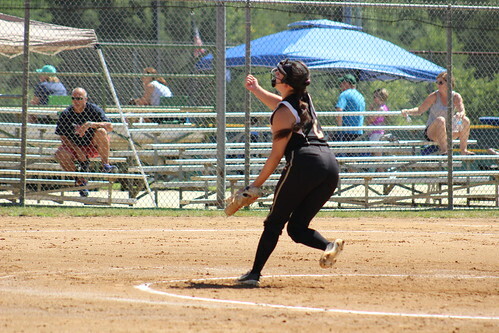 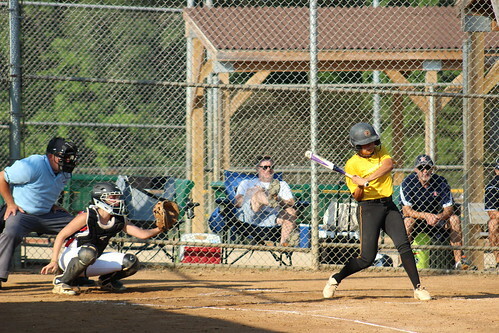 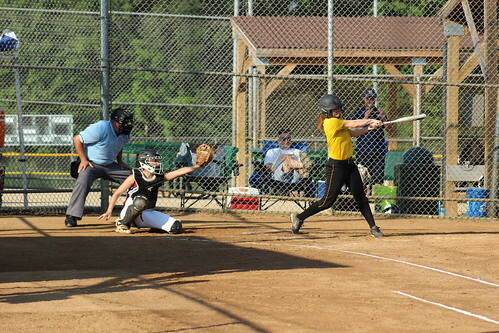 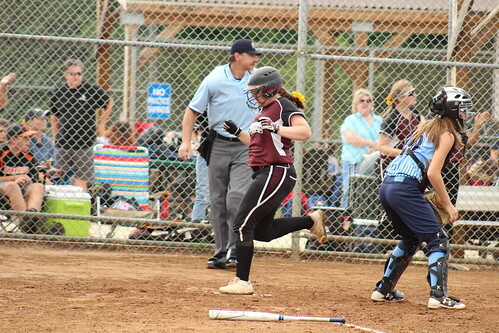 The Stingers broke the ice in the second inning as Atlanta Milliron reached on a bunt single as Brooke Colledge scored from third base. 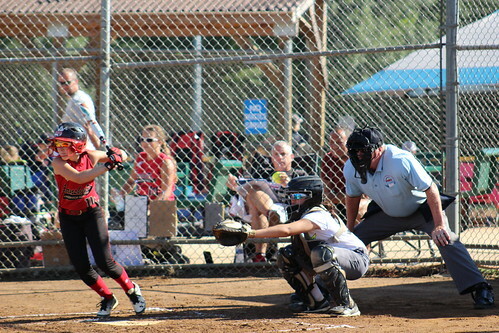 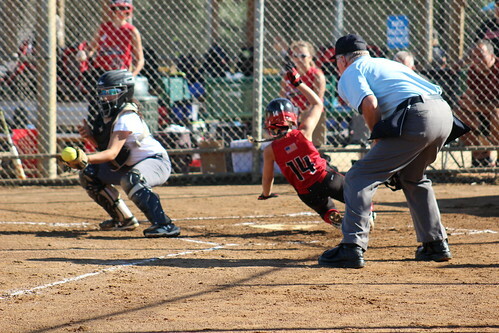 Milliron came around to score later in the inning as Brooke Bollman drove a ball into right field for a single. 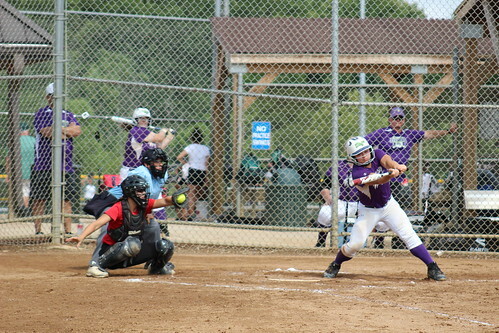 In the next inning, Keystone added to its lead with run scoring hits by Colledge and Milliron. 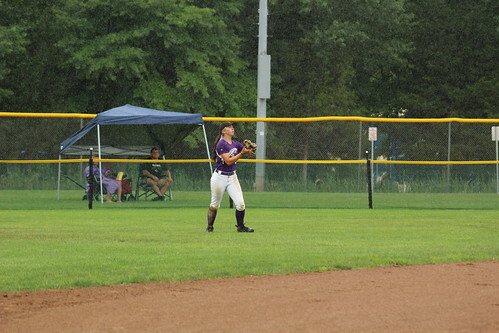 As the rain began to fall as the game headed to the bottom of the third, the Stingers increased their lead to five. 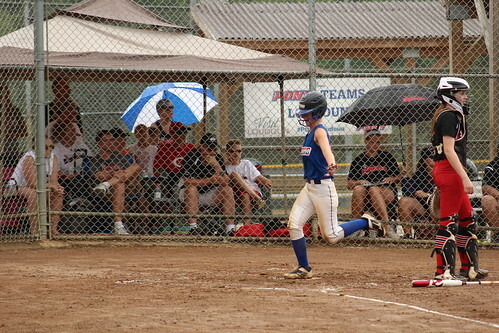 Before the teams took the field to start the fourth inning, the game was delayed due to the rain increasing and making the surface unsafe. 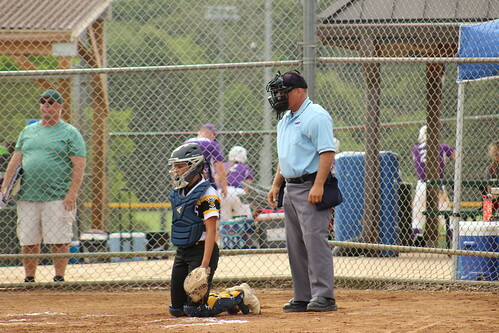 After about an hour of waiting, the Loudoun County Parks and Recs crew pulled off its magic and we were ready to go. 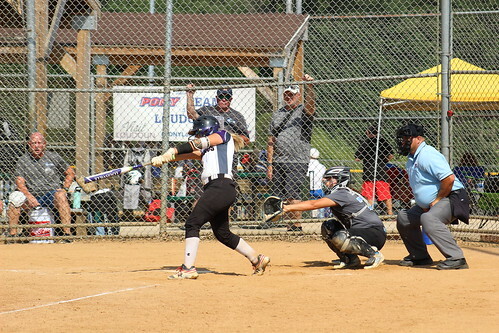 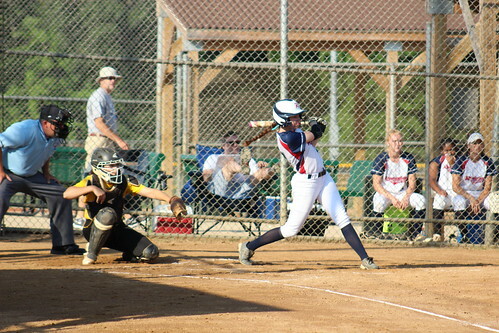 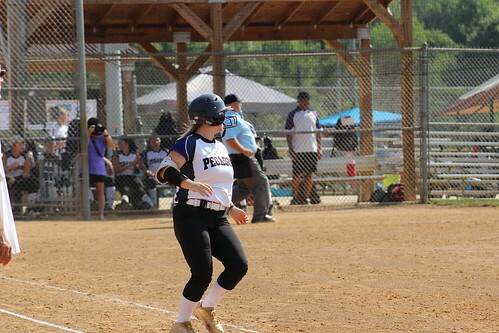 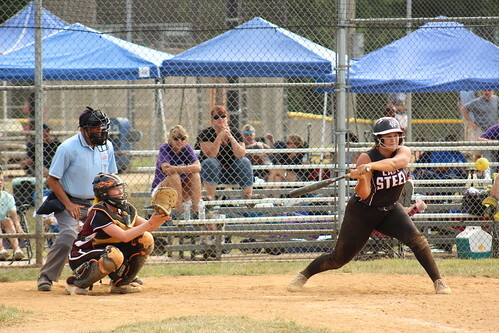 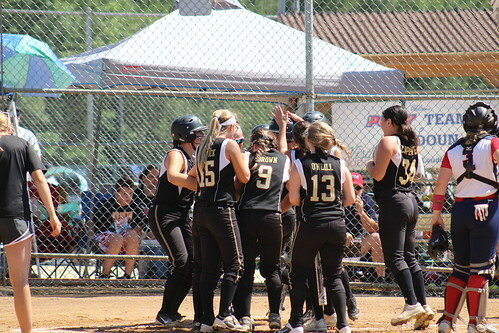 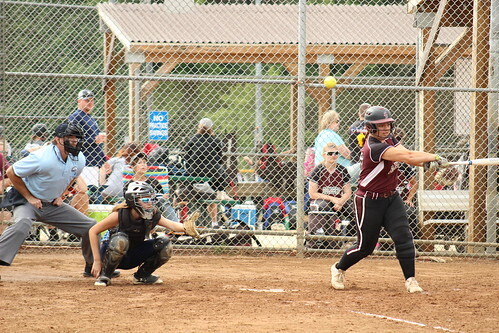 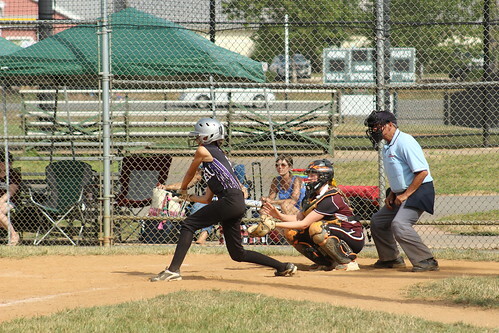 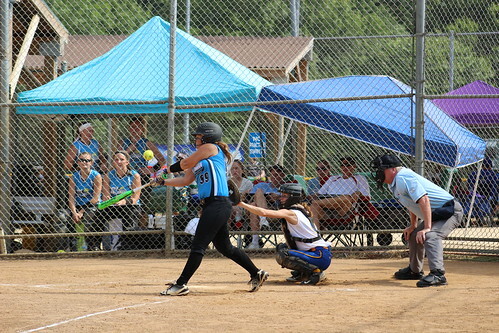 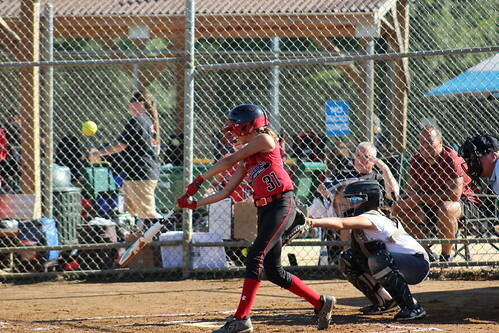 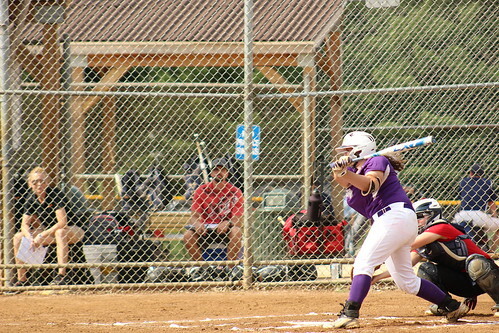 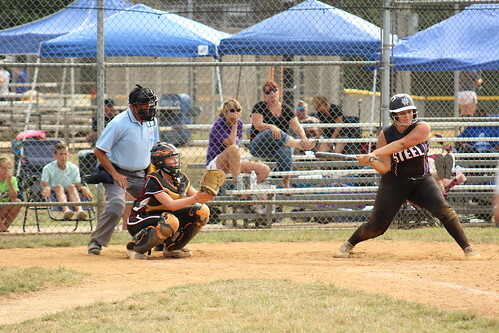 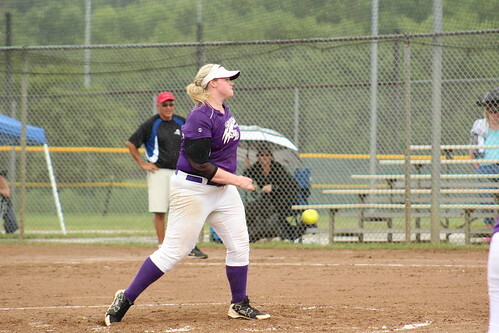 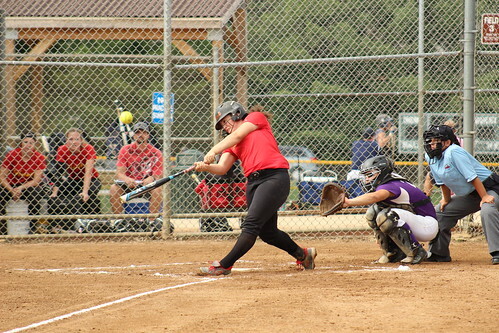 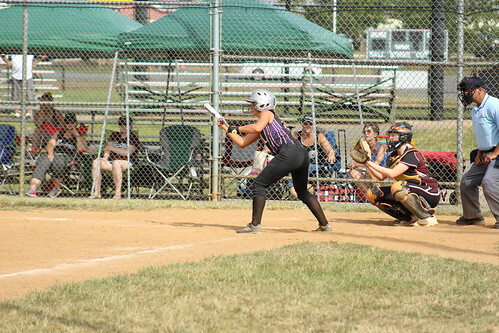 In the fifth inning, Keystone opened the flood gates and added eight more runs capped off by a grand slam hit to right field by Cameryn Feathers. 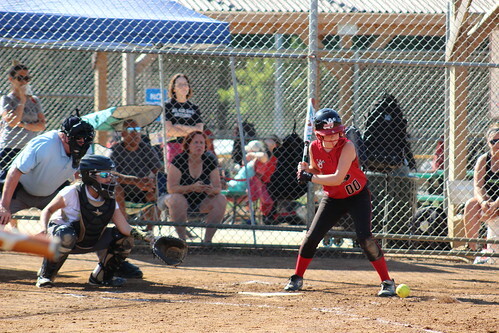 The Inferno got on the board in the bottom half of the fifth but that’s where the game would end. 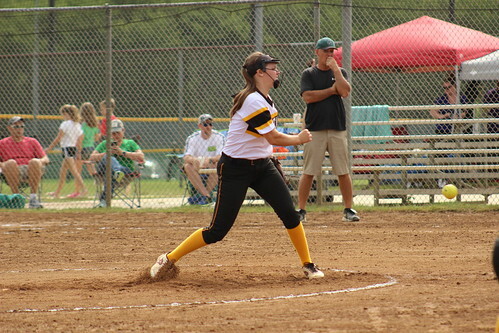 In the Stingers’ 13-1 victory, starting pitcher Alexa Young went all five innings, giving up five hits, the lone run with two strikeouts. 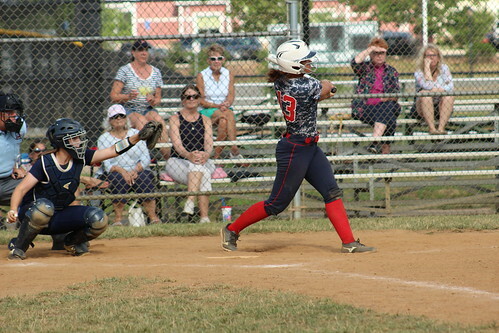 Feathers led the offense by going two-for-four with four RBI, all coming from the grand slam in the fifth. 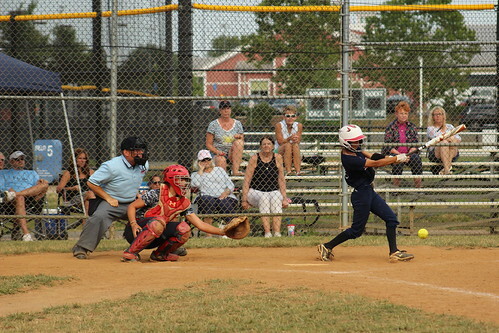 Milliron was second on the team with three runs batted in on two hits. 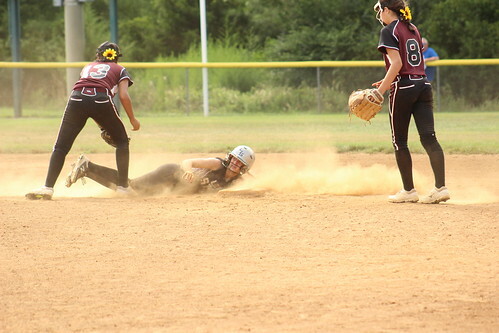 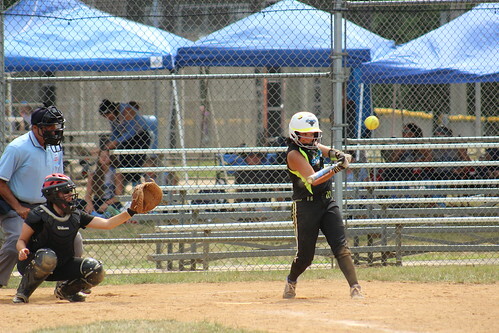 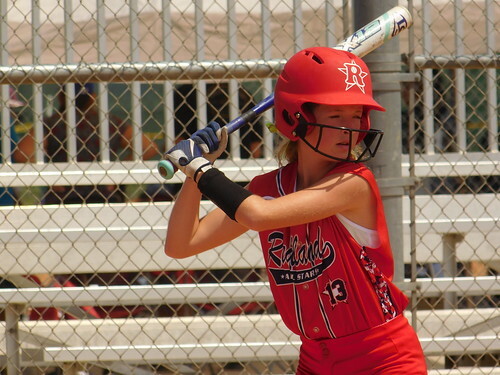 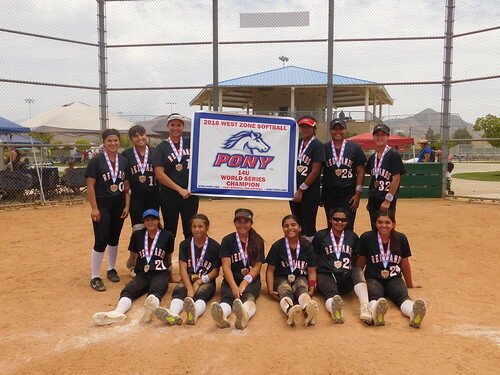 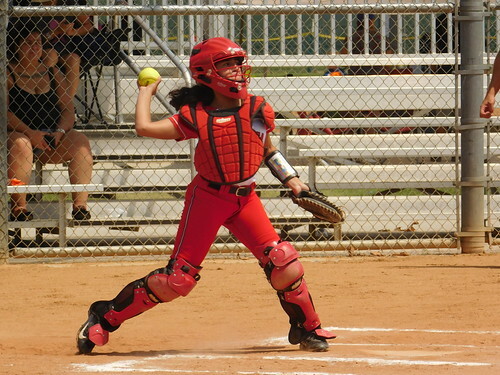 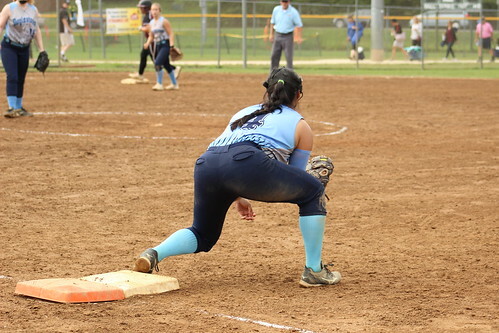 Take a look back at the 2018 PONY South Zone Softball World Series in Laredo, Texas by browsing the section below. 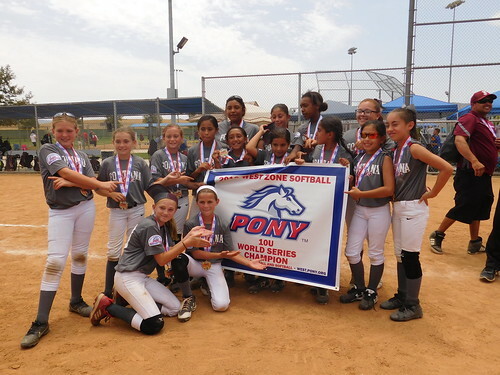 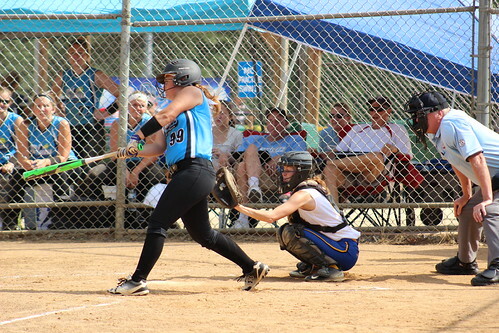 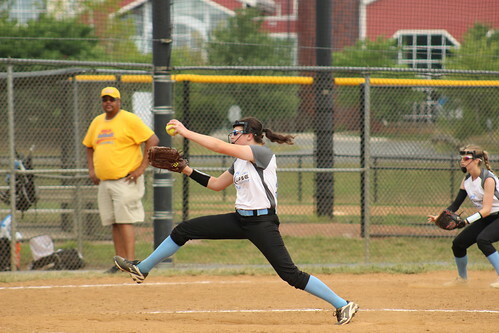 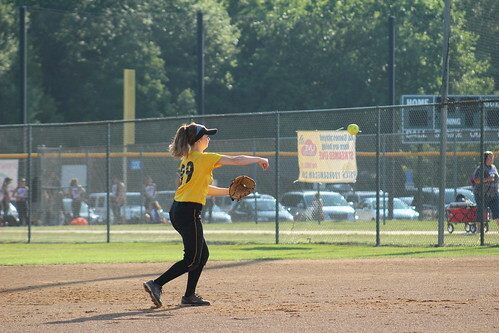 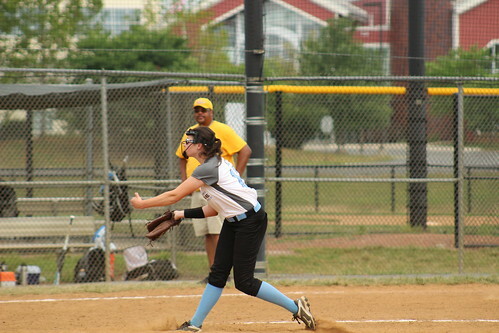 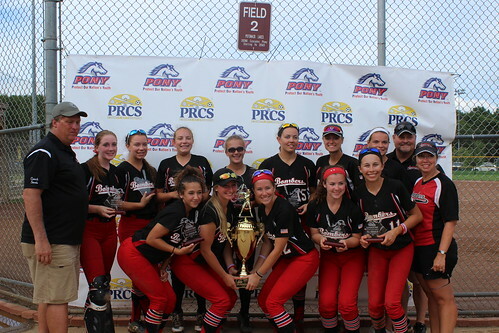 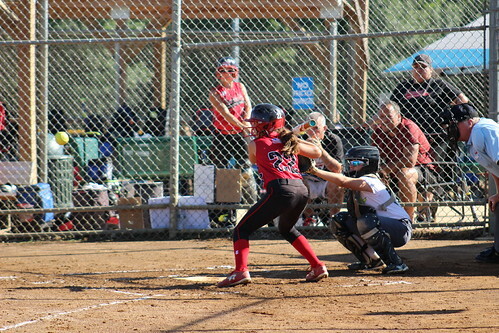 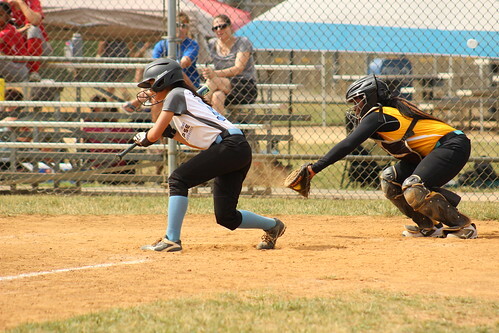 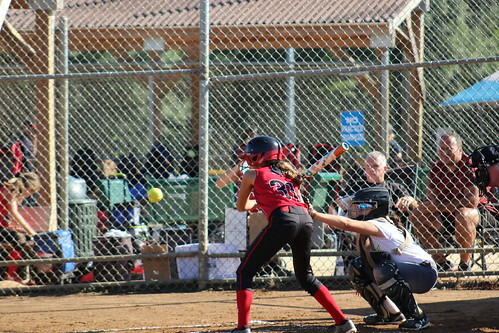 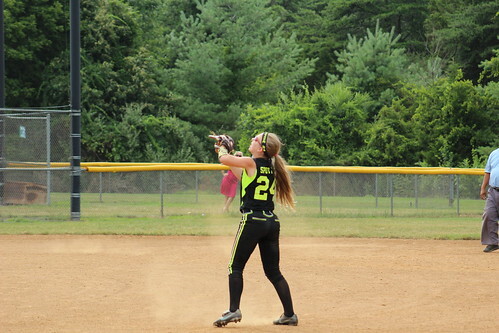 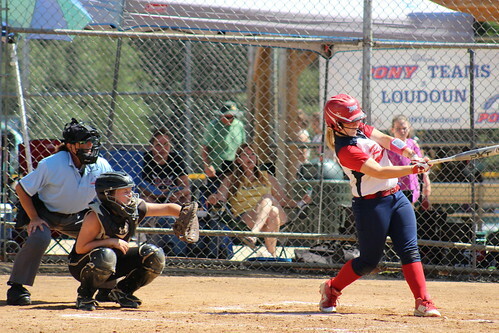 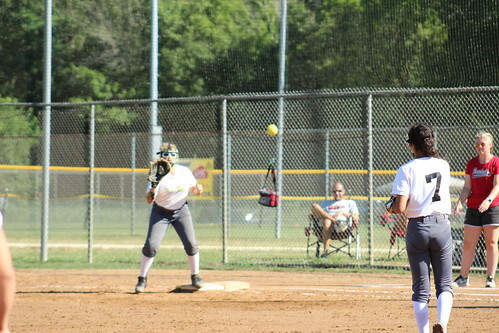 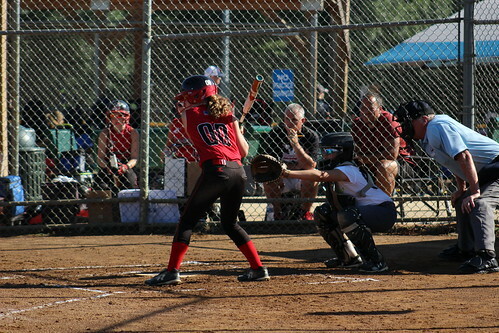 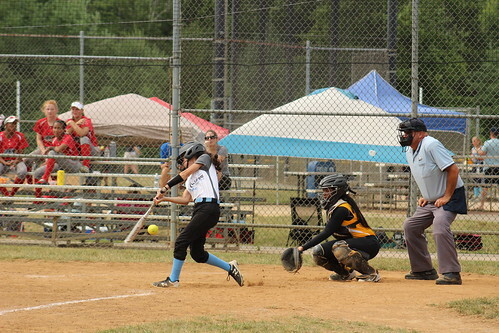 Visit the official PONY South Zone Softball World Series Showcase website here. 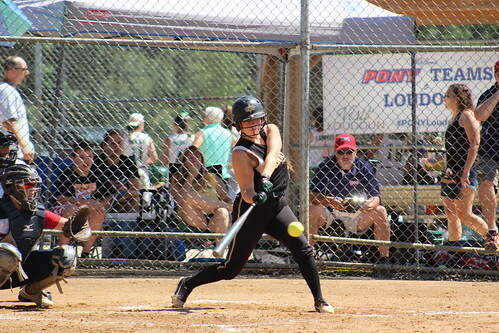 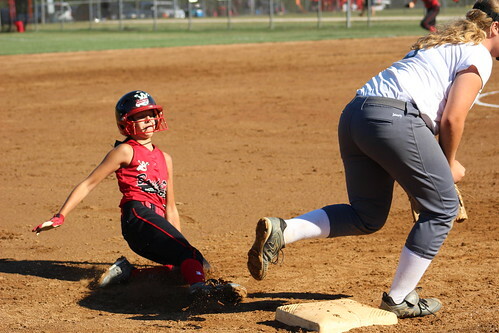 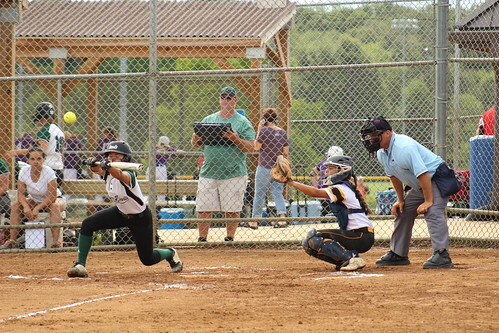 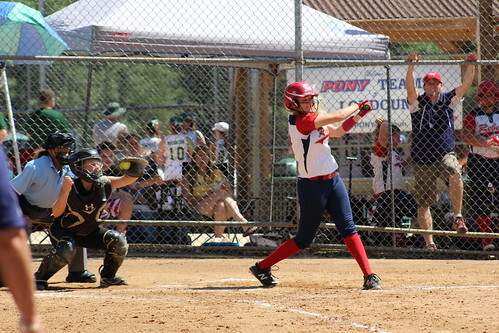 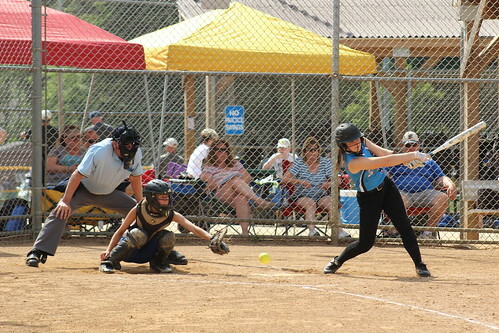 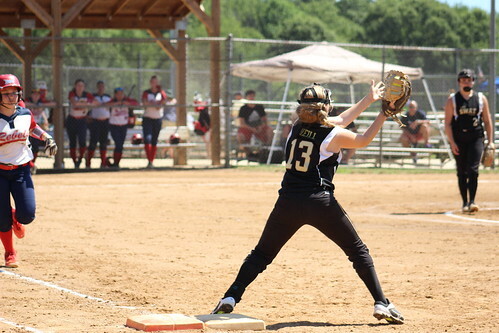 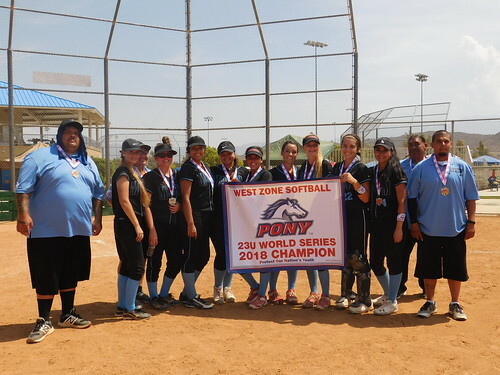 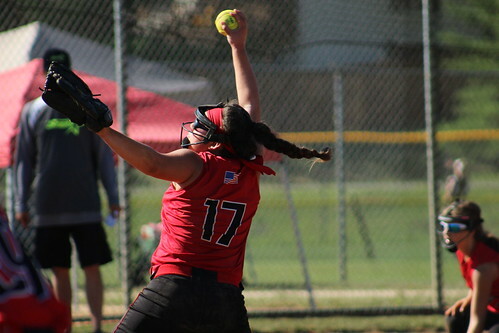 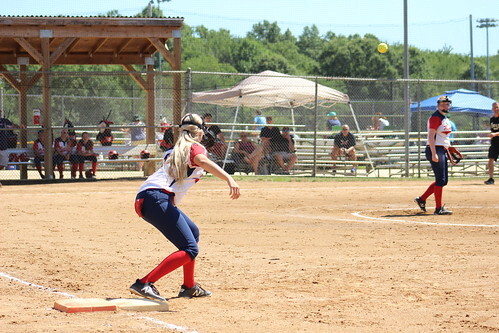 Take a look back at the 2018 PONY West Zone Softball World Series by browsing the section below. 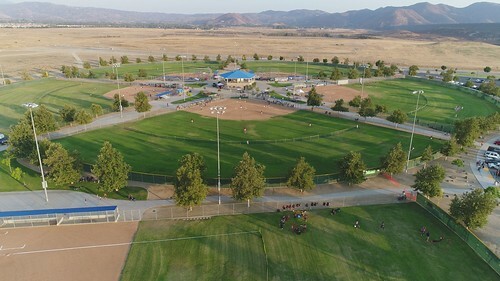 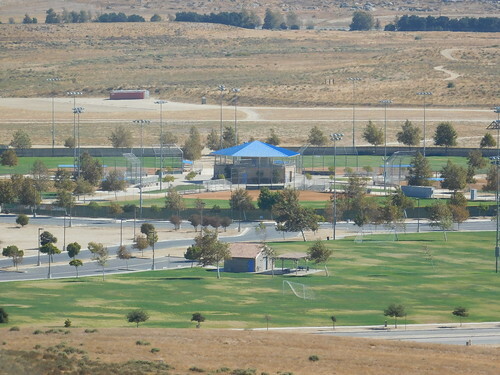 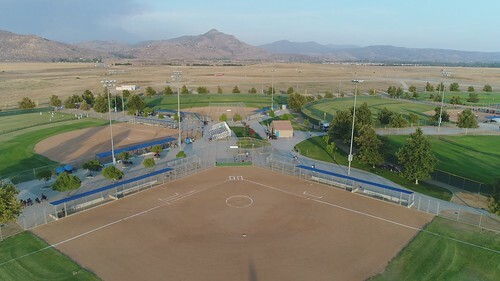 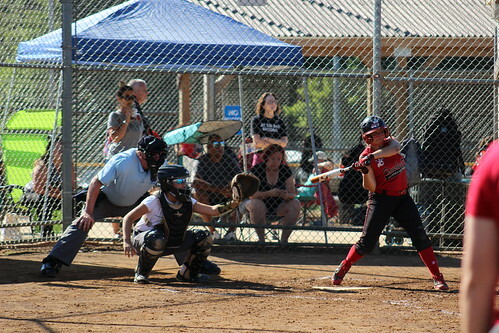 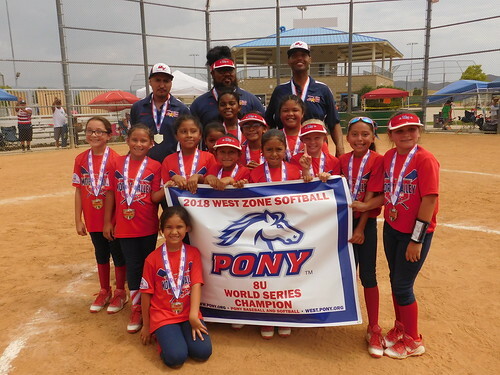 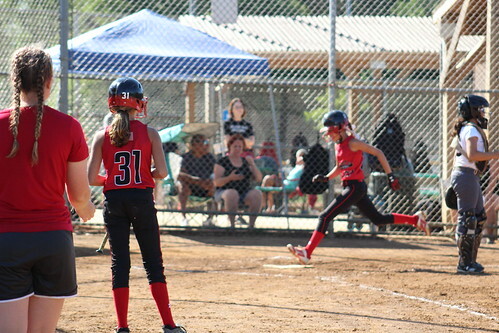 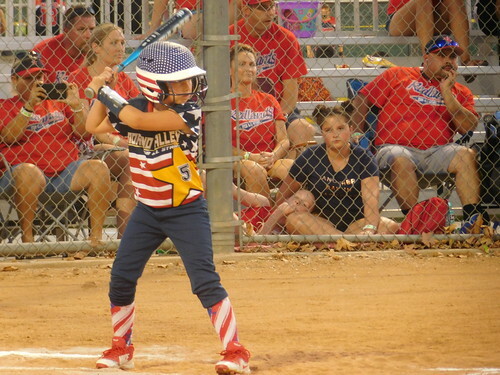 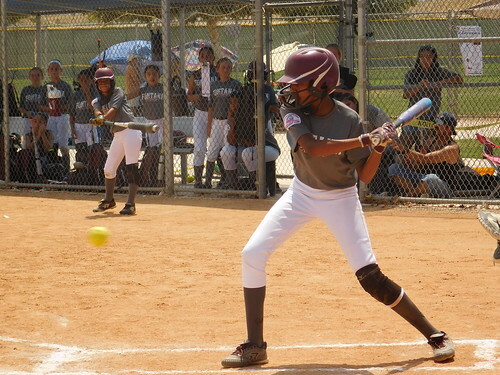 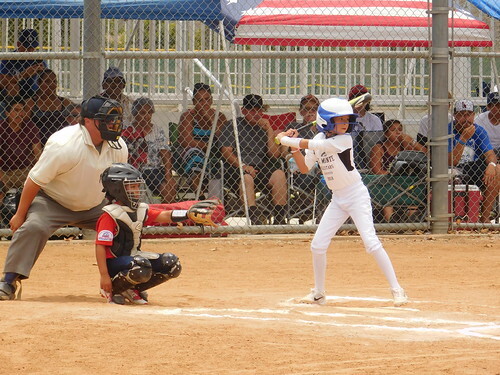 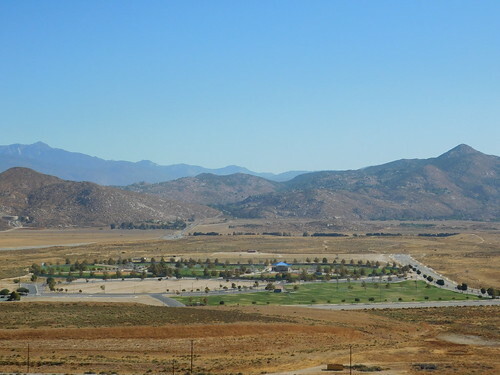 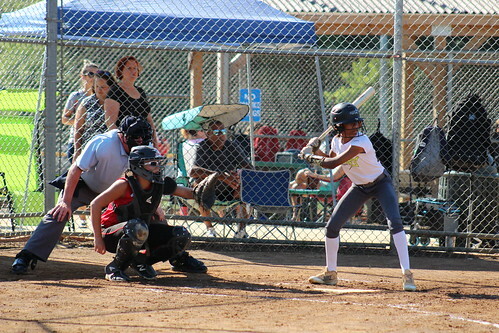 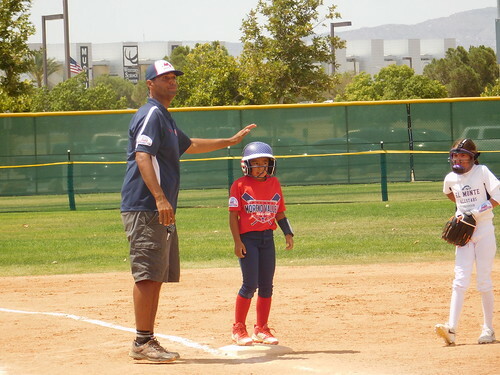 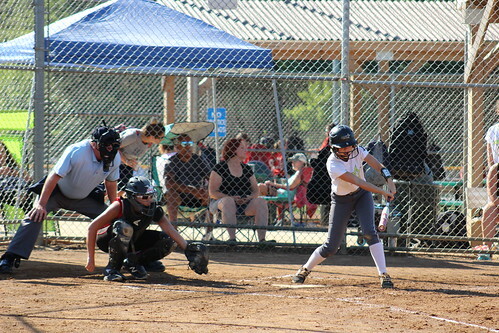 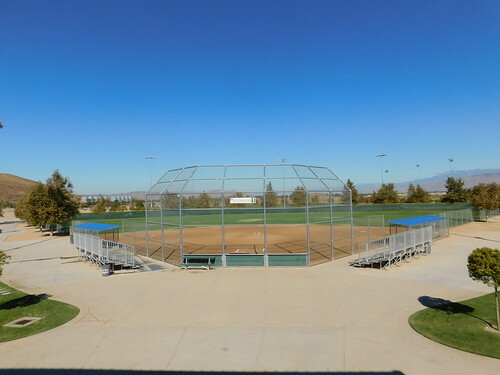 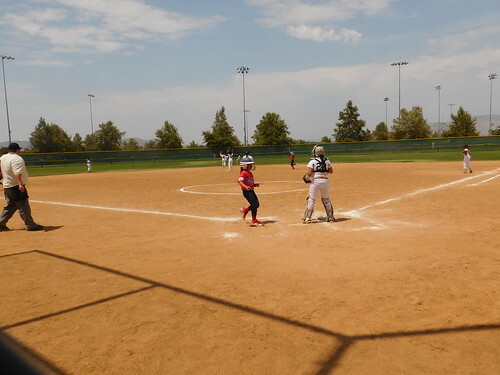 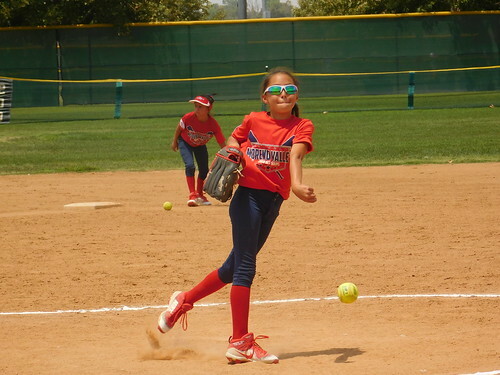 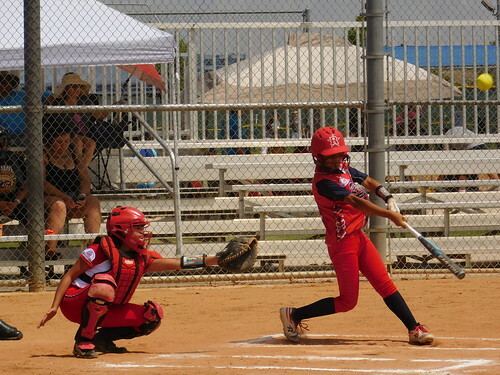 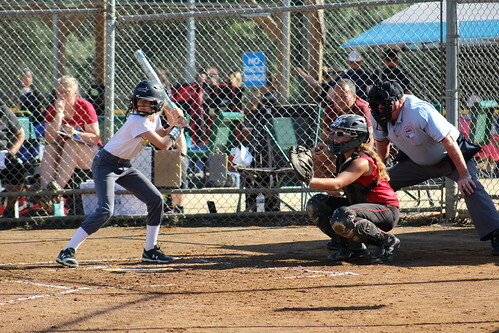 Moreno Valley, California used 12 walks to build a sizable lead and starting pitcher Ciara Overton held El Monte, California’s bats in check to win the Pinto 8U West Zone Softball World Series title 10-2. 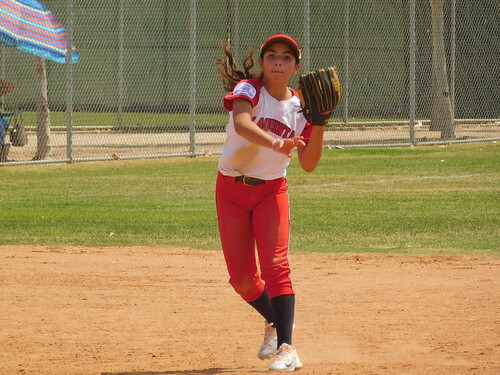 The game started off very competitively, as El Monte starting pitcher Sidney Galvan matched Overton, holding Moreno Valley without a hit and getting out of a bases loaded jam in the top of the second. 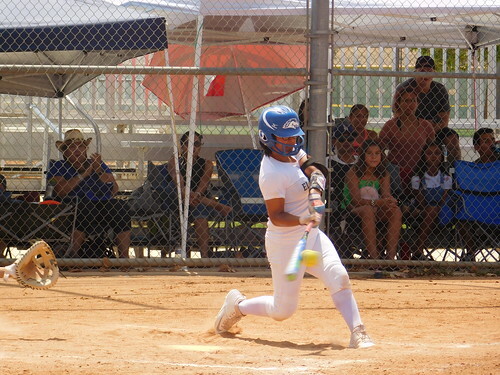 In the bottom of the second, El Monte’s Itzel Munoz hit an RBI double, scoring Sofia Gonzalez, to record the first run of the game. 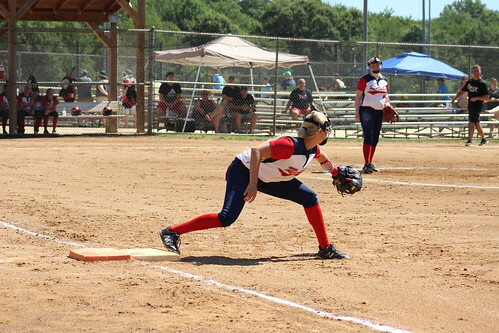 Galvan struggled to find the plate to begin the top of the third. 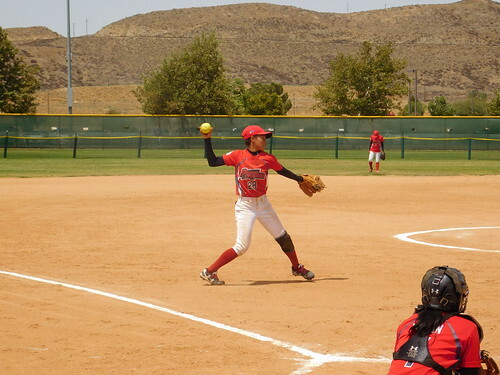 She walked the first four-consecutive Moreno Valley batters she faced, before being replaced by Sasha Rivera on the mound. 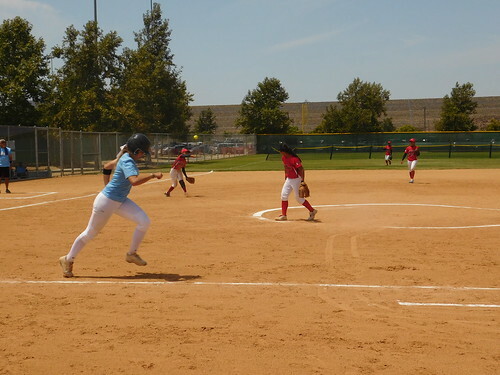 Rivera then walked the next three-consecutive batters, as Moreno Valley worked the score board to 4-1. 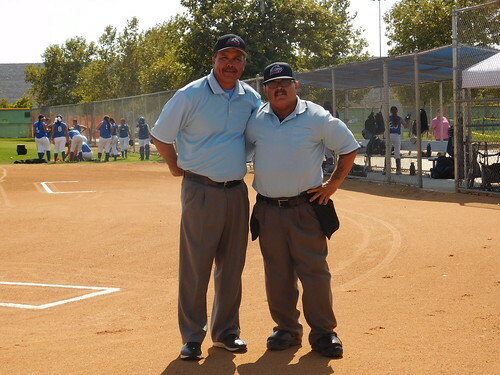 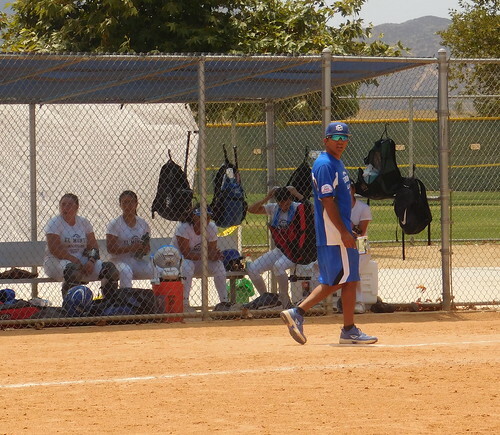 The El Monte coaching staff decided to go back to Galvan, but she hit the first batter she faced. 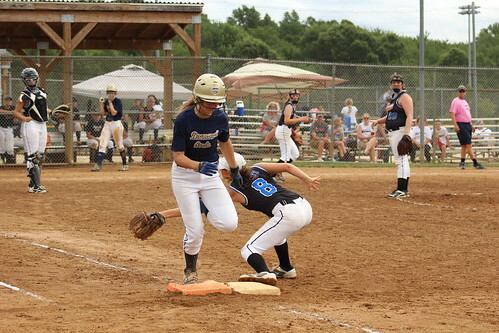 A fifth run crossed the plate, the maximum for the inning. 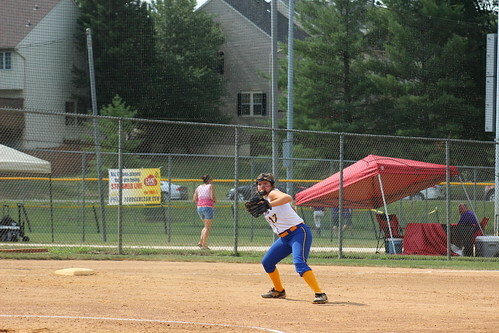 Overton struck out the side in the bottom of the third. 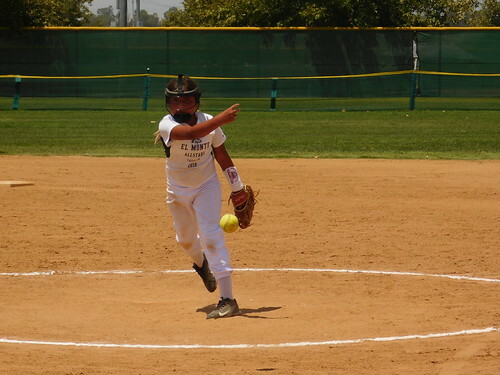 El Monte turned to Clara Villalpando as its pitcher for the top of the fourth. 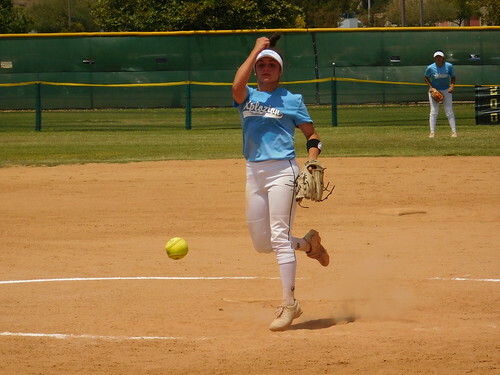 She hit two batters, before Moreno Valley’s Destiny Mendoza had the most impressive hit of the day, a fly ball to deep left field. 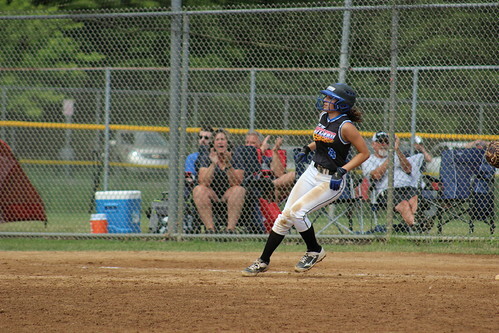 Mendoza sprinted in to third base, as her team put up its seventh run of the game (7-1). 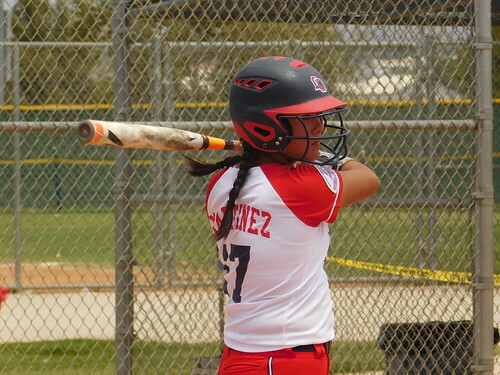 Gabriella Mercado singled home Mendoza. 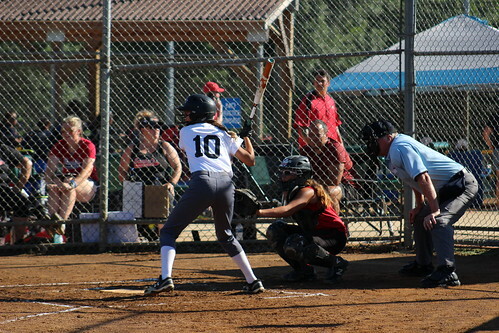 Three walks and a hit batsman later, Moreno Valley completed its second five-run inning to lead 10-1. 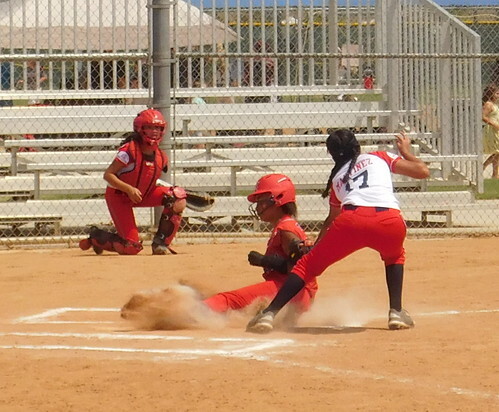 In the bottom of the fifth, Overton walked Mia Perez and later scored, after Munoz reached on an error (10-2). 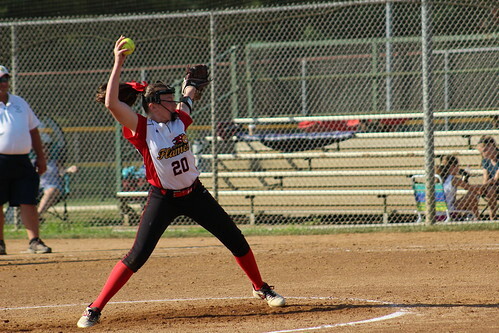 Overton closed out the game with a strikeout, as the hour and a half time limit expired, after four complete innings. 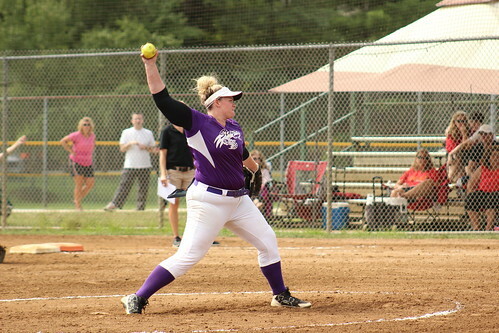 Overton racked up 11 strikeouts in her two-run (one earned) outing on one hit and seven walks. 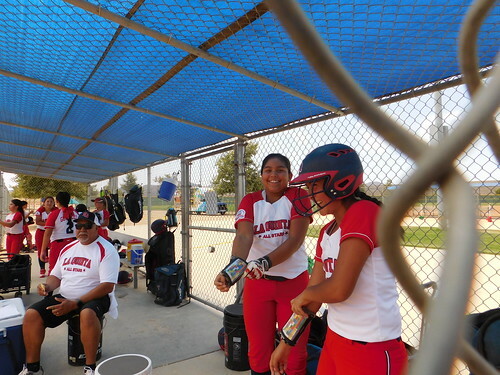 Mercado’s triple highlighted Moreno Valley’s day offensively, as she also recorded two RBI, tied with Olivia Guzman for the team lead. 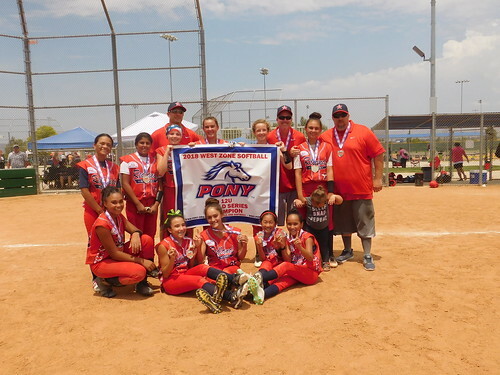 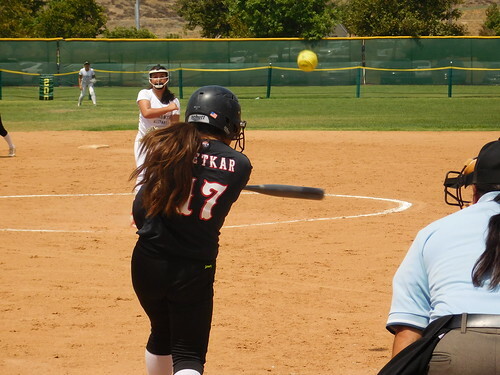 Redlands (Heat), California’s high-powered offense exploded for 15 runs on 18 hits, while taking advantage of six El Monte, California walks to win the Pony 14U West Zone Softball World Series title convincingly 15-6. 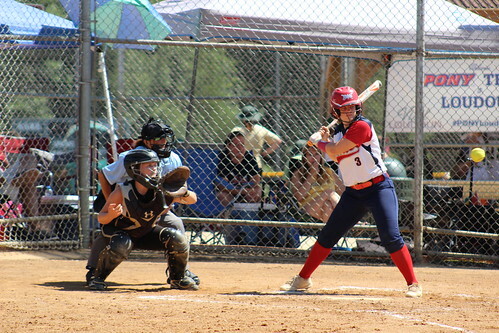 Redlands broke open the scoring in the top of the first with three runs thanks to a Kailey Sullivan RBI ground out with the bases loaded and a two-RBI single up the middle by Elleana Navarro. 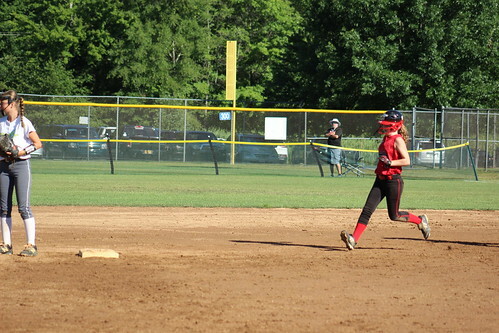 The Heat were back at it in the top of the third by scoring three again. 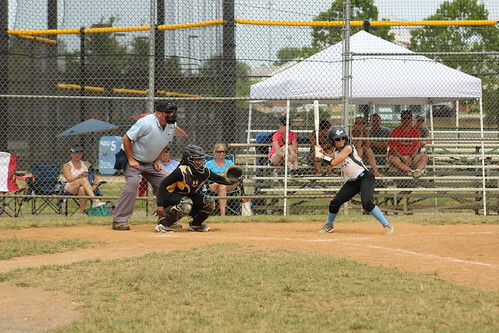 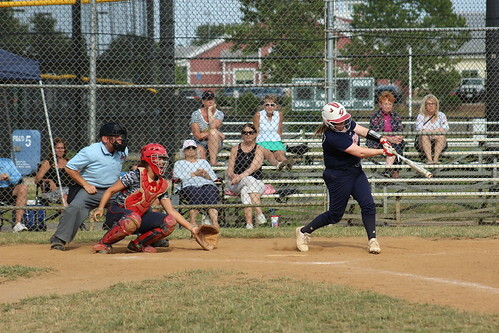 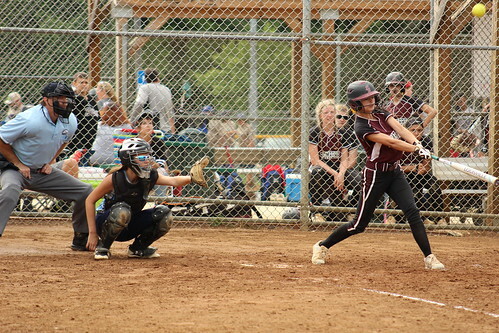 Lauren Bishop smacked an RBI double to left field, and after stealing third during the next at-bat, she scored on an Isabella Bojorquez sacrifice fly. 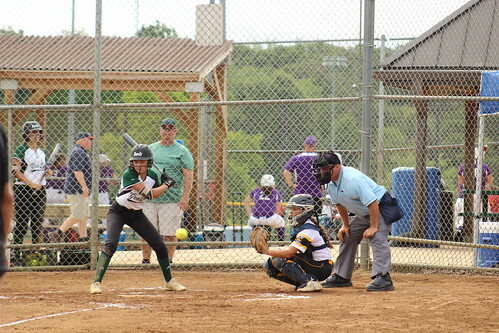 Navarro recorded her third RBI of the day, when she singled home Sullivan (6-0). 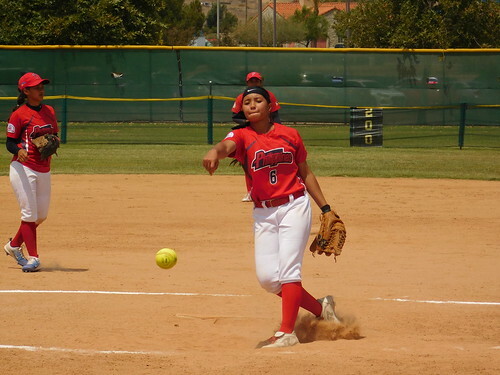 Redlands starter Rosalinda Ramirez tossed two scoreless innings to begin the game, but El Monte countered in the bottom of the third. 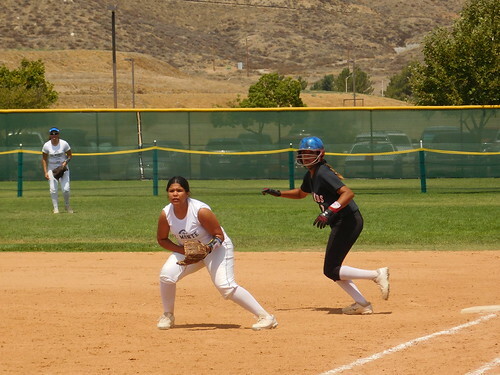 Four-consecutive base hits led to El Monte’s first and second runs of the game, and then Ana Martinez rocked a double into left field for two more (6-4). 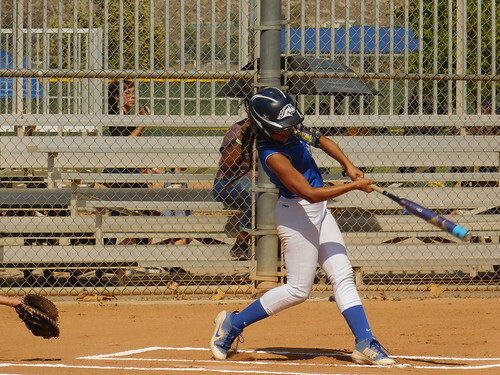 Two groundouts and a strikeout ended the rally, as El Monte found life. 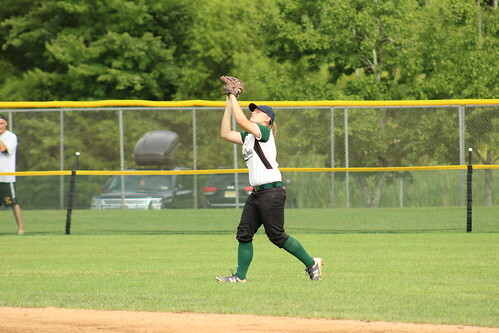 Neither side could put anything together offensively in the fourth inning. 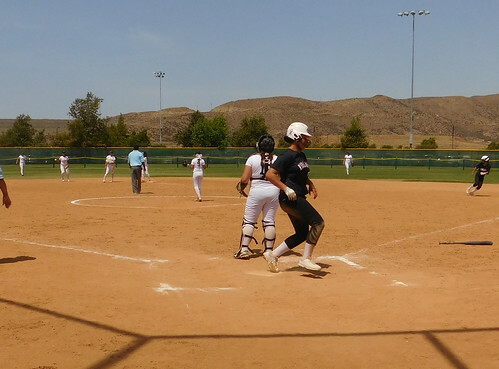 Redlands broke the game open and captured the title bout’s momentum in the top of the fifth. 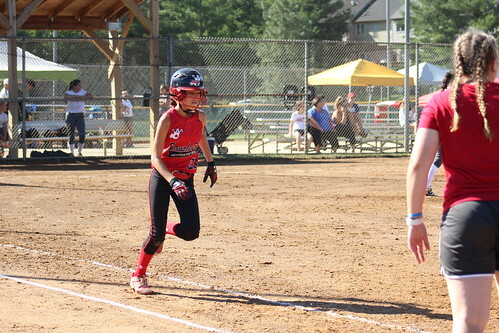 The Heat retaliated with four-consecutive base hits of their own and then a walk, which led to two runs (8-4). 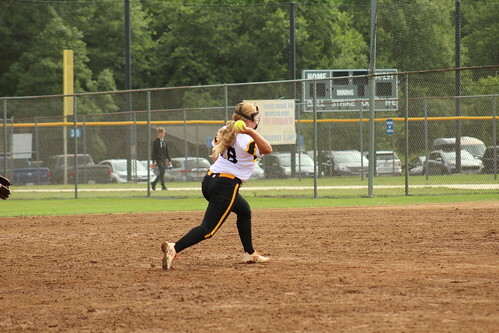 After a fly out, Madison Osretkar launched a ball into right field for a double, scoring Bojorquez and Sullivan, while advancing Navarro to third. 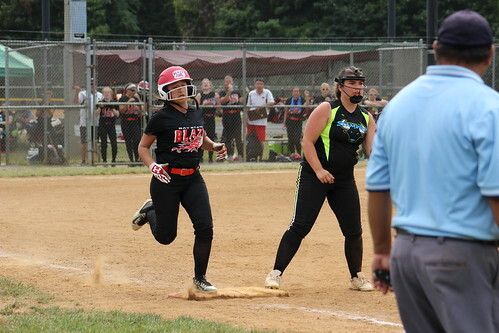 Navarro then scored on an error to put her team up seven runs. 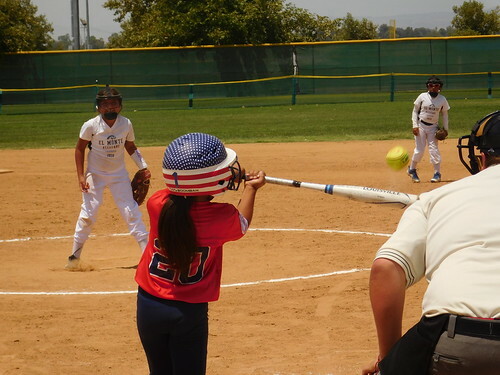 El Monte did not surrender. 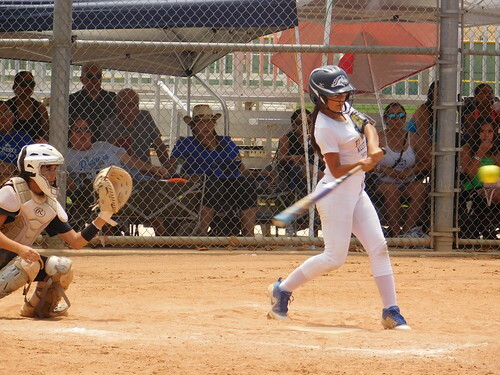 Mariah Torres knocked in Charlene Sanchez on a groundout and Kayla Leyva singled home Mia Gonzalez to cut the Redlands lead to five (11-6). 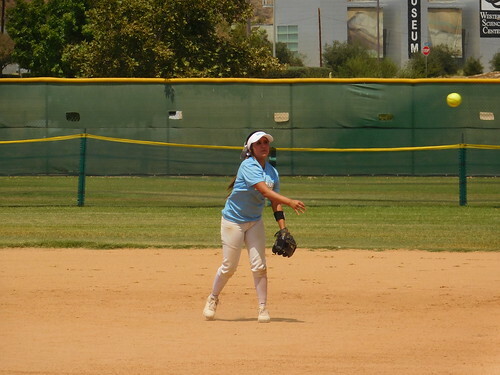 Unfortunately, that was as close as El Monte would get, as the team fell apart defensively in the top of the sixth. 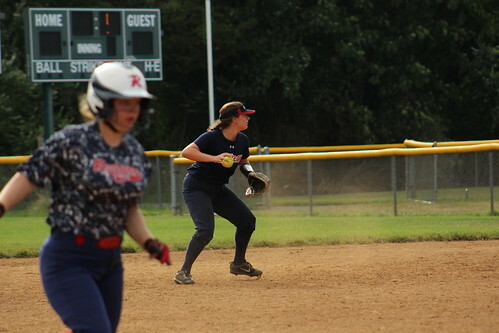 Four errors contributed toward four runs for Redlands, as the offense ran wild on the base paths. 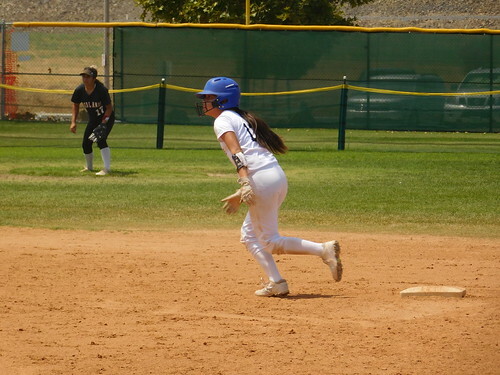 The team then held down the fort defensively in the bottom of the sixth by stranding two El Monte base runners to secure the win. 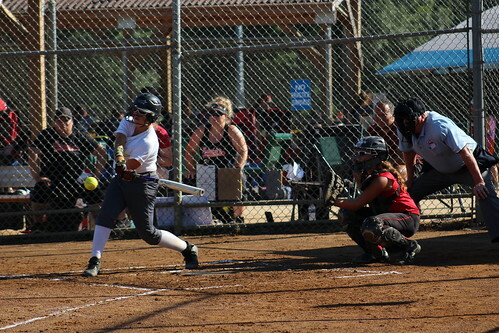 Seven batters for Redlands recorded multi-hit games, highlighted by Jayna Lopez and Sullivan, who both totaled three hits each. 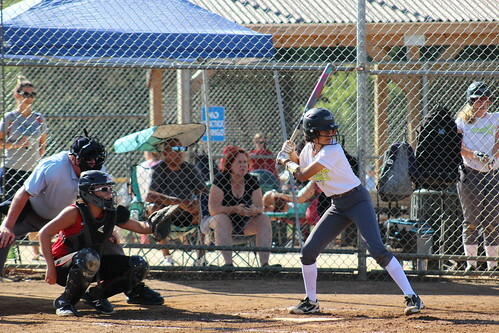 Navarro led the squad with four RBI. 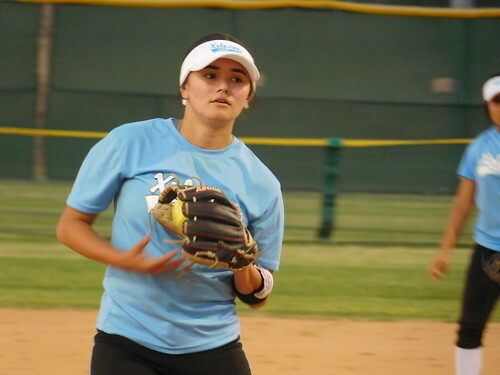 For El Monte, Gonzalez and Sanchez were the offensive leaders with two hits each. 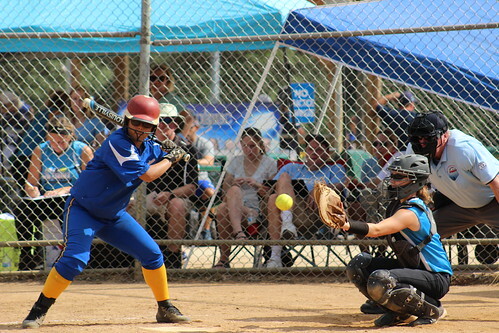 Martinez’s two RBI led El Monte. 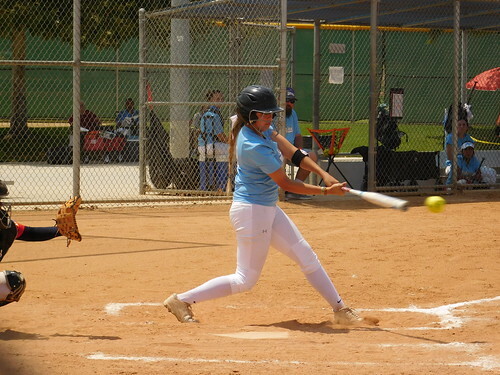 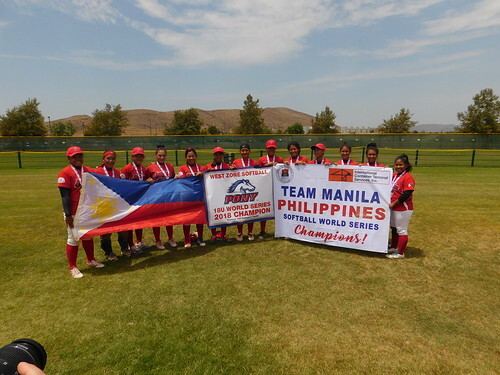 The Manila, Philippines defense, which was led by starting pitcher Alma Tauli, stifled the Hemet (Xplozion), California bats in the Palomino 18U championship game of the West Zone Softball World Series (5-1) en route to Manila winning its second-consecutive title. 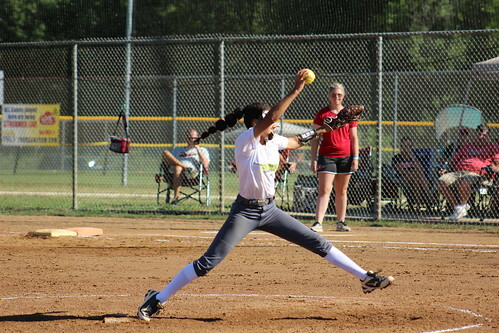 Tauli pitched a complete game (six innings), allowing just one run on three hits and three walks, while striking out nine in the win. 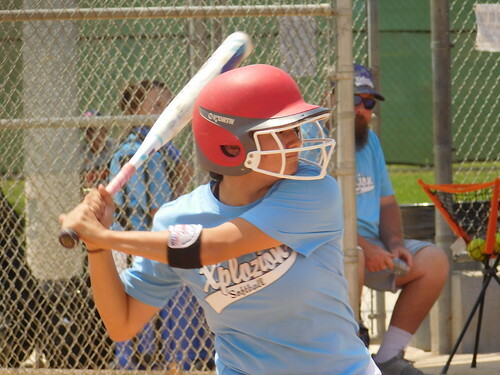 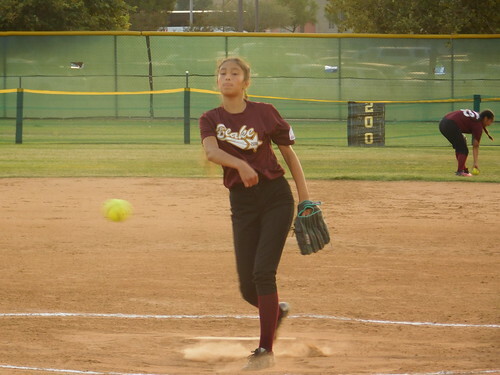 Xplozion starter Destinee Lopez matched Tauli pitch-for-pitch and out-for-out through the game’s first two innings, as the game remained scoreless. 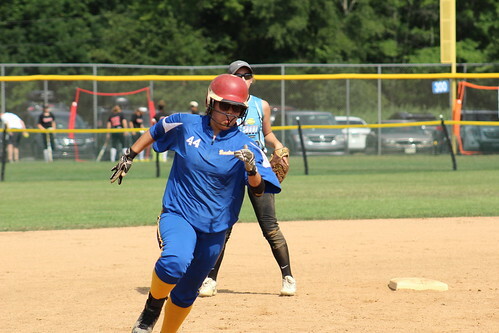 The Philippines finally broke through in the top of the third. 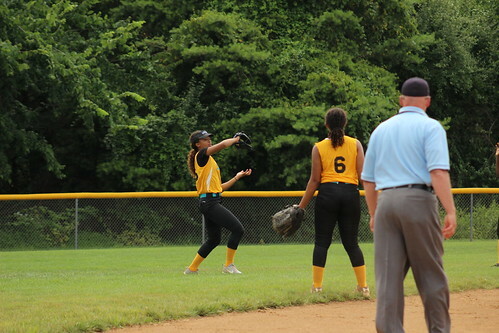 With one out, Ma Angelu Gabriel singled and was bunted around to third by Mary Maguad. 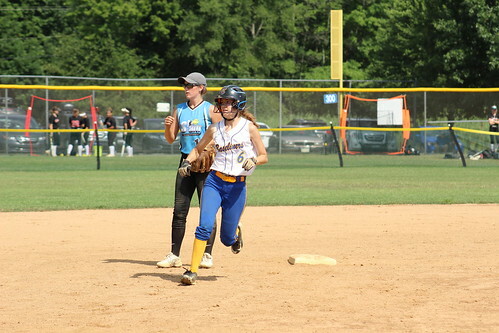 Maguad then stole second to put two runners in scoring position. 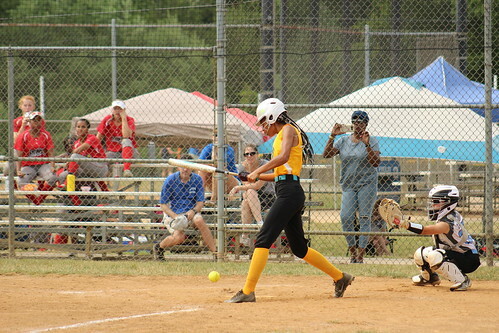 Cleofe Magsayo grounded out, scoring Gabriel, and then Alexandria Romerosalas came through with an RBI double to put the team ahead 2-0. 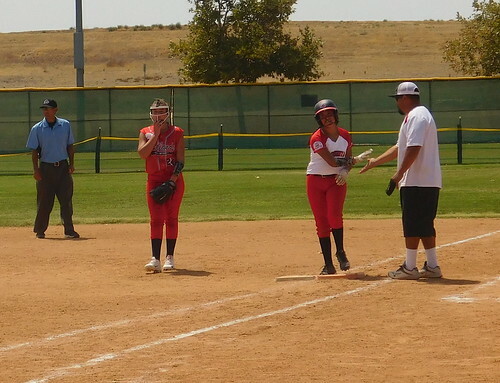 Manila took advantage of a Hemet error in the top of the fourth to score another run. 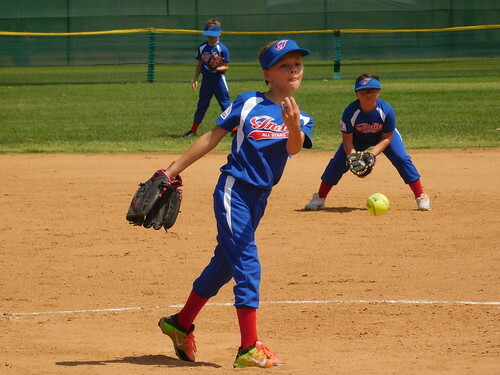 The Xplozion were able to get to Tauli once in the bottom of the fourth. 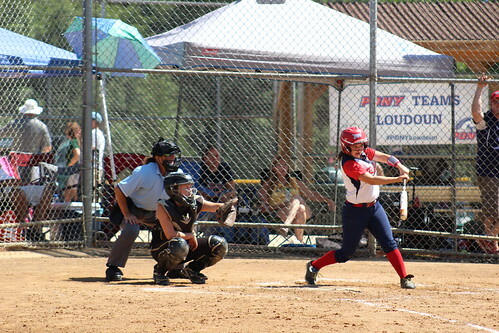 On a nine-pitch at-bat, Alaina Adkins blasted a fly ball to centerfield for a solo homerun (3-1). 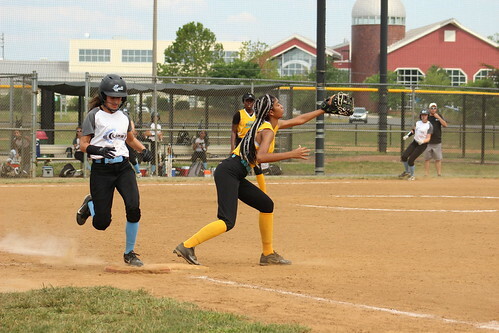 Manila got the run back in the top of the fifth, when Maguad scored on a wild pitch. 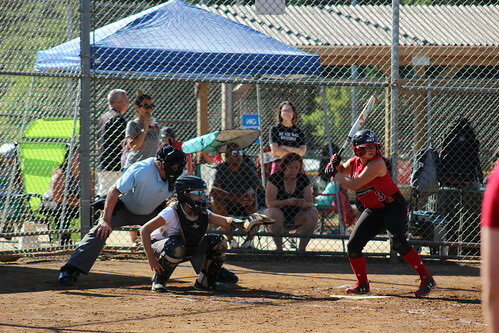 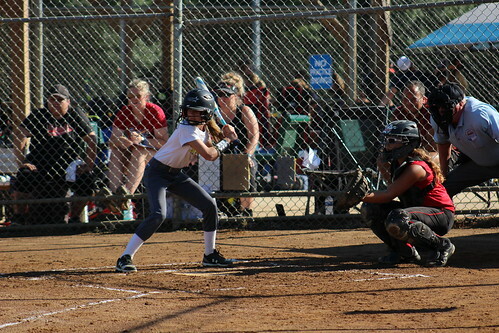 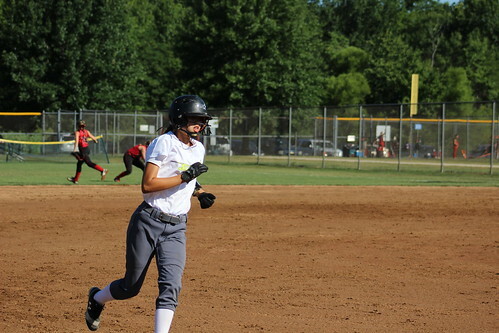 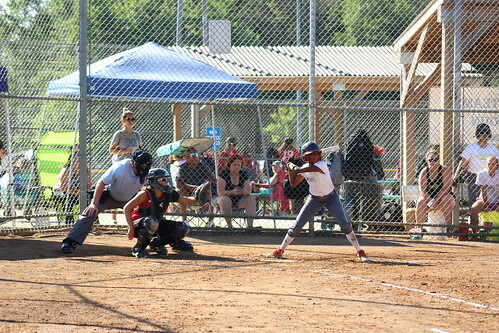 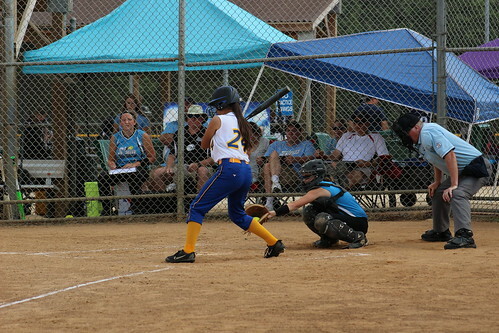 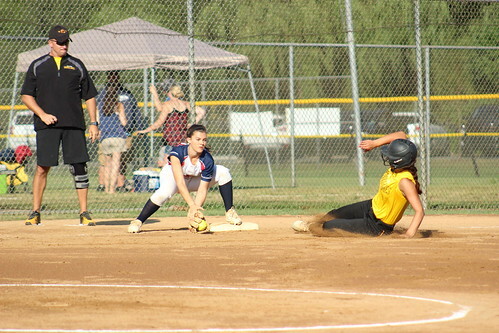 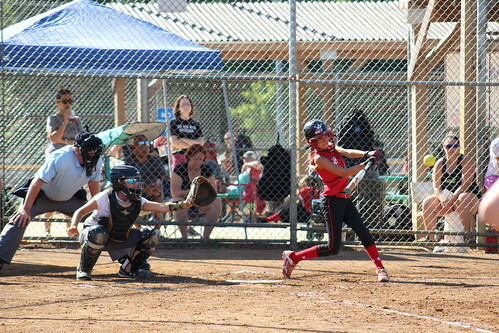 Tauli created her own run support and scored the game’s final run in the top of the sixth, when she doubled home Alaiza Talisik from second base. 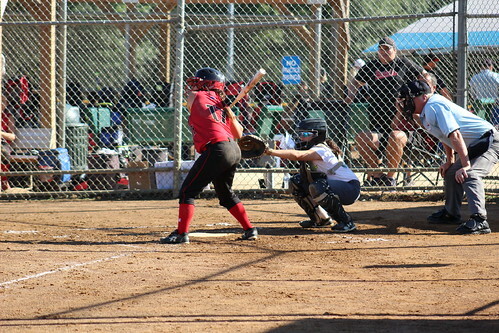 Hemet had one last chance in the bottom of the sixth, but a strikeout with the bases loaded ended the game. 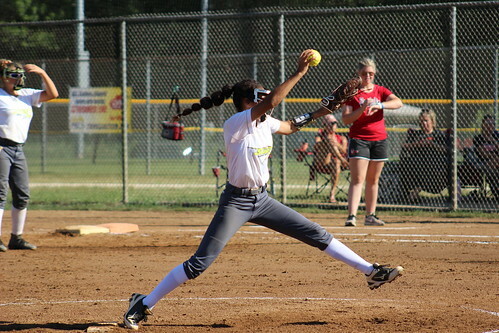 Lopez went the distance as well for Xplozion. 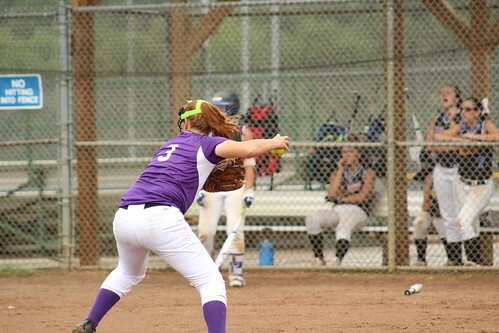 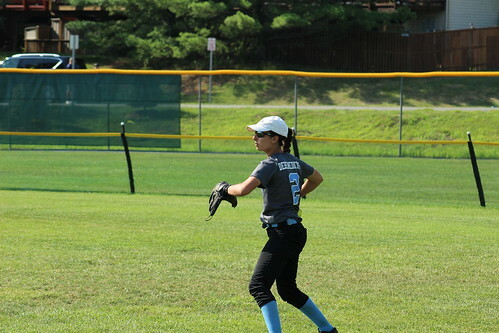 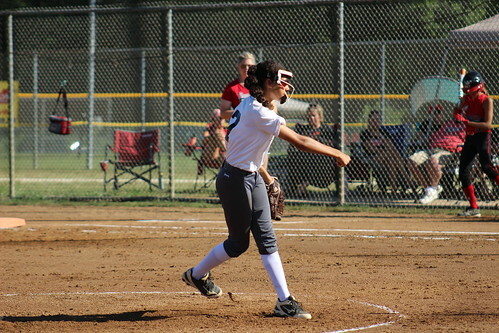 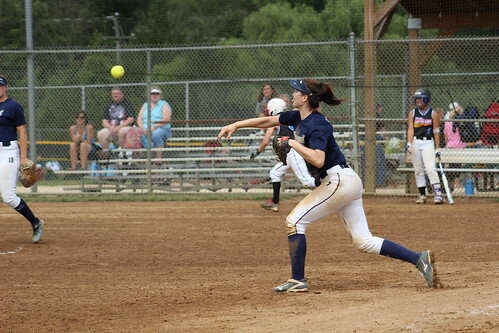 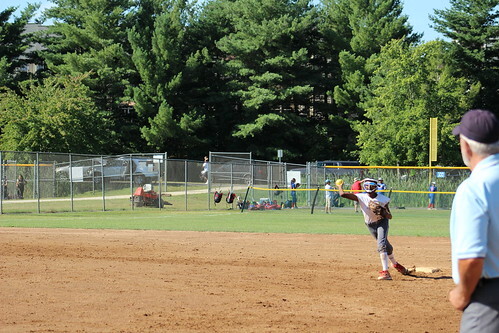 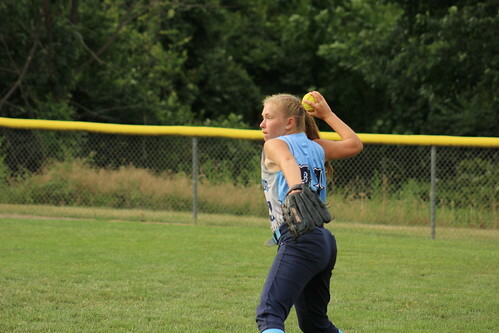 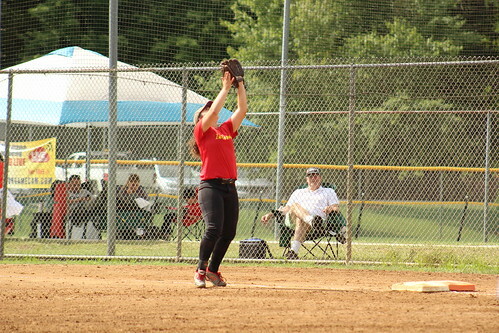 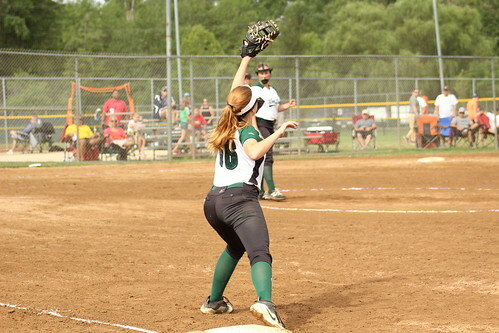 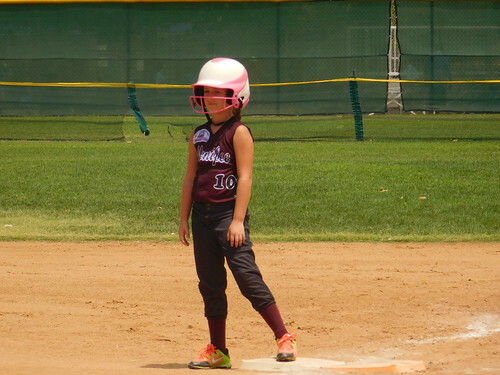 She gave up four runs (three earned) on nine hits and two walks, while striking out five. 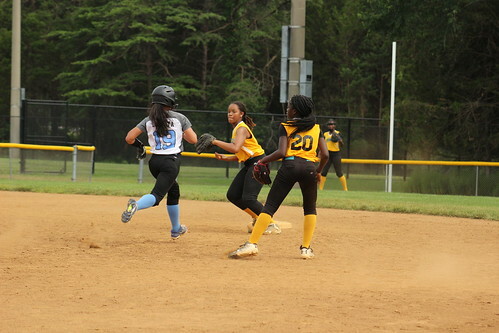 Maguad’s two hits and two runs scored was a game-high for both teams. 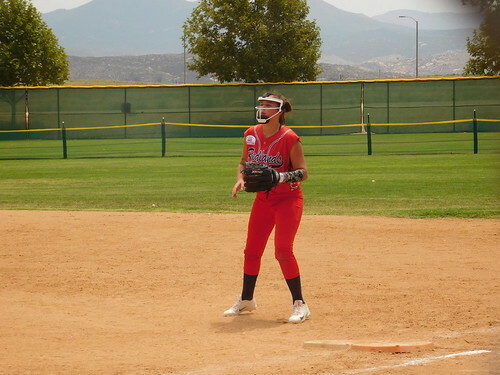 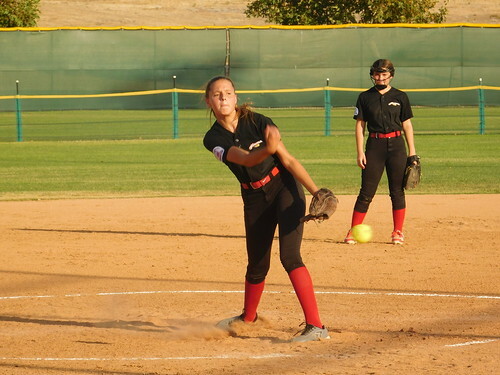 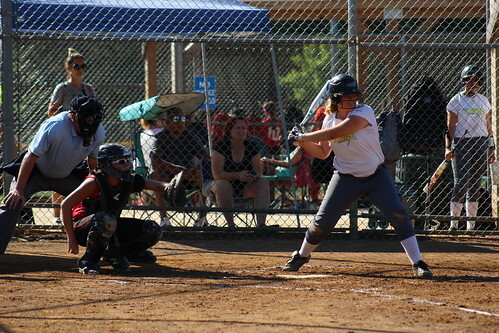 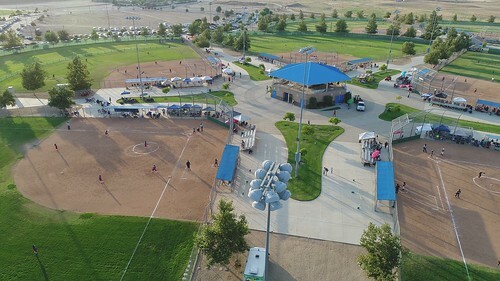 A five-run top of the first inning provided more than enough run support for starting pitcher Hughen, as San Jacinto (Mayhem), California defeated Redlands, California 9-0 in the championship game of the West Zone Softball World Series. 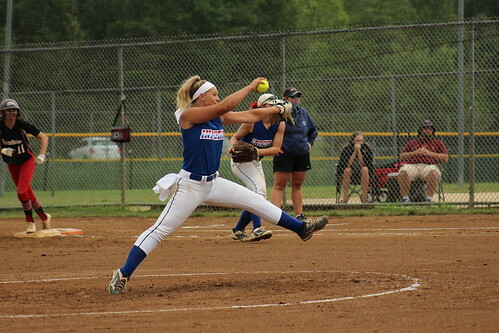 Hughen pitched a complete game (five innings) shutout, while allowing just one hit and striking out nine in the victory. 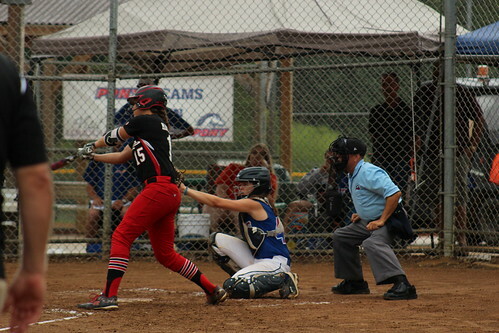 Hughen broke open the scoring in the top of the first when she knocked an RBI double to left field. 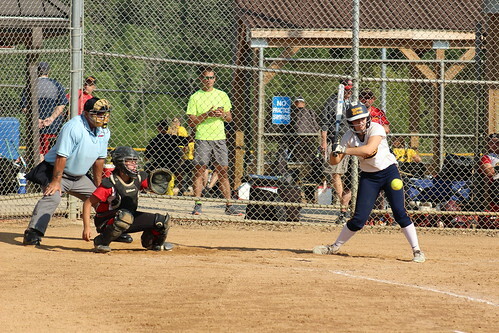 She was followed by Lara, who recorded herself a two-RBI double, before advancing to third on Braun’s single up the middle. 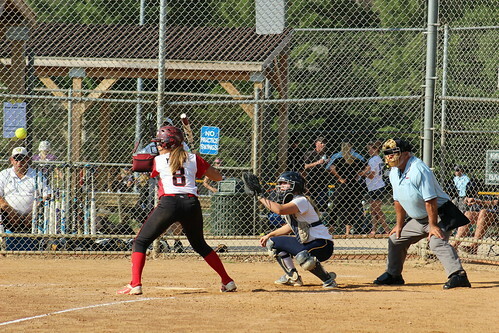 Cervantes grounded out, scoring Lara and putting Mayhem up 4-0, before Sanchez doubled on a pop fly to center field that allowed Braun to score. 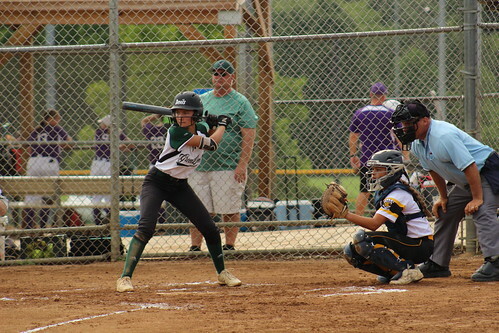 An RBI single by Cozart and a two-RBI single by Braun gave San Jacinto three more runs in the top of the fourth, and in the top of the fifth, Hughen singled with runners on second and third to give her team a 9-0 lead it would not surrender. 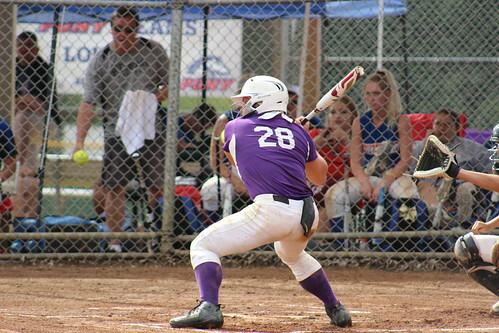 Offensively, Hernandez went a perfect 4-for-4 with three runs scored to lead Mayhem, while Hughen went 3-for-4 with two RBI. 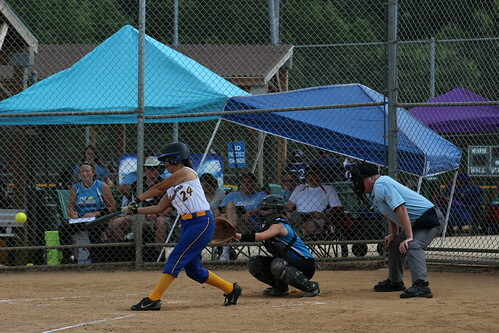 She, along with Lara and Braun, tied for the team lead in RBI.